Before we get to the fun screenies, I’d like to give you a little bit of history (as that’s what my college degree is in). I’ve been a Tolkien fan since I was in single digits *mumblemumble* years ago. I also get my love of history and lore and cartography because of the good Professor, and his elves are always the ones I like reading about or seeing depicted in games and art. 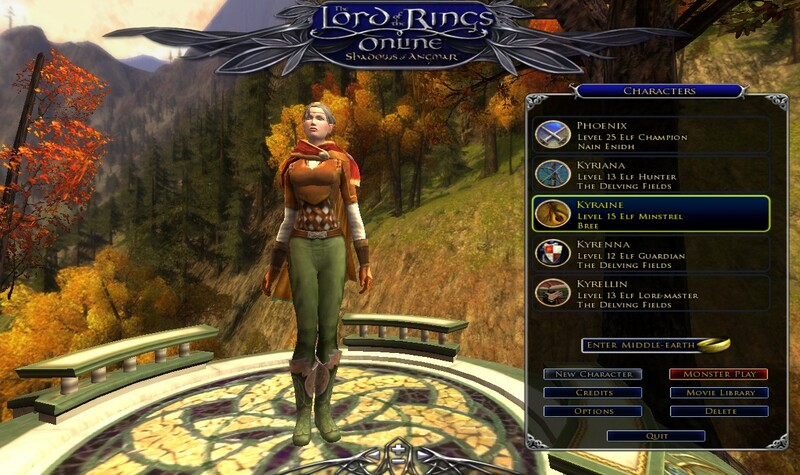 I was a newbie MMO player in 2006 when I first heard about Lord of the Rings Online. Previous LotR or Hobbit-themed games were okay, I guess, but the chance to actually play an open-world MMO based on the series and have it be serious and close to the canon? I could visit Bag End? I could be an Elf from Rivendell and hang out with Lord Elrond? Sign me up! 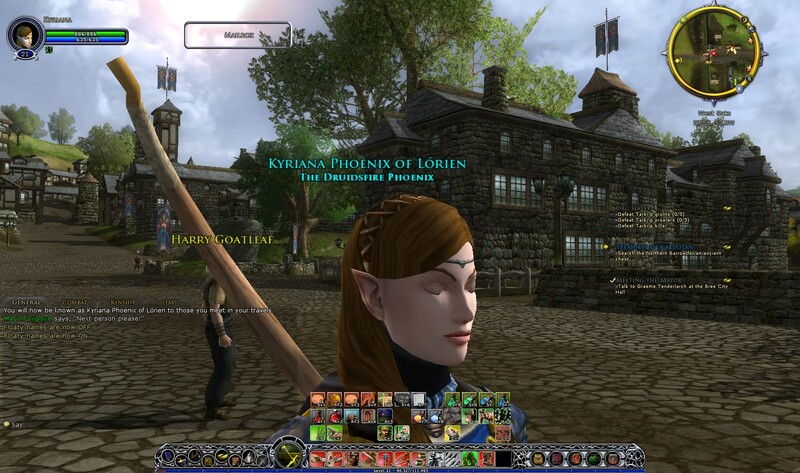 Okay, so I missed out on those very early days before launch when the game used to be known as Middle Earth Online, but I did buy LotRO when it was first available for public purchase and was getting ready to be released. My account dates from March 14th, 2007, and the number of items in the Game Version History list on my account page is simply ridiculous. I was also extremely fortunate to have had the wherewithal to pony up the $200 USD for the lifetime subscription when that was offered early on. It was a risk, certainly. 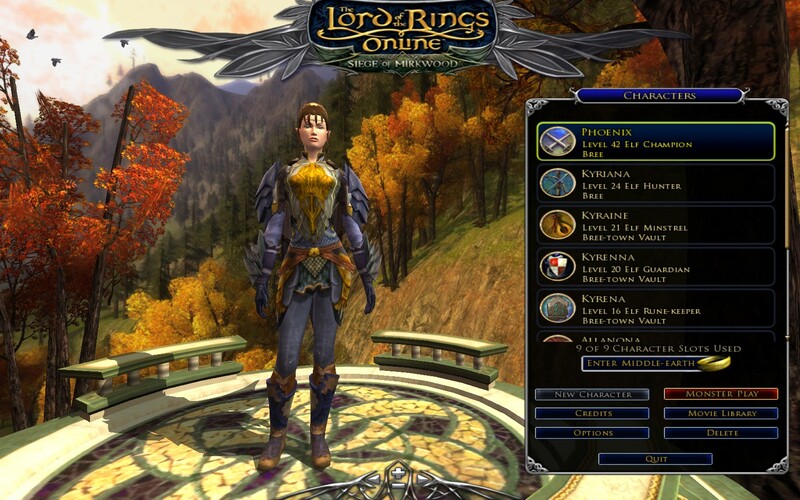 No one knew if a LotR-themed MMO could make it versus the powerhouses that are still crushing subscription numbers to this day and have been around even longer. While the Peter Jackson movies were still fresh in everyone’s minds, we were pretty clear on the fact that this game wasn’t going to be a parroting of the movies. The big concern of course would be whether players coming in hoping for something of that nature would be turned off at the back-to-canon approach the Turbine developers had taken. Players who had only seen the movies would have no idea who Tom Bombadil was or why his boots had to be yellow, for example. Needless to say, I can still regard that lifetime subscription as the best investment I have ever made in a video game. Now, let’s get into the screenshots. For the sake of organization, I grouped everything into categories mostly based on location in-game and will be presenting them more or less in the same order as you’d travel through these lands, so it will resemble the journey taken in the books. At the end, I’ll show you some things that don’t entirely fit. I will also admit that I did go back in a few cases to get fresh screenshots with better graphics settings than the ones I had available to me back then. For the vast majority, however, these are the original screenshots. My first one dates from April 21st, 2007, just a few days before official launch of April 24th. I’m somewhat ashamed to say that as a newbie MMO player, I was entirely unaware that you could hide your UI for an embarrassingly long period of time. I remember ensuring I preordered so I’d get that few-day Open Beta and run in there and feverishly create characters with my favorite name. The login turnaround times (30 seconds back then!) and the number of servers ensured that I’d only get to get my favorite name on the first server I got in on, and I did, RIP Silverlode. Back then, the starting instances were much longer and a bit different from the ones we have now that can be completed in less than an hour. For example, in Thorin’s Gate, your primary enemies outside were goblins, and the Dourhands hadn’t been building dangerously rusty structures across the river. The cave where you find Elladan was at the top of a long path up that mountain. There are still hints to some of that early content in-game, with my favorite being the reference to Old Bloodtusk from the Archet starting instance as a play that is canceled in favor of the Mad Baggins play in the theatre during Yule Festival. Also, the gear that dropped in each starting instance matched your race’s overall style, and heavy armor wearers such as champions started out with medium armor, as you can see here with my babyfaced first character ever in this scene from Celondim. The astronomy nerd in me was positively delighted to see that the devs included two well-known constellations and one famous asterism in the game (Orion, the Pleiades, and the Big Dipper/Plough respectively) because they’re in-canon for Lord of the Rings. In fact, a couple of years ago, I gave a lecture on this very subject whilst streaming a freezetag game with my kinship in the Bree-lands. 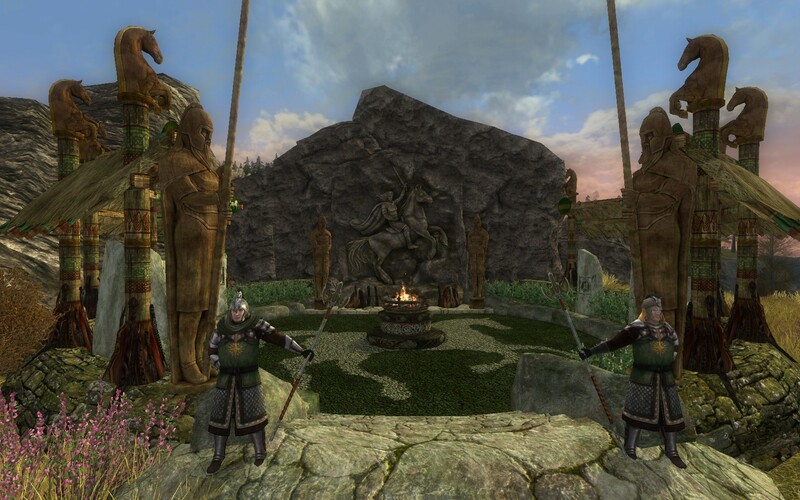 Since I’m an elf-nerd, my tour here starts in Ered Luin, the starting area of the elves and dwarves. 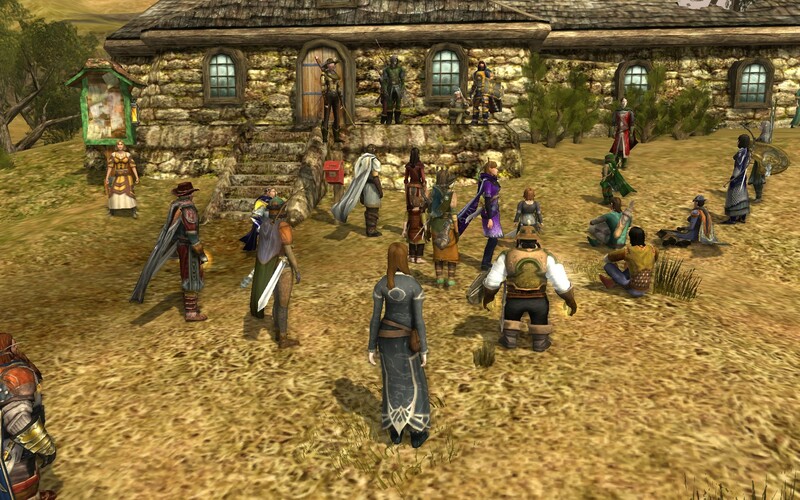 Can you imagine a LotRO without housing? Well, it wasn’t a launch feature. 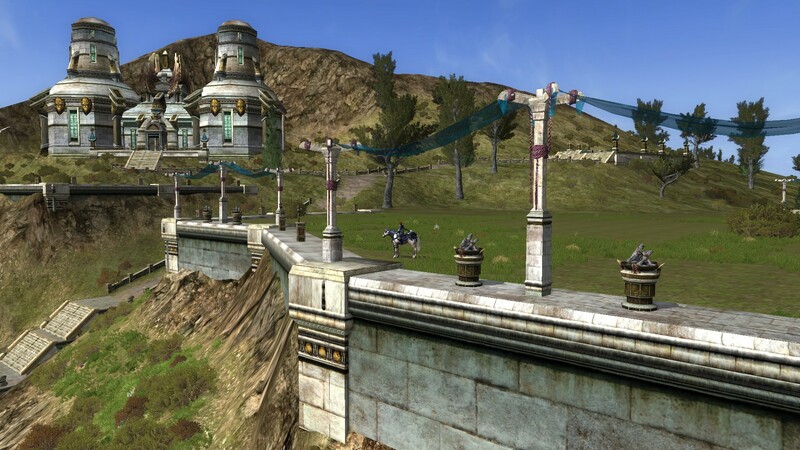 I remember looking out across the river in Celondim and seeing lovely structures but you couldn’t go there until the housing update was added in October of 2007. Due to the cost of purchase and upkeep, which at the time only let you pay up to a month in advance, I never actually bought a house for some time afterwards, and it was only after one of my kinmates who happens to be one of my coworkers IRL talked me into it. However, when I made the jump, I found what I considered to be the most beautiful house in the Celondim neighborhoods. To this day, I still maintain ownership of 4 Waterbank Road in one of the instances on Crickhollow (originally on Silverlode). Speaking of Celondim, did you know there’s a lovely stage up the hill from where you emerge from the starting instance? Yep! 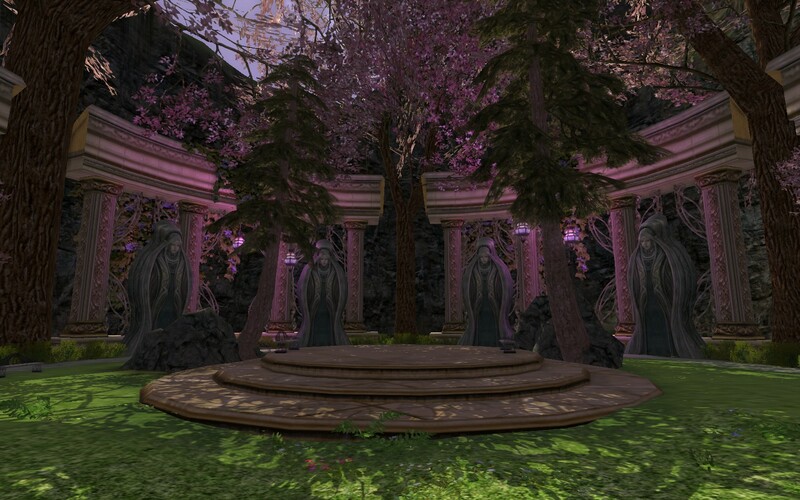 Four elven statues practically loom over this stage in the round, and I’m actually a little sad that it doesn’t see more use, because it looks perfect for any of the many bands scattered across the servers to hold a concert. 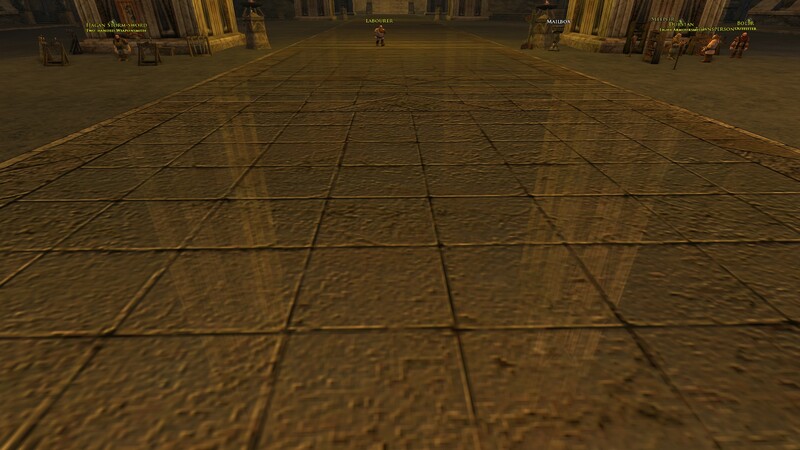 So, why did I show you a picture of the floor in Thorin’s Hall? It’s because I’ve always been fascinated with the tech in the game that generates reflections like this highly polished floor. You’ll discover it all over the game in various places, but this is the first one many players will find. I love the Shire. There’s something perfect in how the developers captured the spirit of this land and its silly inhabitants in the questing in-game. To this day, many players mock the pie-baking abilities of Holly Hornblower, but running her pies all over the Shire or delivering the post is so perfectly in-character for what we know in the lore of this place. This screenie is from before the dev team redid the draw distance options recently, so of course it looks different now with more buildings and landscape filled in. 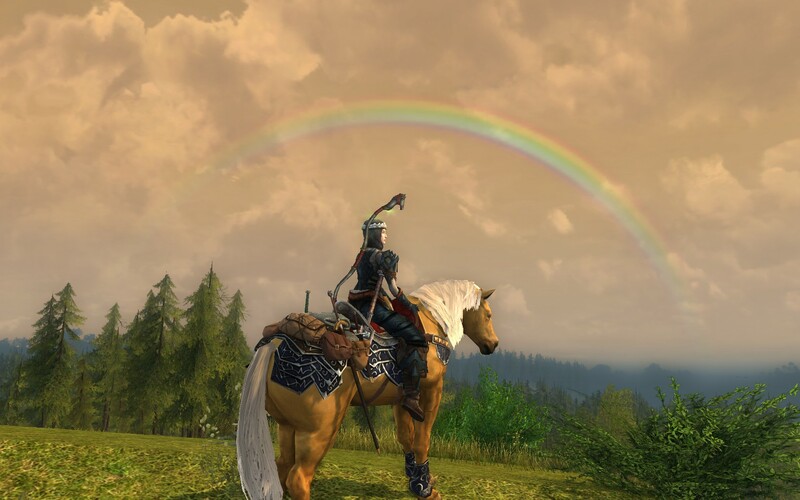 The Shire also features the only place in the game where you can (legitimately) see a rainbow every day in the afternoon. Sure, it’s a little far-fetched that there would always be a storm passing at just the right angle to generate a rainbow but who cares, it’s lovely. Now, I said legitimately in parentheses because after 10 years, I have finally experienced infamous the Eregion Rainbow bug ™ just the other day. It was gorgeous even though it was a bug. I hope SSG never fixes it. The Shire is also home to the not-really-canon but thoroughly cool Haunted Burrow. 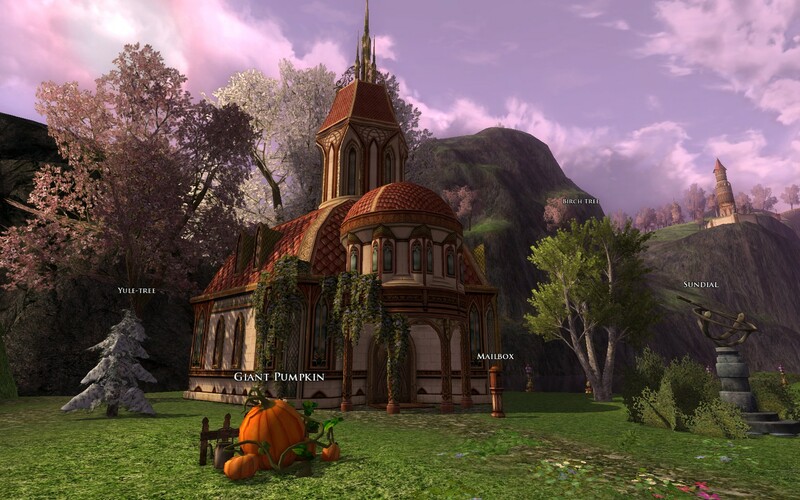 During the annual Fall Festival that starts in October, players can unlock access to the burrow under Bag End and do some thinly-veiled Halloween-themed quests and loot some chests. One of the chests has a 24-hour timeout and a very low chance to drop the Aged Deed which can be redeemed for the Painted Skeletal Steed or Pony. The Haunted Burrow itself is decked out in the kind of decorations that you’d expect to see if Hobbits actually celebrated our real-life holiday. It’s a bit silly and almost canon-breaking but light-hearted fun nonetheless. My intention was to avoid the pile of screenshots with the UI still up, much less one where my character looks like a fool, but I want to draw your attention to the background. Notice the vast difference in the bank behind her? Once upon a time, the Vault-Keepers in Bree had a much smaller building with no auctioneers or mailboxes and only one entrance on the side close to the forge. As you can see here as my character takes terrible selfies, there’s an awful lot of open space. Now, Bree looked a lot different back in the day. All the merchant stalls near the Ironmongers’ Gate weren’t there, and next to the bank there was a random house you couldn’t go into. There was a shade that only appeared at night near the auction house in South Bree who sent you on quests into the Barrow Downs, so if you were wanting to do his quests during the day, well, you had to wait. *check watch* Waaaaait for it. Back in 2012, a dev who went by the handle Scarycrow went in and revamped Bree and Archet as a personal project in their spare time. Above, you can see a before and after shot of the same place near the West Gate, with Andrew Oakhurst keeping the faith by sticking to his post throughout the past decade. Good man. Notice the fine details that show how the artists stepped up their game over the years. See the plants sticking up out of the revamped wall and the puddle of water on the cobblestones? I normally like to turn off floaty names while I’m taking screenshots of group events, but sometimes I also like to see just how many people are around. 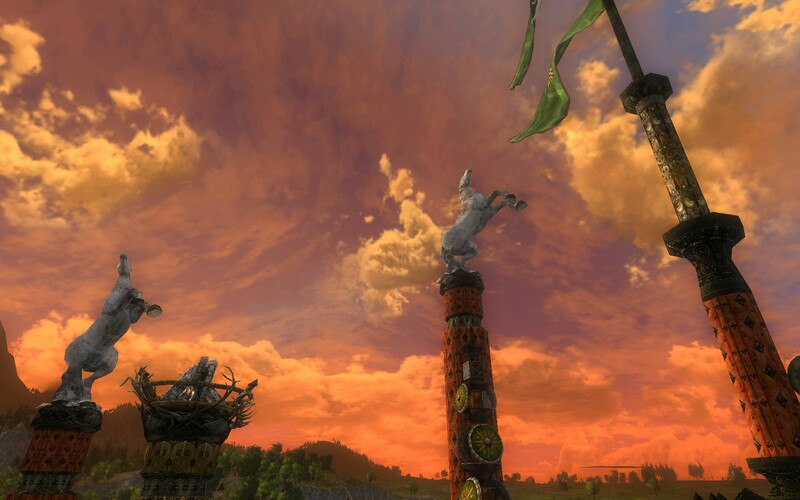 This one was taken during the summer festival some years ago, where a lot of players were following the NPCs’ instructions and creating beauty in the sky. 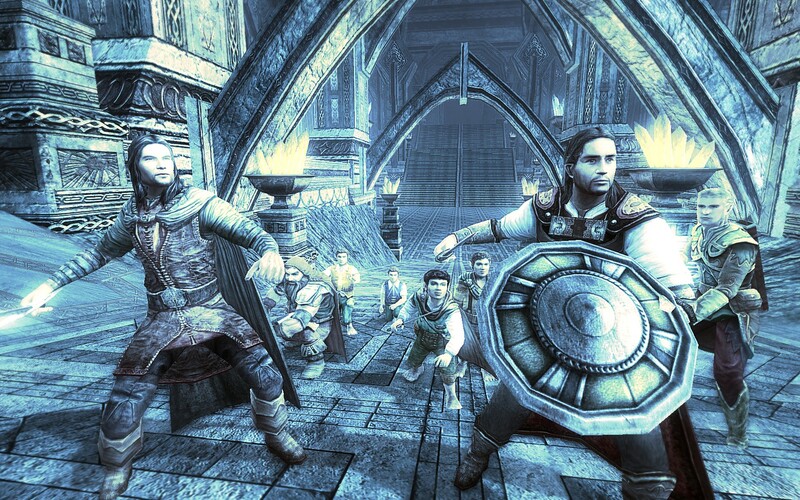 The King’s Pass used to be the usual way most players first entered the Evendim area. 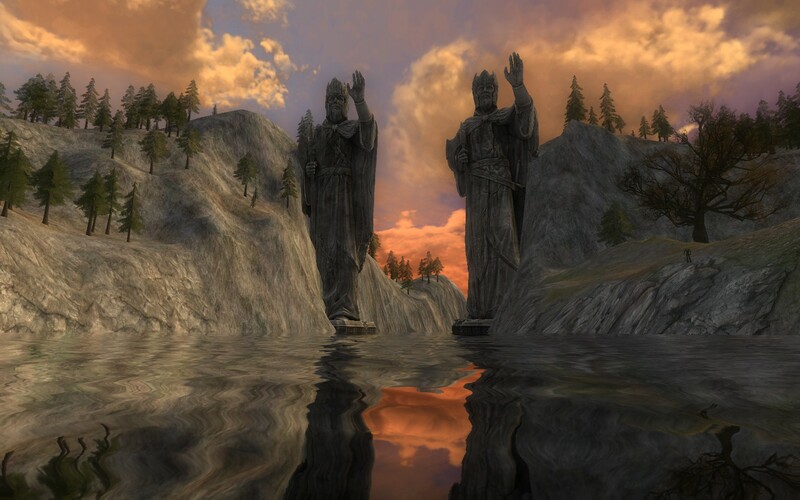 I always found it fascinating to see the roughness of the stonework here versus many other colossal statues of Elendil you can find in-game. 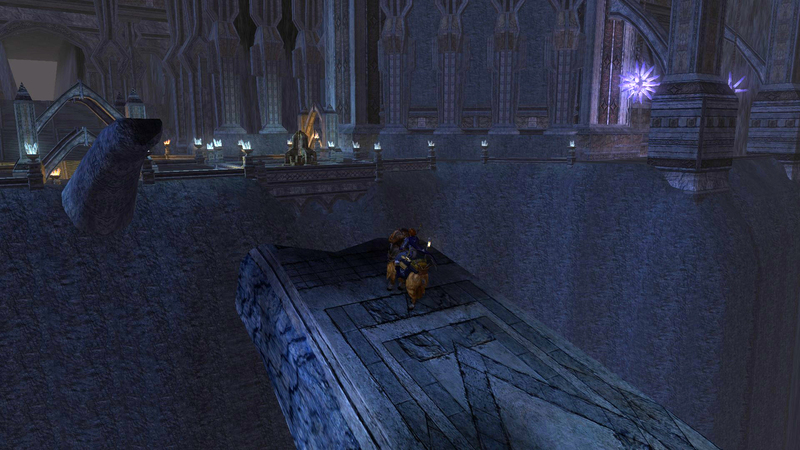 It wasn’t until some years after the game launched that there was a stable-master located on the bridge and quests were redesigned to be obtained and turned in at the feet of the statue. 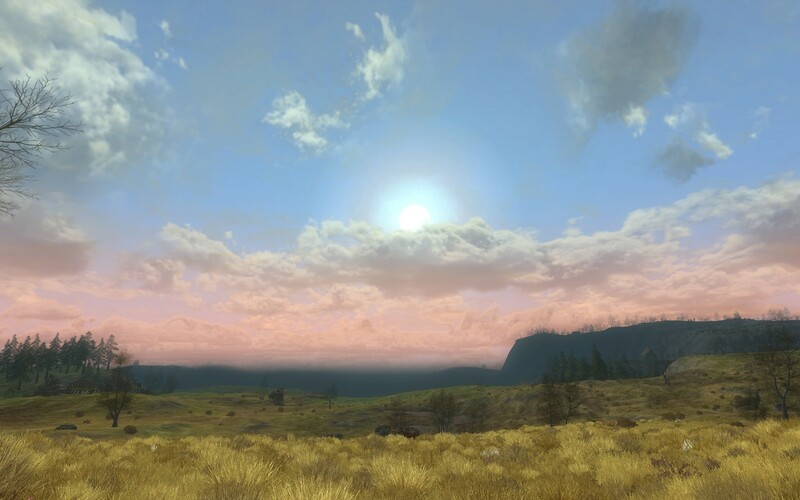 Evendim is one of the lovelier areas in-game, often showing a bright color palette and having gorgeous atmospherics like the sun in the clouds here. And of course, there’s much to be said for the graphic design of the actual lake’s waters. 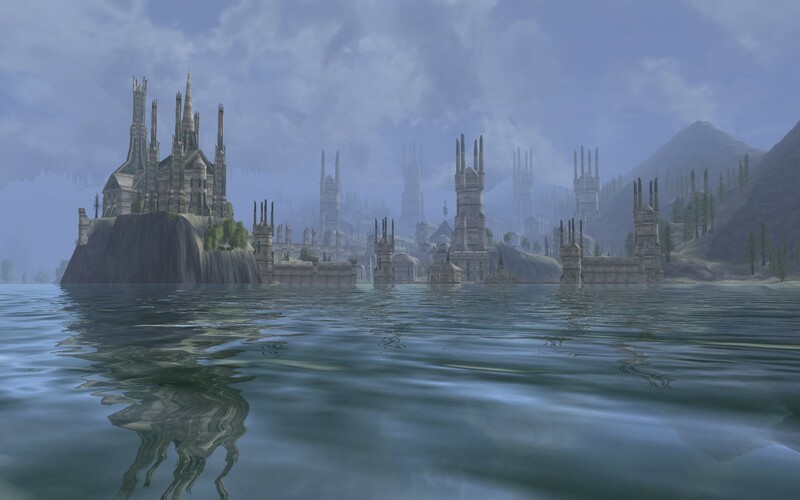 The city of the High King of Arnor, Annúminas looks beautiful from a distance with its curious four-pointed towers, but much of the city is actually flooded. From this distance, it doesn’t look so fell a place to visit, does it? The delightful atmospherics in the game have always been top of the league in game development. 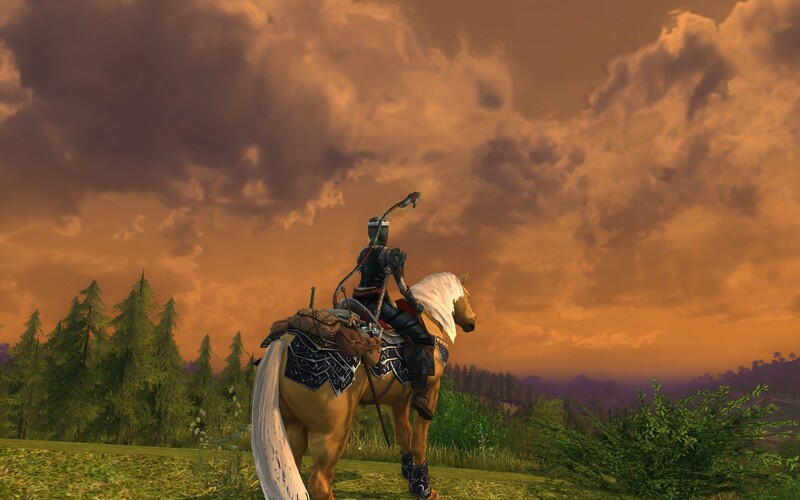 It’s only now in the past couple of years that other similar games have caught up with LotRO and its stunning skies. 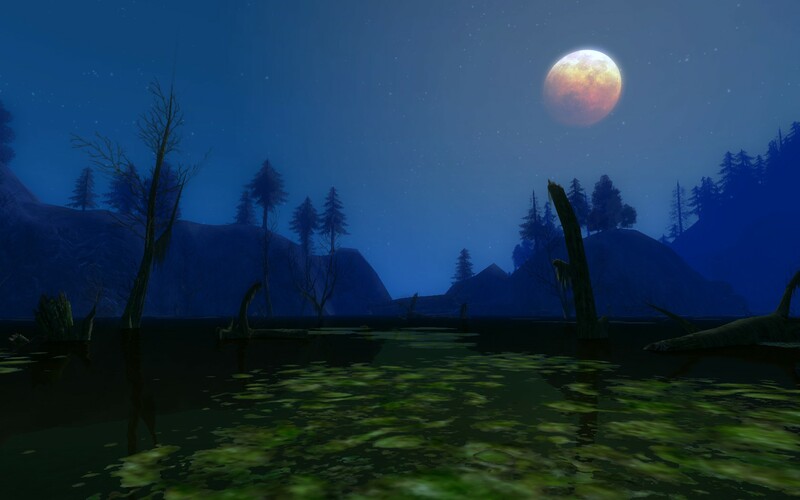 Here’s a shot of Evendim (aka Lake Everswim) as dusk is falling with the moon rising over the islands. The richness of the colors is magnificent and certainly merits the Sindarin name for the lake, Nenuial, the Lake of Twilight. Evendim also sports one of the most beautiful instances in the game. 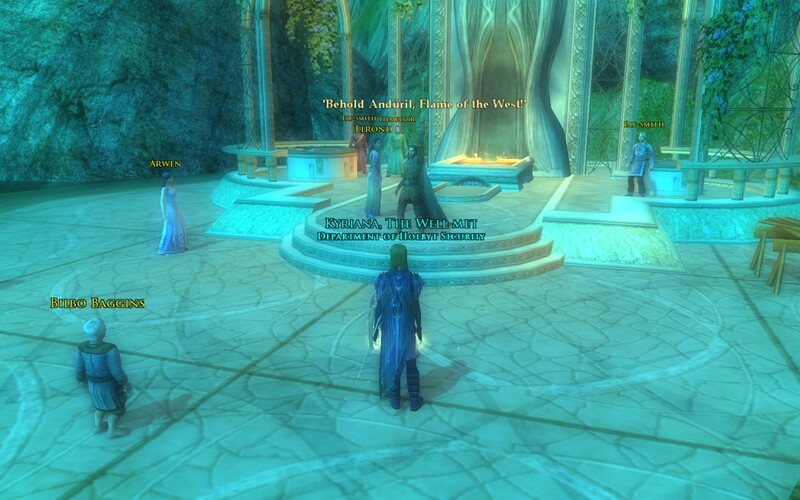 I was actually shocked the first time I went into the 6-person instance in Ost Elendil. Usually, many gated instances in MMOs will have interesting architecture and colors, but this was truly stupendous. Look at the richness of colors even thousands of years after the city fell into decay and flooded. 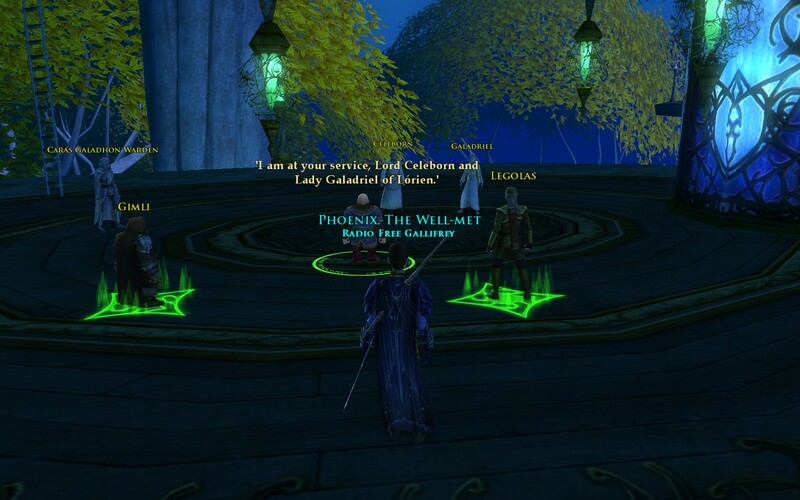 It’s a shame that it’s in a fellowship instance, because I had no idea this existed until recently when I accompanied a few Mythgard kinmates through it (and a very naughty hobbit named Gryfflet sat on the throne of Arnor when we were there). There is more to the North than just Evendim. 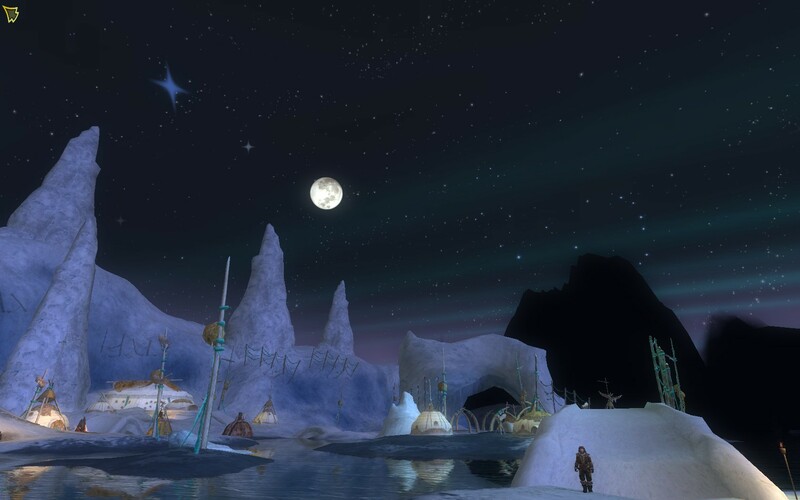 The epic questline will take you even further north to the snowy lands of Forochel. I remember the first time I went there and thought it was normal to not be able to see anything, like the land was shrouded in fog. Yep, back in the day it was far more common than now, but often players would get a bug that would cause their client to not display most of the landscape around them. 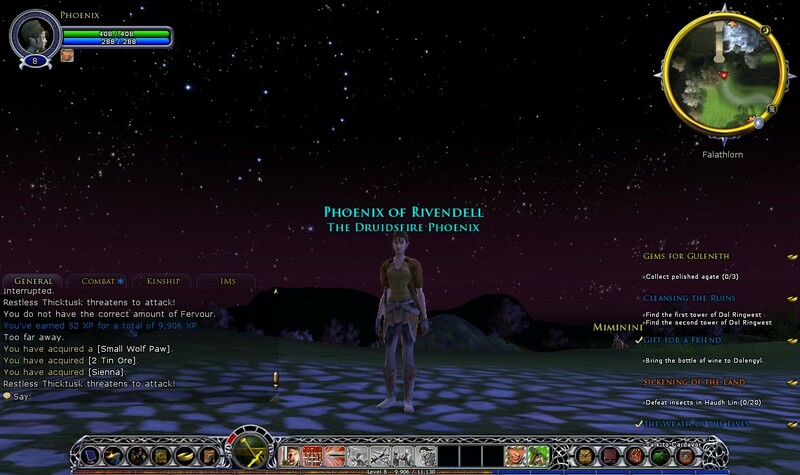 However, this screenie is of the main village of the Lossoth, where you can see the hints of the aurora borealis. You can also see the very deadly water that is unwise to dip your toes in. So far in all the years I’ve been playing, I have yet to accidentally fall in. That probably means I’ll wind up doing that next week. Here’s a posed shot of the aurora over Forochel. 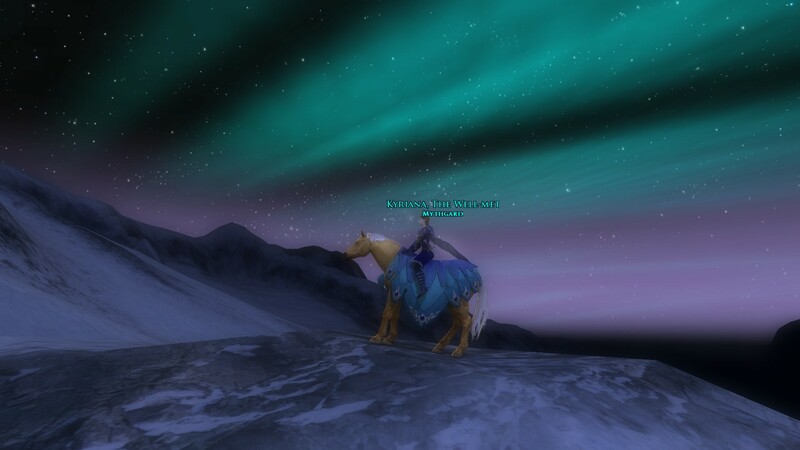 I like this one because the elegant blanket on my warsteed actually goes well with the lovely colors in the night sky. 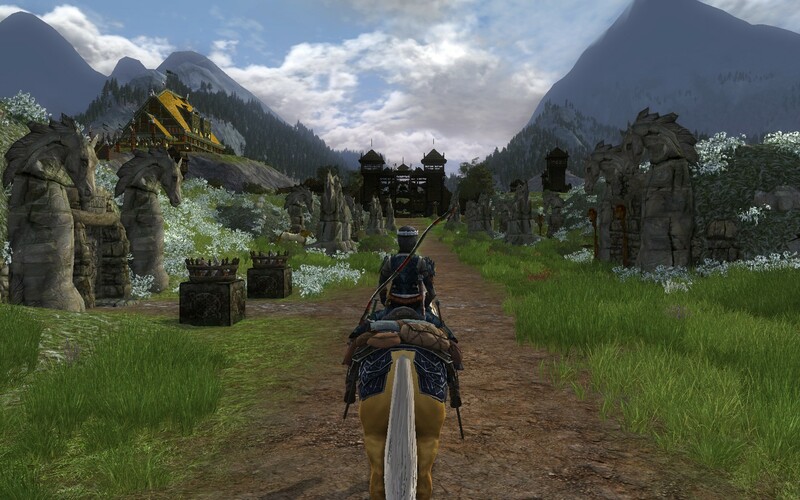 One of the best things about the LotRO story is that you get to dig into the history of Middle Earth and experience things in ways other LotR-themed games don’t let you do. You actually get to speak to the shade of the ill-fated last King of Arthedain, Arvedui. How cool is that? 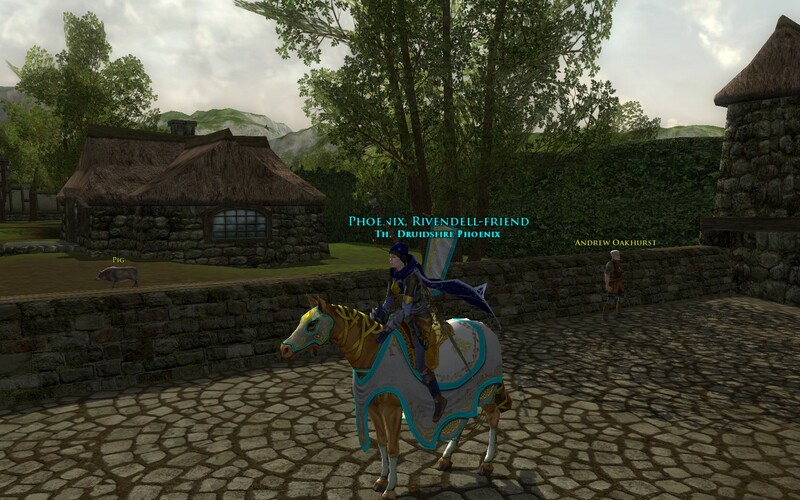 The developers added ties from him to their epic questline involving the minor Ring of Power Narchuil and I always thought it helped make the player feel more a part of the history of Middle Earth, rather than running behind the Fellowship as a second-string team. Angmar is a thoroughly unpleasant place to be, and the servants of the Witch-King and Sauron are fighting amongst themselves for supremacy. One of them was the corrupted elf Amarthiel, a key player in the pre-expansion LotRO. 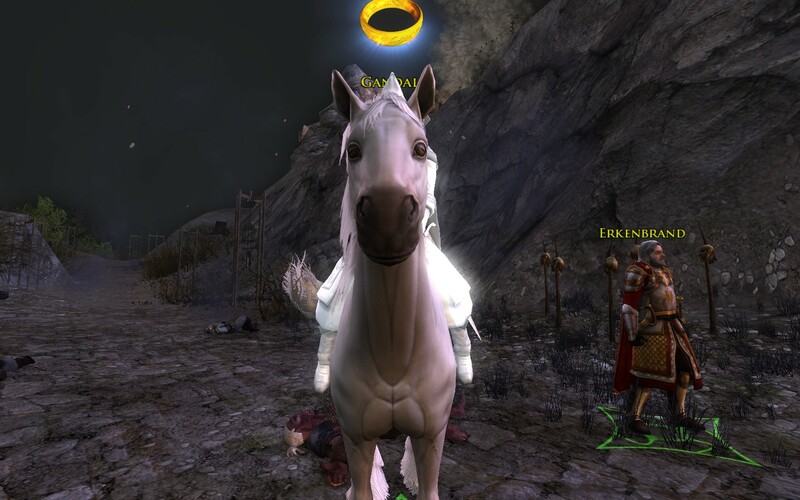 Here you can see her stunning my Minstrel during the epic story where the Eye of Sauron itself is present. 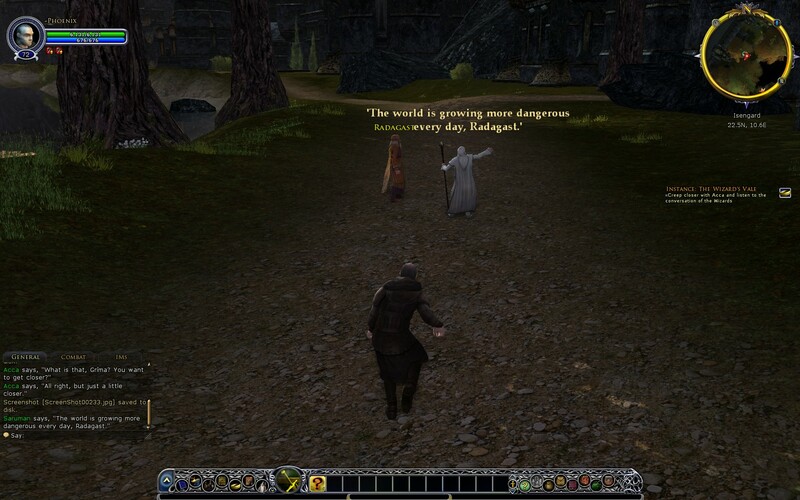 The Dread system in the game is one of the best mechanics I’ve seen in an MMO to show the very real effects that the presence of evil has on characters in Tolkien’s universe. Fortunately, my Minstrel didn’t have to fight all those guys. She would not have had a good day. 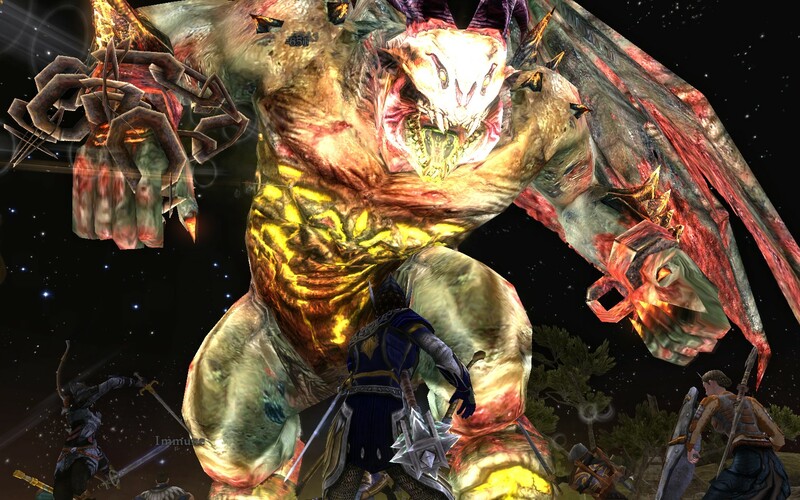 LotRO has a distinction as being one of the few major MMOs that only has one playable faction unless you were interested in PVP. The Player versus Monster Player system restricts PVP to the Ettenmoors, because it would simply be lore-breaking for there to be random Orc players roaming around all the non-invaded areas of Middle Earth. For years, however, the only place players could fight amongst themselves was in the Ettenmoors. And until the advent of Rohan, the ‘moors was the only location in the game where the moon looked different at night on a regular basis. I just love this almost threatening aspect to the full moon here in the PvMP zone, it just adds a little more spice and a sense of danger to the place. 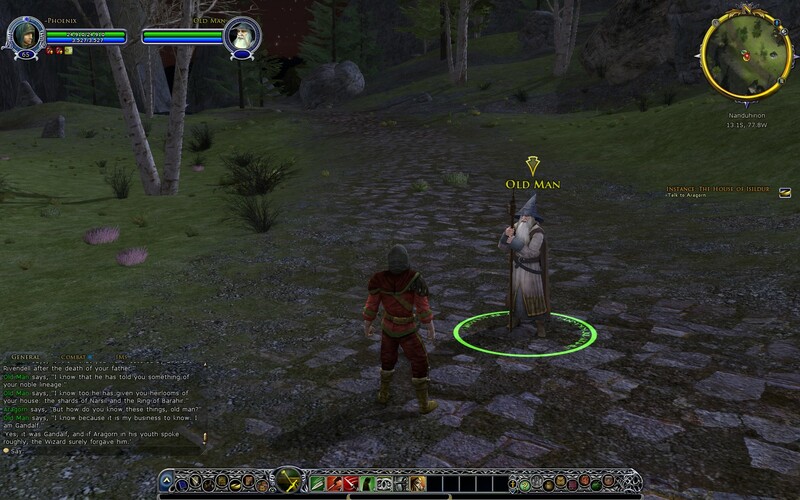 During the epic quest in the Trollshaws, you get to encounter a man named Wistan who’s hunting for a white stag. He finds something far different. This is one of those times when I had to keep the UI on so I could see the text because I don’t use chat bubbles, but here’s the first time the player encounters Gollum in the game’s story, on the shores of the Bruinen. It wasn’t until 2017’s Update 20 that Gollum gets his very own voice actor for content in Gondor. You can’t go wandering through the Trollshaws without going to find Bert, Tom, and William because that’s just not cricket. 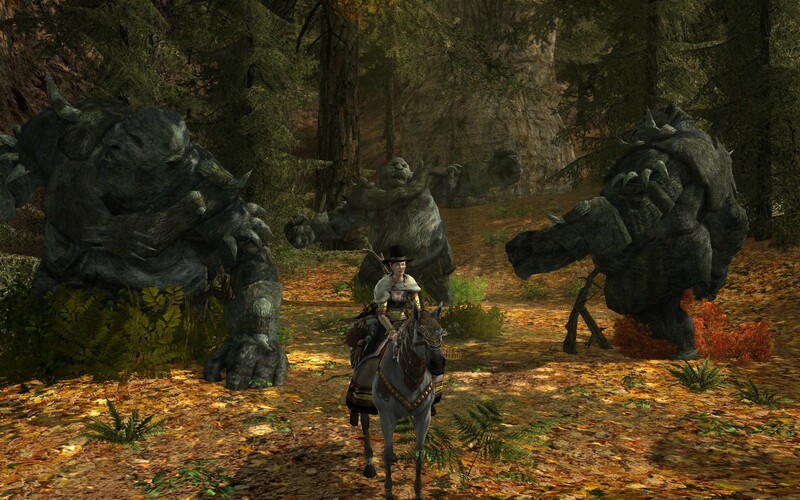 Bilbo’s trolls are a part of both The Hobbit and visited in Lord of the Rings, so it’s no huge surprise that the developers would ensure they were present. Also, back in the day, all the trolls in the Trollshaws used to be elites, especially the ones that would patrol at night along the main road headed to the Fords of Bruinen, so it was even more dangerous than usual to go that way after dark. Ahh, the valley of Imladris. When I first joined the game, I always knew my main would be from Rivendell. 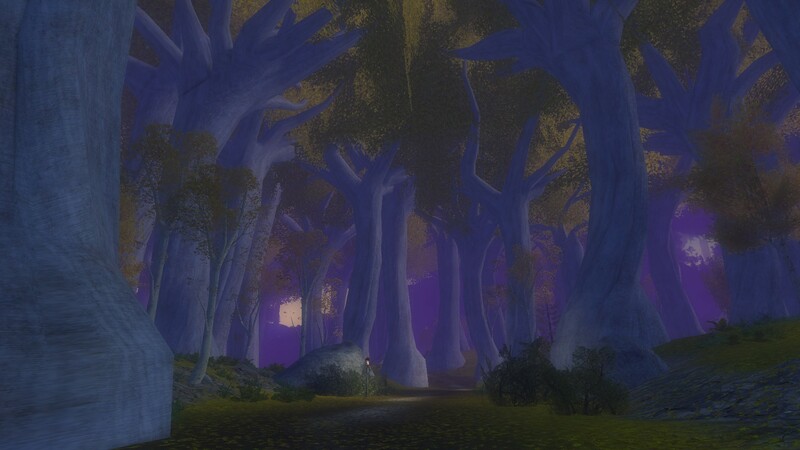 It’s my favorite place in all of Middle Earth canon, and this screenshot is before the advent of the fairly recent frills foliage and the improved draw distance effects. Okay, this one requires some explanation. Back in 2015, Turbine announced the server consolidations and were testing the transfer processes on the live servers. They were very careful to say that if you were going to transfer during the testing phase, you had to disband your kinship before you did so. Well, I didn’t, and it wound up locking the name on both origin and destination servers so I couldn’t get it back. However, they did say that a player could ask them to fix the problem, just put in a ticket. The problem made it seem as if someone had sniped the kin-name, but I knew in my case it wasn’t true. So, an extremely helpful GM named +Caergoth helped me get it sorted out by digging up the original procedure to fix it, and this screenshot is from the second time he did so on the other server. 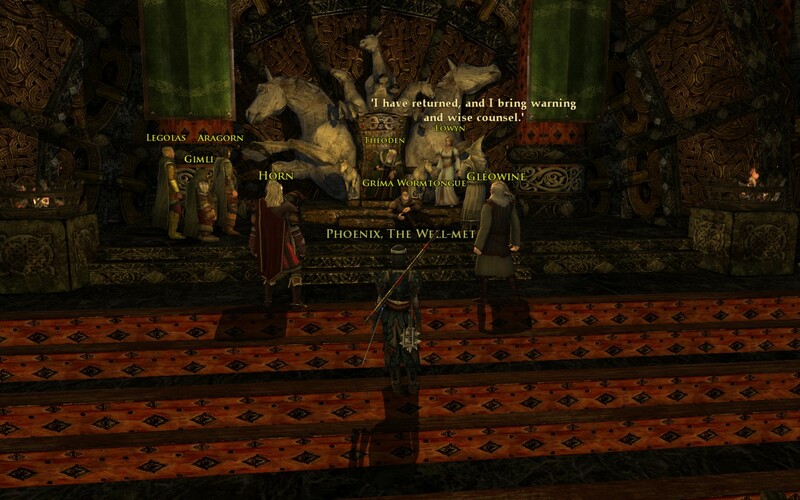 +Caergoth was very fond of chickens and had spawned a bunch of them here in Elrond’s house. Even after he left, there was still one random chicken clucking around in that lobby until a random player went and killed it. Still, he gave me a clickable item to keep that spawns a chicken for a few minutes that I love to trot out for special screenshots, including that time I streambombed community manager Cordovan when he was watching the play in Frostbluff at the Yule Festival. Like I mentioned earlier, we as players aren’t the second-stringers. We get to be a part of major events in the history of Middle Earth, not just as someone there in the background who gets to watch, but to actually contribute to the event in a meaningful way. Here is the moment when Narsil is reforged after you as the player recover the non-canonical Silithar from Elendil’s Tomb. That questline does require a fellowship to complete unless you’re very over leveled, but it’s perhaps the richest quest chain in the game that isn’t actually part of the game’s primary epic story (hint hint: it really should have been). Another major incident in the history of the Ring. You as the player get to help the Fellowship prepare for their quest without knowing exactly what it’s about. Still, you get to play one of four instances based on your race and then you get to see the Fellowship off on their errand. Trust me on this, the hobbit instance is the best of the four. Who knew that the goblins were artists? Deep in Goblin-Town in the Misty Mountains is this graffiti depicting a great battle between dwarves and goblins. I remember Professor Corey Olsen discussing this piece of art during his livestream and it seems to me that the rounded figures on the left are the dwarves (see their beards?) and the ones on the right are the goblins, with the large figure with the pointy hat possibly being the Great Goblin, or perhaps Bolg or Azog. 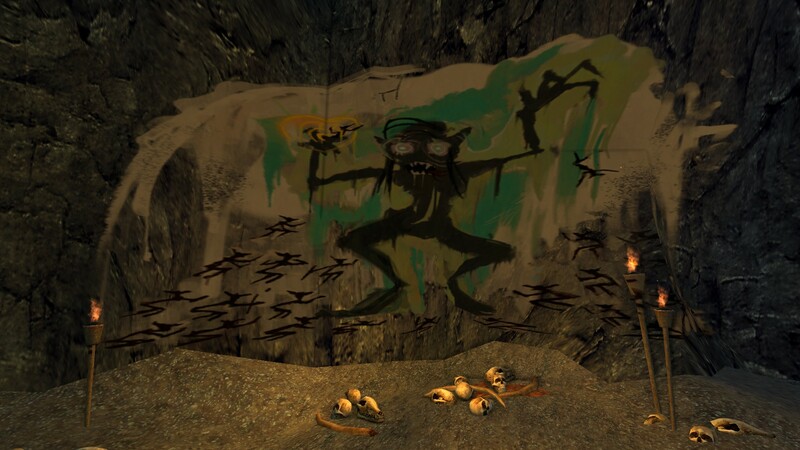 Speaking of goblin graffiti, here’s some crude art of Gollum with the Ring on his finger. He seems awfully tall and powerful for such a gaunt and wretched creature, doesn’t he? Deep in the bowels of Goblin-Town, players will find Gollum’s cave and the lake he lived upon. You can see his little boat on the shore, and if you go to the island, you will find the scraps of his life. I brightened the screenshot a bit because there’s no lights down there, but the richness of the colors is still evident either way. 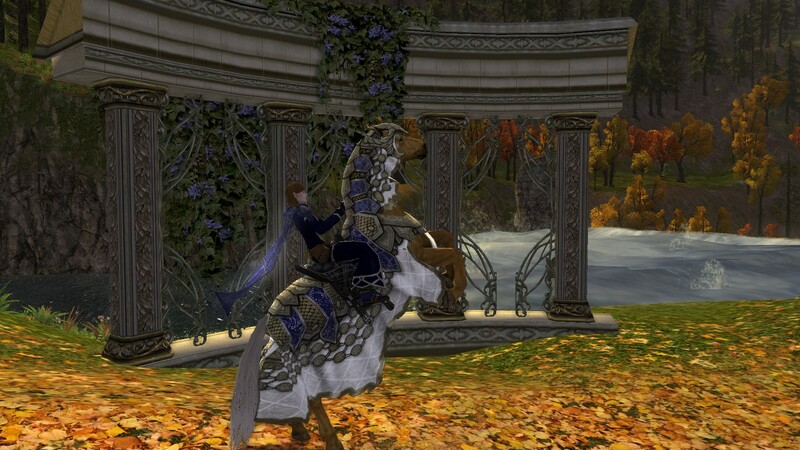 Back in Rivendell, I had to take a silly pic of my Minstrel and the Steed of the Eldar, a free gift recently given to all VIPs. 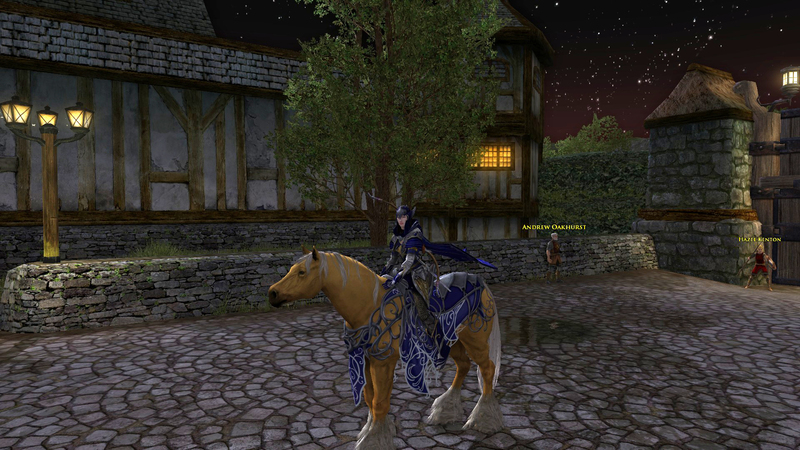 For this shot, the warsteed caparison and headgear is dyed Ered Luin Blue and I’m using the /mountrearup emote you can buy in the LotRO store. 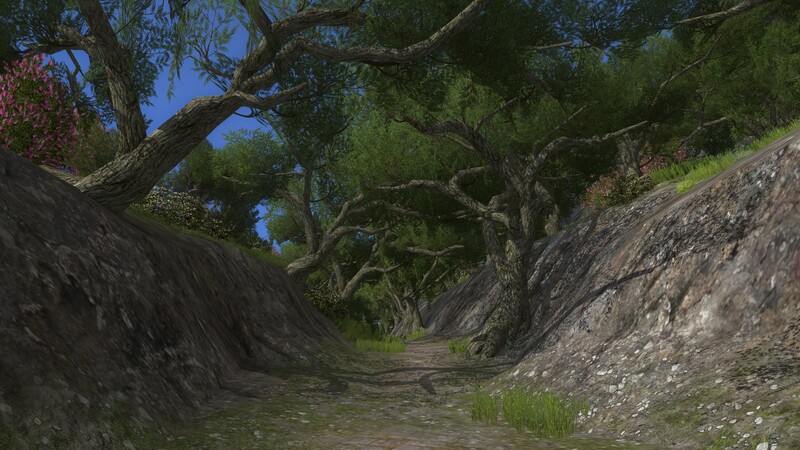 So, all of those previous images were captured in places available during Shadows of Angmar, the ‘vanilla’ iteration of LotRO. 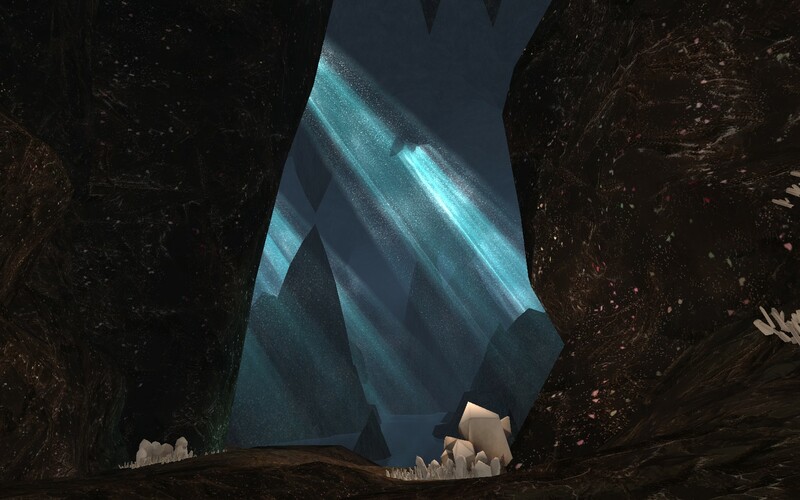 The game’s first expansion was Mines of Moria, and the first thing you get to do is go on an epic quest to help some dwarves enter the Mines to discover what happened to Lord Balin and his expedition. During this quest chain, you fight the Watcher in the Water, find out you’re woefully unprepared, and sent off to acquire your first Legendary Item, a weapon to help you win. During the chain, you get to experience the creepiness that is the Hollin Gate area at night and get to scold some dwarves tossing rocks into the pool. 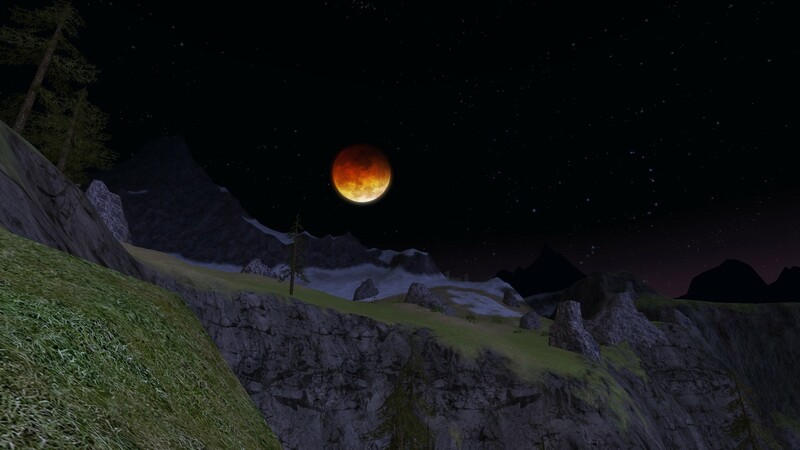 This screenshot during the instance is the first time outside of the Ettenmoors that the moon looks different. However, if you compare the art in terms of light and shadow and the placement of the maria on the face of the moon, you’ll see that the devs sort of cheated and used the same art, only they rotated it so it’s upside down. I didn’t realize this myself until I was organizing the screenshots for this article. The actual Hollin Gate before it’s opened by the dwarves. This was the key art for the whole expansion and featured on a cloak players acquired by purchasing the Moria expansion. Speak friend and enter. While Moria may have a problem with vertigo-inducing steep stairs, a serious lack of railings that would cause any government inspector to faint, and stable-master goats with extra motion sickness action, it still has its own beautiful locations. 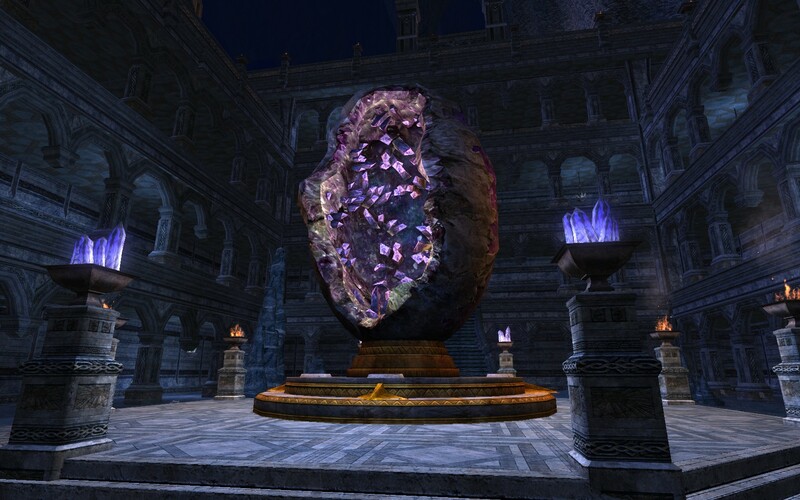 Here is the Great Geode, one of my all-time favorite locations in-game. Being a geology fan for many a year and of geodes in particular, this location made me very happy. The Chamber of Mazarbul is one of the saddest locations in all of Middle Earth. Here, the last dwarves from Balin’s expedition fell in battle against the orcs years before the Fellowship passed that way. 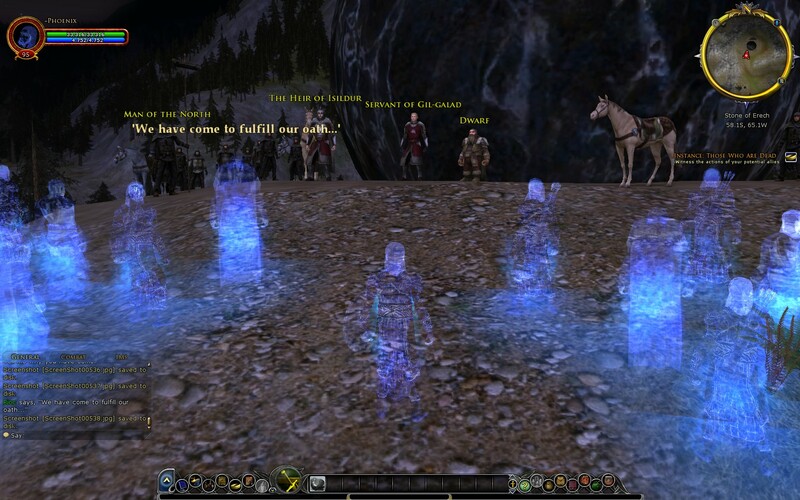 True to the canon, players can experience the last battle via Session Play but also visit the tomb of Balin son of Fundin as their regular characters. 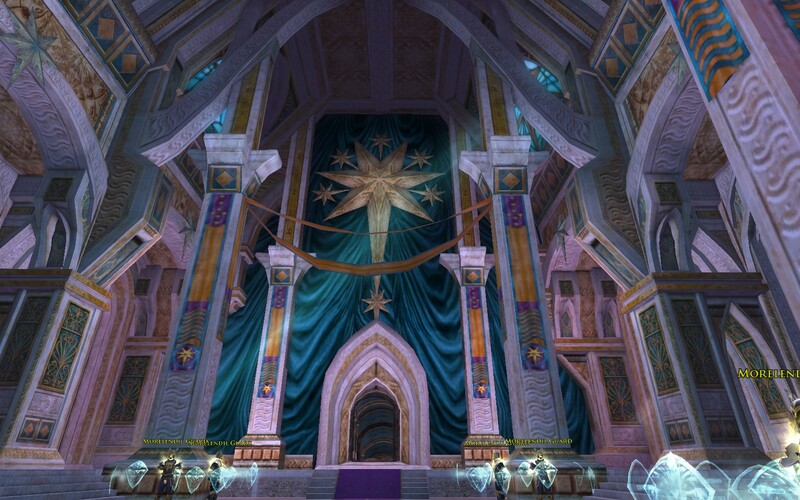 The Chamber of Mazarbul is also one of the few places that the game went with a fully-CGI cutscene featuring the Fellowship’s visit to the room after you complete the epic story there. Yes, they’ve got a cave troll. 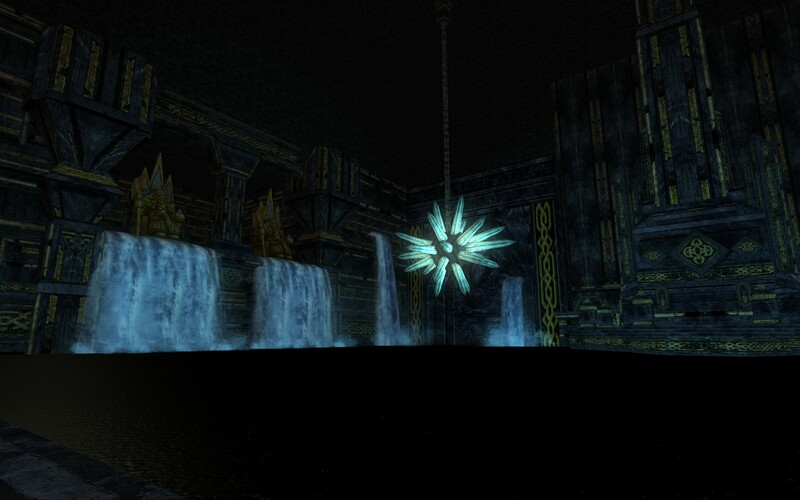 This shot is of the pool and thrones in a chamber deep within Moria, where you as the player will recover (and then return) the famed mithril axe Zigilburk and learn the fate of another of Thorin’s Company. The Dwarf-king statues aren’t found anywhere else prominent in Moria and that makes them fascinating. Unfortunately, this pool also entertains visits from the Watcher in the Water or another of its kind, so it’s unwise to visit for long. 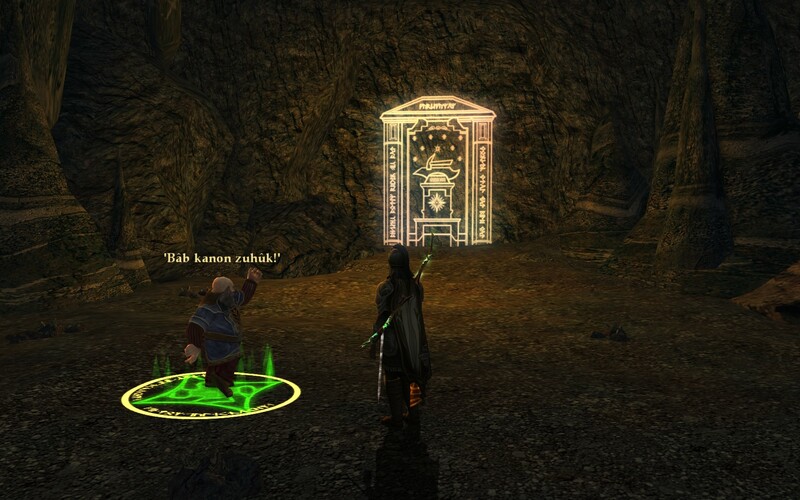 The Hollin Gate isn’t the only hidden door in Moria. Here is the hidden passage to the Heart of Fire, a legendary forge deep within the mountains where Zigilburk was crafted. I trust in the utter nerdiness of the devs that the runes actually say something appropriate and lore-fulfilling. Near the First Hall and the Bridge of Khazad-dûm lies an area named Nud-melek. In previous iterations of the lore such as the various movies, people would see tall columns in a pure dwarven style with sharp angles and the like. What I find fascinating here is that the Turbine devs chose to remember the friendship that once existed between dwarves and elves and had this designed as such. 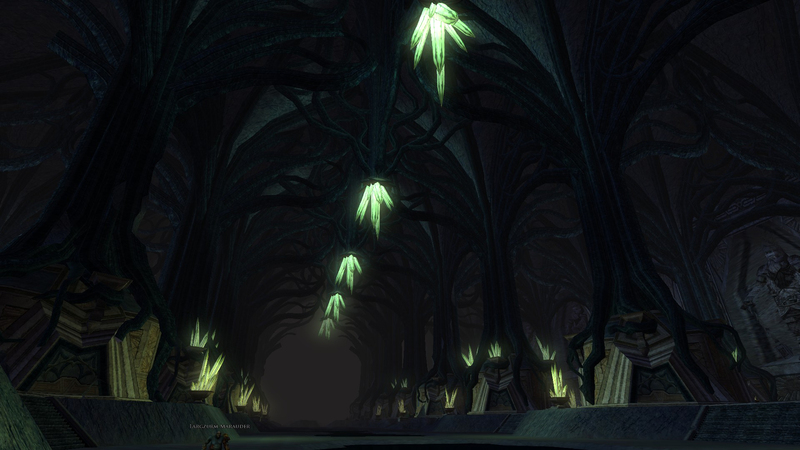 The columns are in the shape of trees with the green crystals hinting at leaves. It’s far more open and airy than one would have expected in a dwarven dwelling. In the Fall of Moria Session Play, you get to play a dwarf named Nafni as he interacts with his king Durin VI and the elves of Lórien in Third Age 1980. 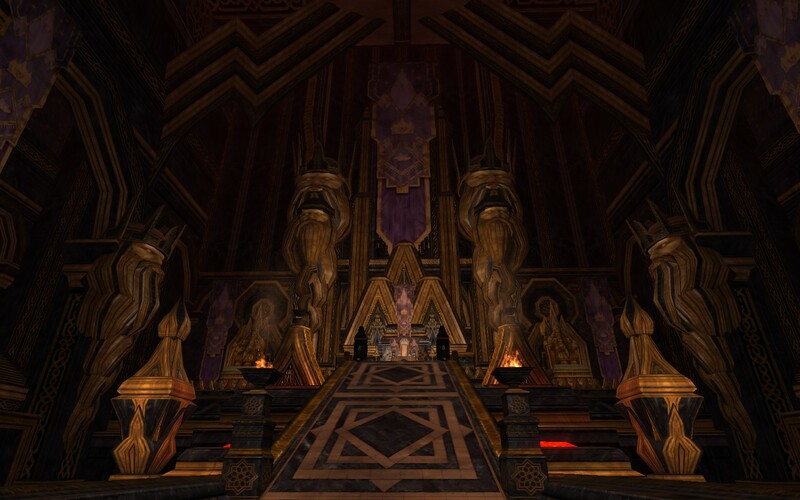 While that adventure doesn’t end well thanks to a Balrog, here is the king’s throne room in all its glory. It’s actually something of a pity players don’t get to see these ancient places before they’re destroyed or diminished by age. 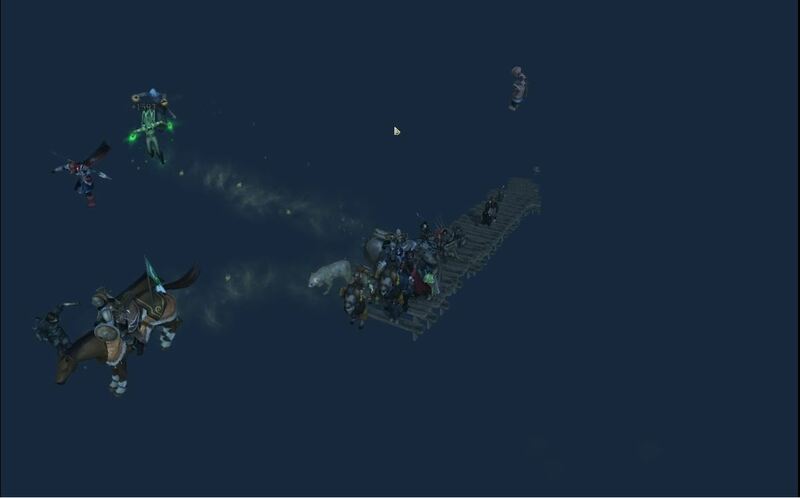 This is one of the loading screens from that Session Play, and you can see most of the people here are not happy. 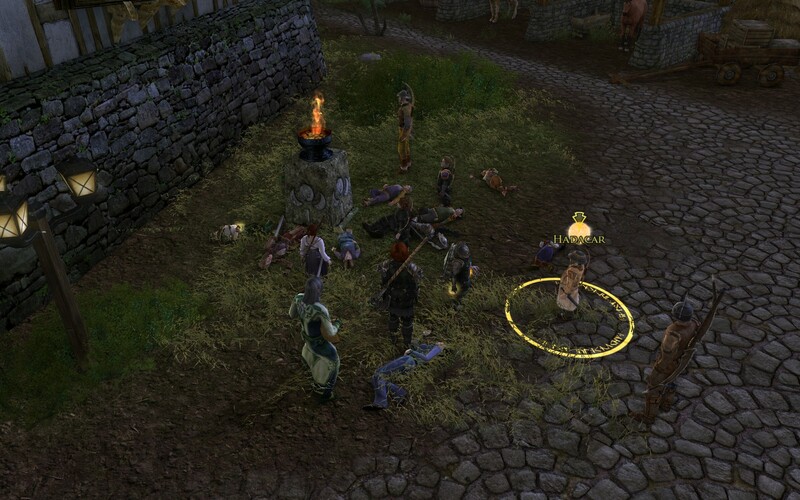 Durin VI is insisting everything’s fine and the elves are all going, “Nope!”. Here’s why. 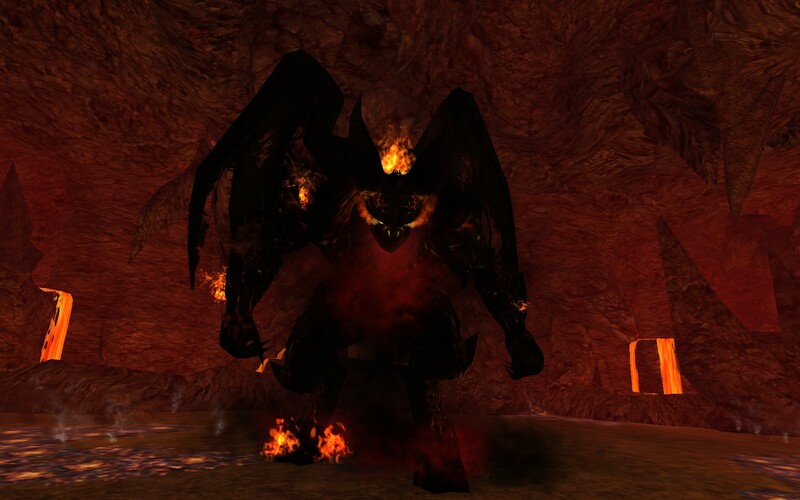 While academics can and will tell you that canonically Balrogs have no wings, in LotRO they have more wings than an airport. It’s a good thing you aren’t actually Nafni, isn’t it? 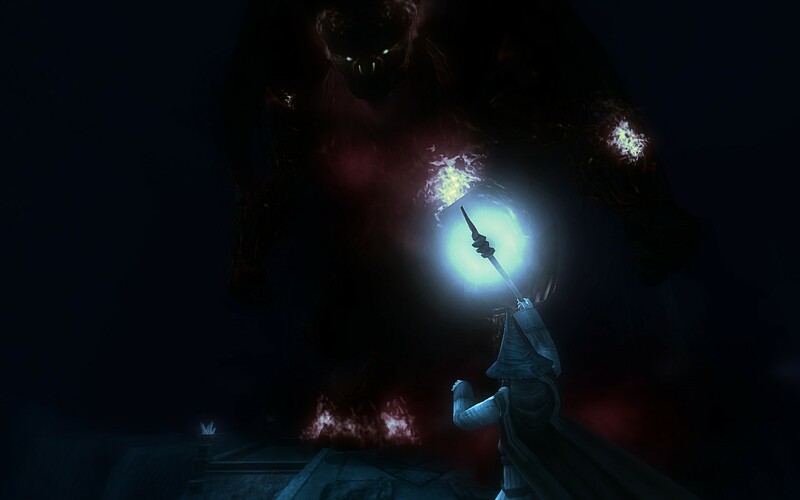 In the epic questline, you discover and then fight an ancient evil in the depths of Moria named Gwathnor. I always thought its design was intriguing with all the runic lines tracing all over its body and weapons. 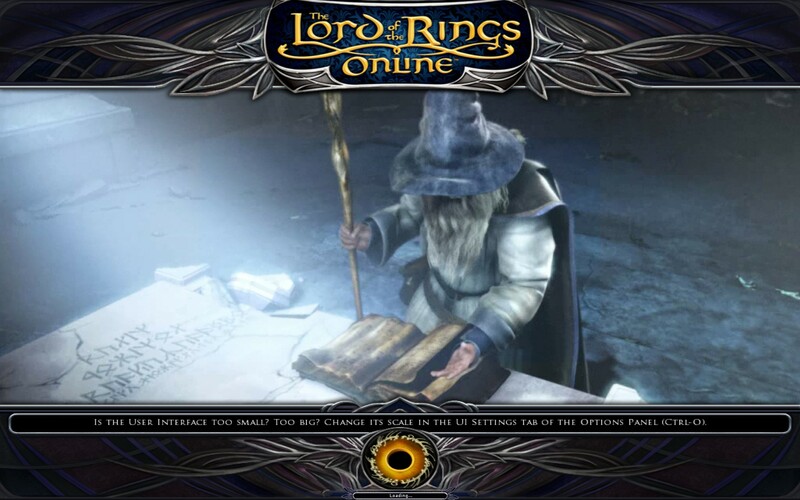 Sometime around or just before Update 11 in 2013, they added a new solo instance in both primary starting areas to catch players up to speed on the overall Lord of the Rings story for folks who may have only seen the movies. In the instance, your character has a dream about Galadriel, and she’s warning you about the danger of the Shadow and predicting your eventual role as a hero(ine) of Middle Earth. 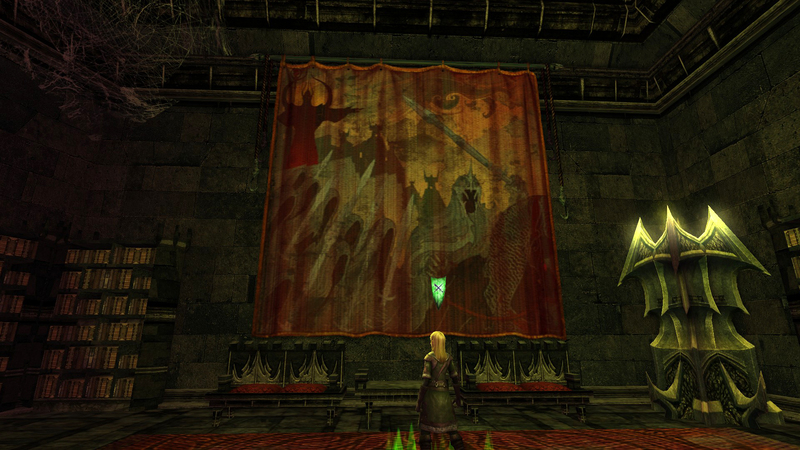 This image comes from the Bridge of Khazad-dûm section of the story. Admittedly, one of the cool things you get to do in Moria is trace the steps of Gandalf from his fall here at the Bridge of Khazad-dûm to the Foundations of Stone, including traversing Moria’s version of Lake Everswim. You also get to discover the corpse of the Balrog on the very top of Zirak-zigil, although I don’t recommend hanging out too long. Here’s the actual broken bridge as it is in-game. Unless you’ve unlocked the stable-masters between the First Hall and anywhere else in Moria, you have to hoof it up and around to the north through some orc and goblin mobs to get to the other side. The Dimrill Dale serves as the eastern exit of Moria. 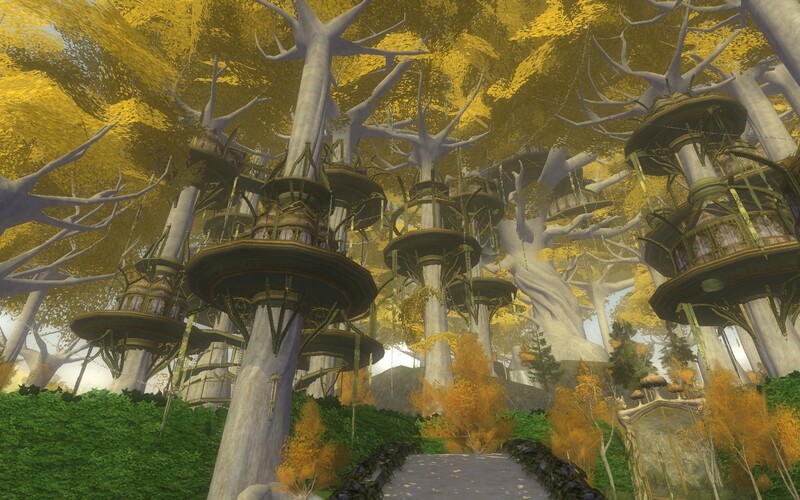 The elf/dwarf friendship of old is still evident in the tree shapes that rise up around the dwarven carving. What’s different from the game and the original text is that the dale is supposed to be more of an open field, not a funnel down to the Mirrormere and Silverlode. Also, as an aside, you can plow through the entire Moria epic questline in approximately 14 hours even if you’re tagging along with an errant academic who likes to examine the architecture along the way. 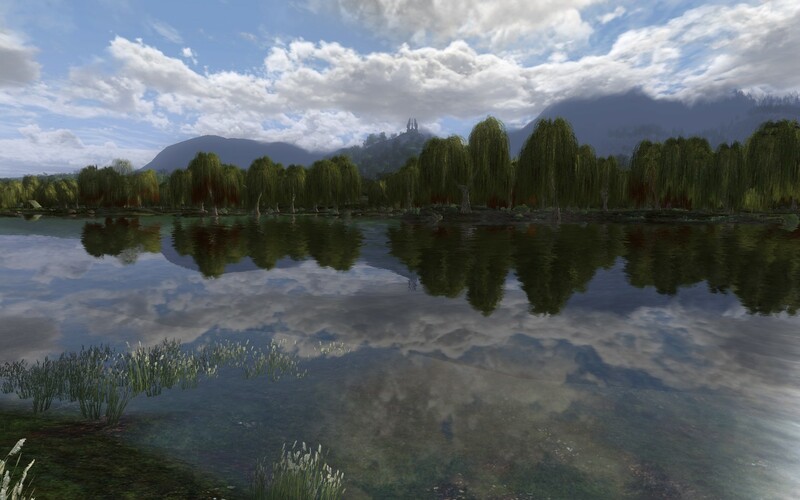 After passing through Moria and heading down along the river, you can stop and follow in the footprints of Durin the Deathless by looking into the Mirrormere, which is said to reflect the stars even during the day. This detail is not overlooked by the devs, although of course it does look better at night. According to the game lore, the fortuitous first meeting between Gandalf and Aragorn happens near the Mirrormere. In a rather convoluted level 65 Session Play, Ranger Candaith tells some of the history of the Dúnedain, and you get to experience this first-hand as various Rangers throughout history, ending up with this famous meeting. 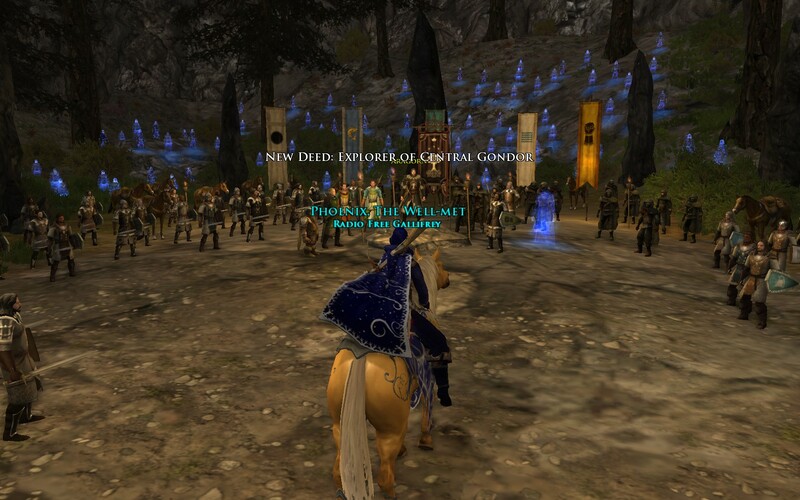 Back in the day, you couldn’t enter Lothlórien without getting one-shotted by the guards near Haldir’s flet unless you had ground some reputation with their faction first. 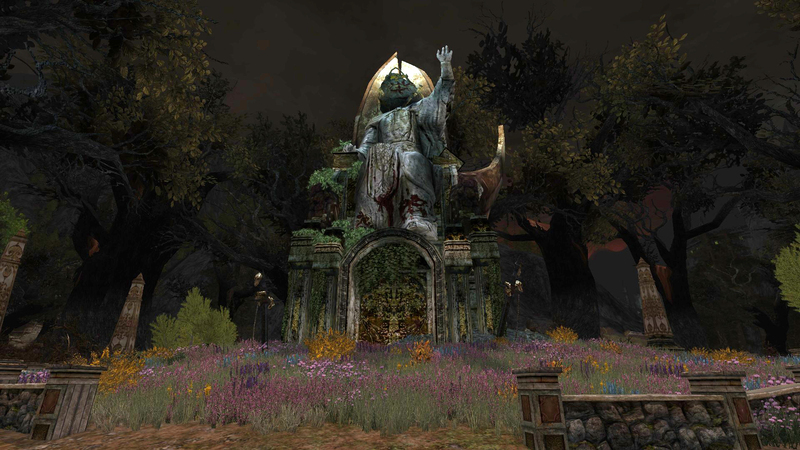 These days, you can go right up to the gates of Caras Galadhon without any rep required. While some epic quests will take you into the city, you still have to grind the rep to be able to wander in whenever you like. 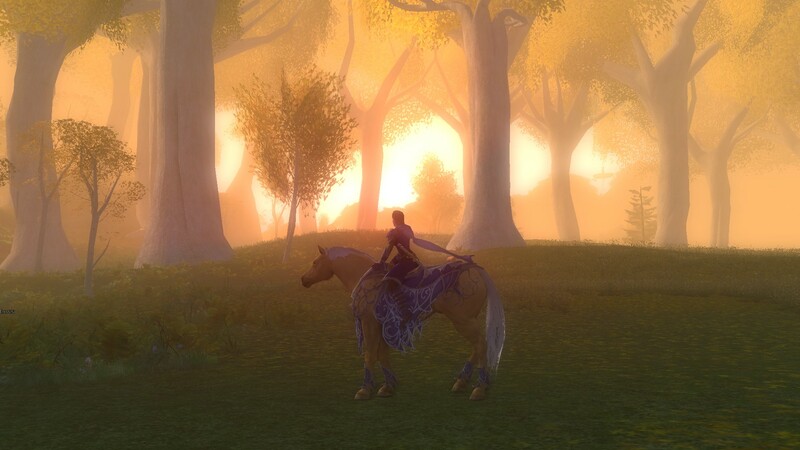 This shot is one of the many I took featuring the gorgeous scenery in Lórien, this one showing off the mallorn trees in warm morning sunlight. 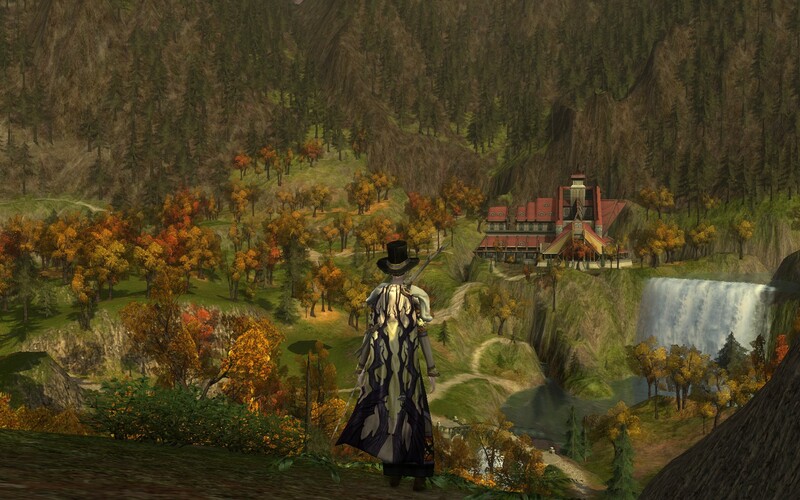 Here’s Lórien as it appears at sunset with the rich golds and oranges melding together. 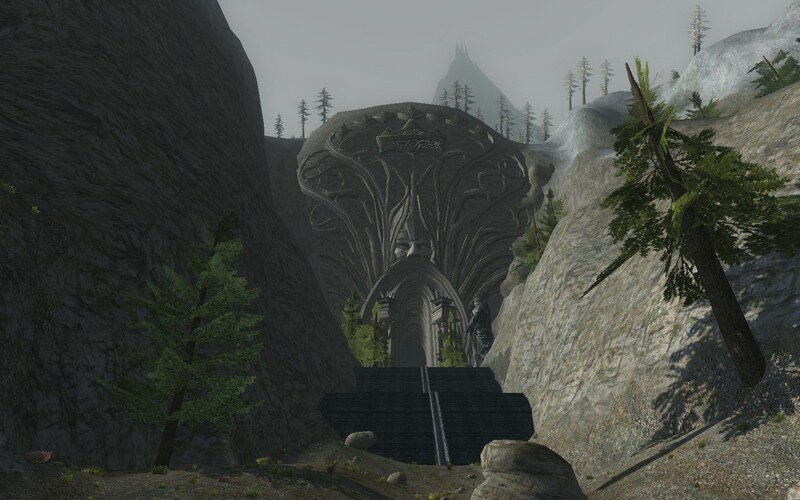 The home of Elvendom in Middle Earth, Caras Galadhon is one of the more gorgeous locations in all the game. While the various flets and their ladders may be frustrating at times, it’s still a truly remarkable set of gamespace building on the part of the devs. 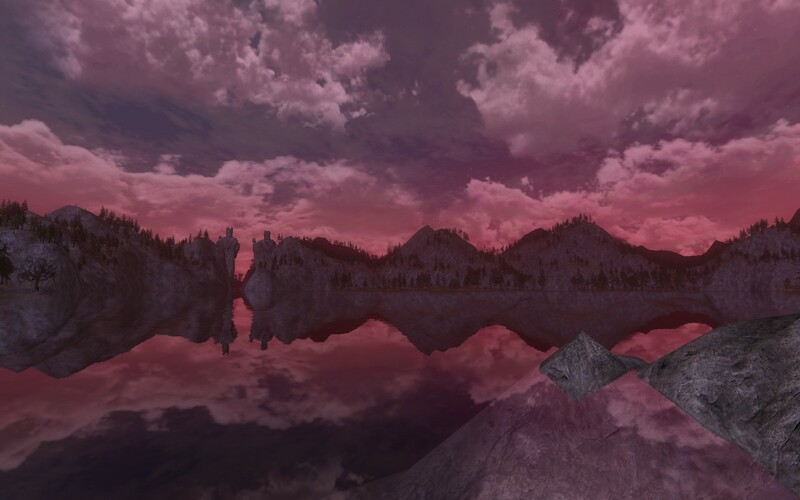 Twilight and nightfall in Lórien are also amazing. The rich purples and blues merge with the golden leaves of the mallorn trees to create a lush landscape whose color palette approaches other games’ fantasy-driven variety without sacrificing the real-world imagery created by the Tolkien lore. 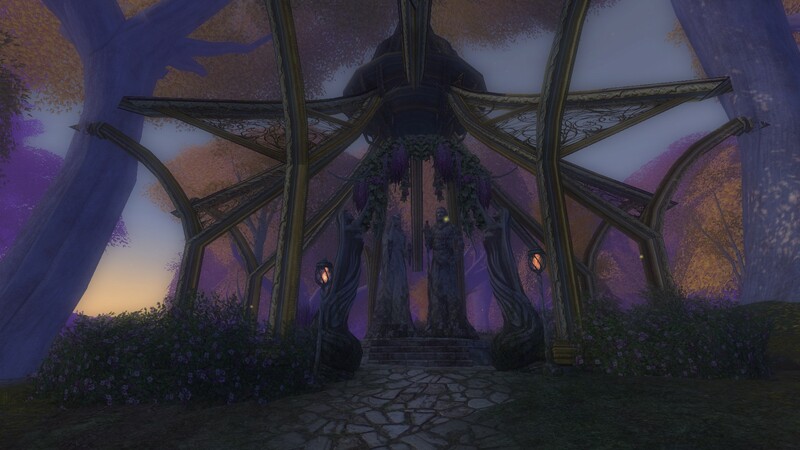 While some might debate whether this is Celeborn and Galadriel or a memento of lost Amroth and Nimrodel, this pavilion is still a beautiful example of how the art team expanded upon the elven architecture style and made it their own. 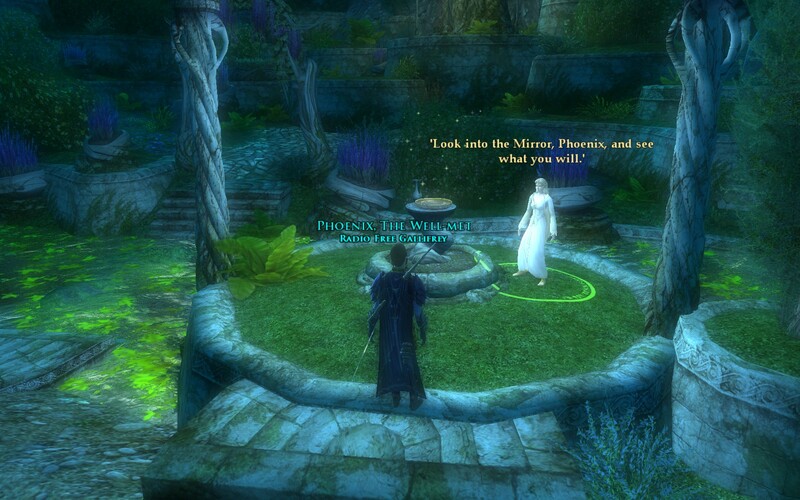 One of the more intriguing locations in Middle Earth, you get to visit Galadriel’s garden with her eponymous Mirror more than once. However, if she offers you a peek, be very careful not to misinterpret what you see. 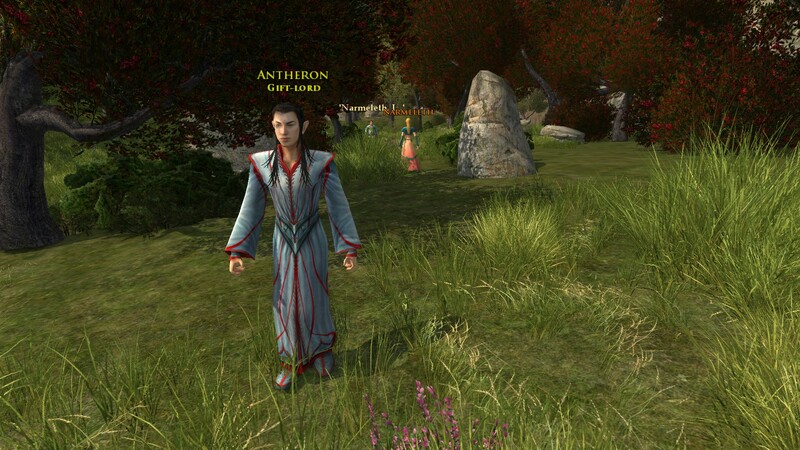 If you visit Galadriel’s garden, you may also encounter some rather important visitors such as the Windlord himself! What’s even more fun is that you get to learn of Gandalf’s regeneration into the White Wizard long before anyone in the Fellowship. 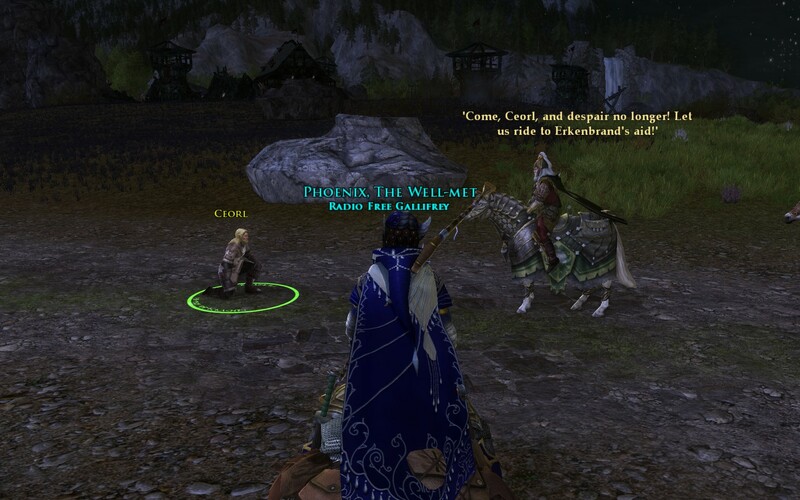 Even if you haven’t yet ground the rep with the elves, you can still visit Celeborn and Galadriel in a couple of instances, this one featuring Gimli and Legolas escorting a rather stubborn dwarf named Bósi as he seeks to aid his people in Moria. 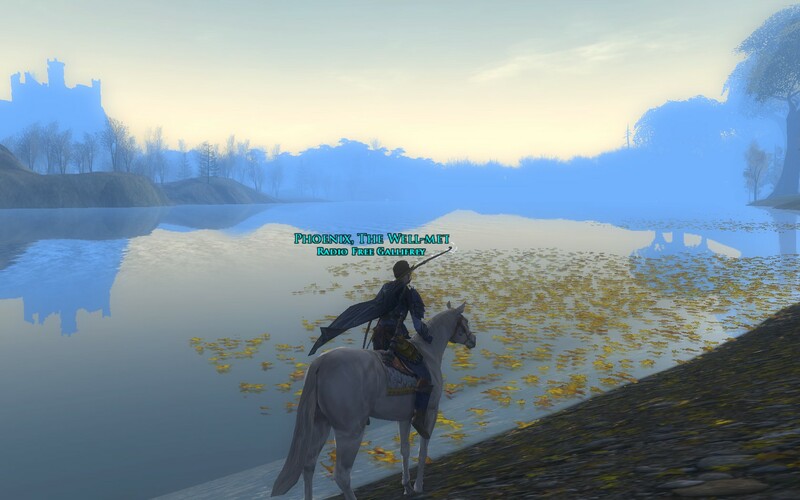 Eventually, you’ll pass to the south along the Anduin, and here’s a shot of my main sitting on the Grey Steed that is the reward for completing the entire Shadows of Angmar epic questline. The fallen leaves of the mallorn trees create an interesting contrast to the hazy dawn over the river. 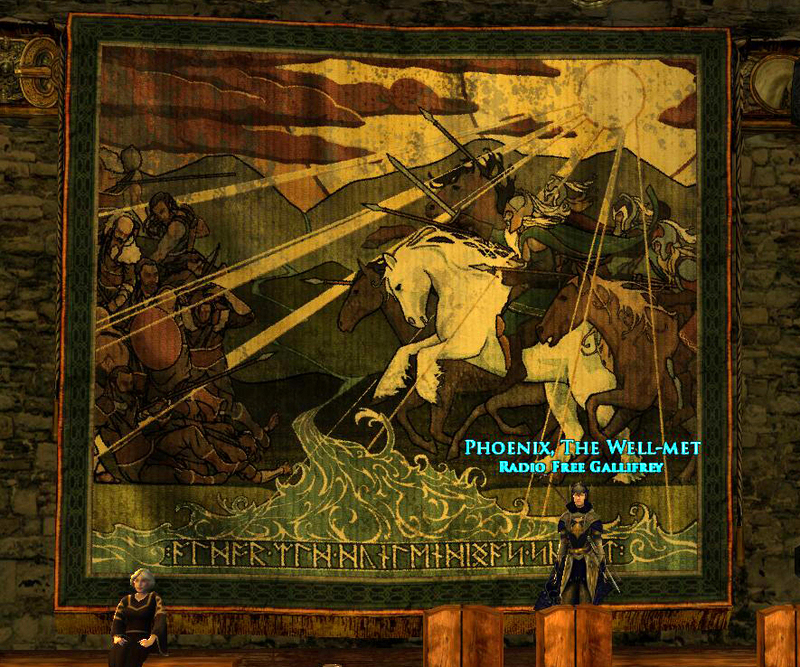 Whilst doing one of the skirmishes tied to the Dol Guldur instances in the Siege of Mirkwood expansion, I happened upon this tapestry. It represents the Nazgûl being ordered around by what I can only assume is the Necromancer (spoiler: it’s Sauron). At first I was unsure, but then I started counting the hoods. The sneaky Nazgûl in the lower-left corner is the one that threw me off. 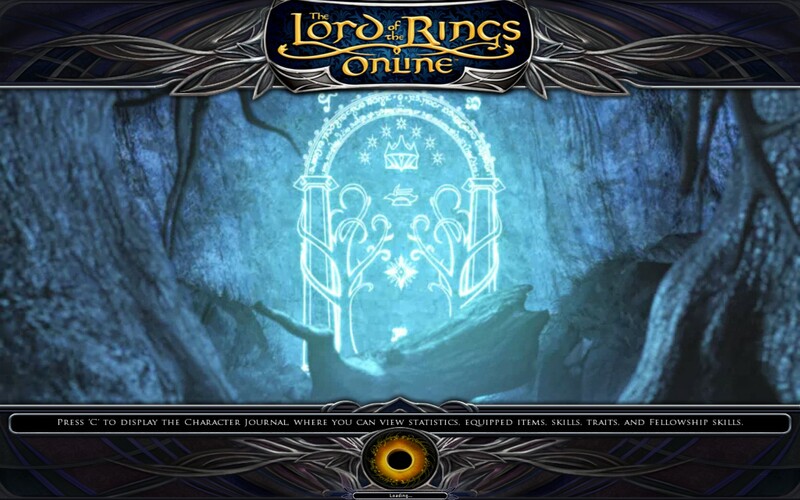 While players can quest on the eastern side of the Misty Mountains and down into Rohan that way (which led to some cool side-quests involving the fate of the Entwives in the Brown Lands), for the longest time you’d have to come back through Moria and head south to the Gap of Rohan through Eregion, Enedwaith, and Dunland. This is a picture of one of the tallest mountains in Fordirith. It’s not actually Celebdil/Silvertine/Zirakzigil because it’s too far south, but it’s still a lovely picture. I wonder what it looks like now with the improved draw distance in place. 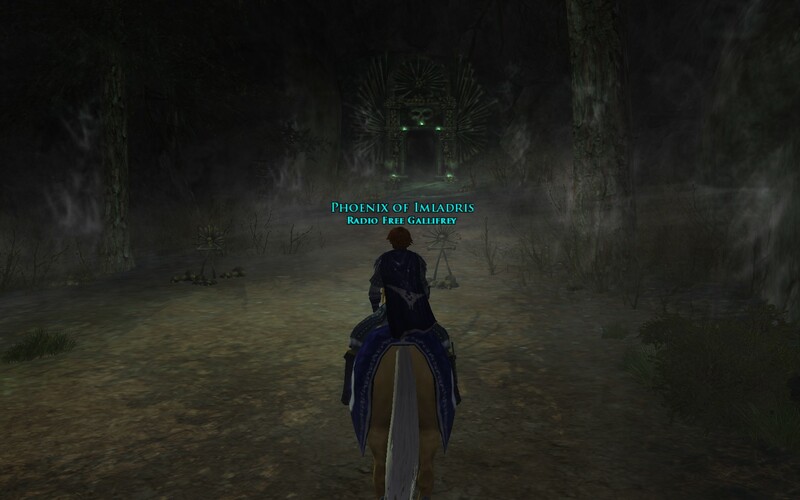 One of the coolest instances in the Shadows of Angmar story takes you into Eregion and the elven forges of Celebrimbor himself! There, you’re actually trying to stop Amarthiel from regaining a reforged Narchuil, but there’s this curious mural on the wall. 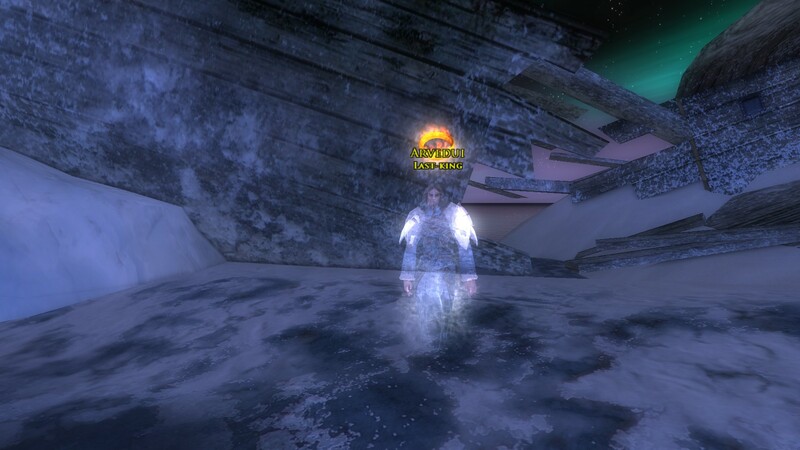 It’s hard to get a good screenshot of it because there’s a Dread effect nearby that causes things to go hazy. However, here’s a bunch of elves and Rings of Power. There’s some debate whether the elf on top is Celebrimbor or Antheron the Gift Lord (spoiler: he’s also Sauron in disguise), but if you look at the latter in the Session Play involving Narmeleth’s seduction away from her father and handmaiden by Antheron the Gift-Lord, it’s pretty much the same robe that guy’s wearing. Personally, I took the three circles above the elves’ hands to be the Three that Sauron never touched, with the circle around them indicating that, with the Ring above that larger circle representing the One. I may very well have to agree to disagree with Professor Olsen on this matter. Again with the epic Session Plays that let you observe and participate in events your character could never have been present for. This is where the elf-maid Narmeleth left her father Laerdan for the company of this Gift-Lord who was actually Sauron in disguise. This was before the fall of Númenor in the Second Age, so he was still able to take on a pleasant form to deceive people. 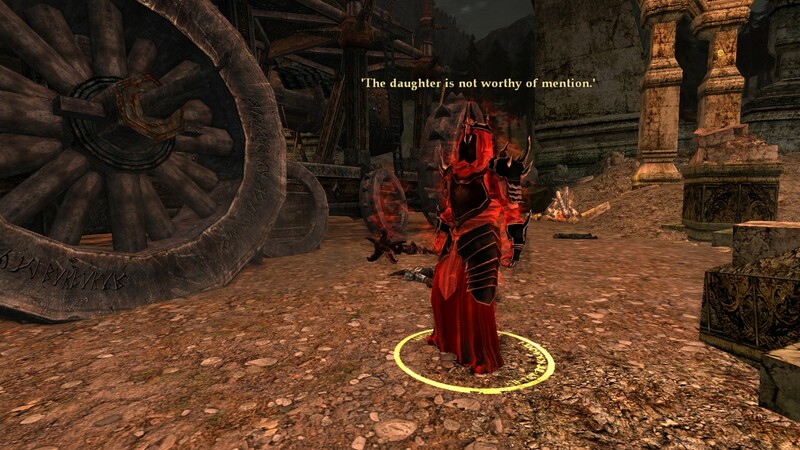 Of course, the epic questline can’t have bad guys without them trying to betray one another. 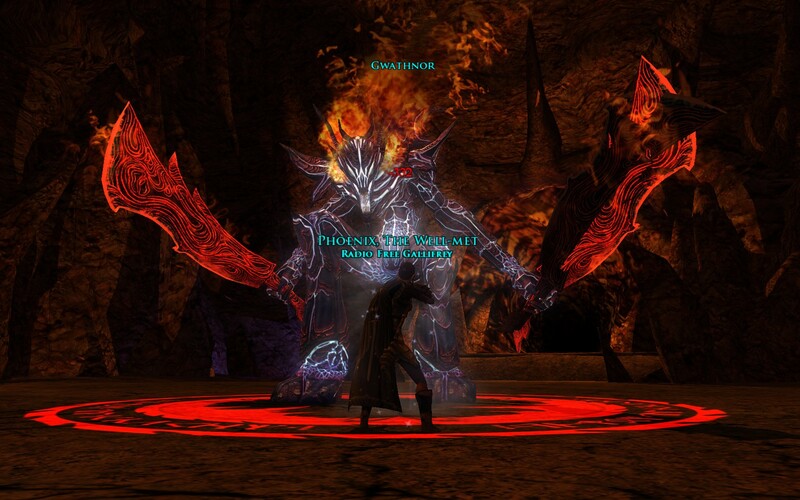 As you bear witness and try to help Laerdan outside the elven forges, you see Amarthiel wielding Narchuil in combat against both Mordirith and Mordrambor, the three of them striving for supremacy for the role of Steward of Carn Dûm until Amarthiel throws off the chains of evil and regains her true self as Narmeleth once and for all. 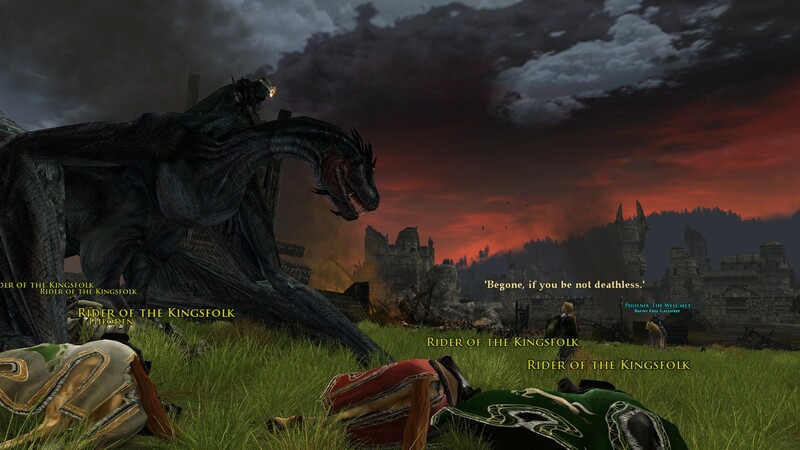 Of course, the death of Narmeleth isn’t the end of that epic storytelling session. Here, the wraith known as Mordirith is revealed to be the last King of Gondor, Eärnur, lost almost a thousand years ago. This is the first time that the game’s epic storyline thoroughly blew my mind. This plot twist resonates even now into more recent Gondorian content as Mordirith has returned as Gothmog and seeks to reclaim his old throne and prevent Aragorn’s ascension. We still have plenty to explore in Enedwaith and Dunland, however. 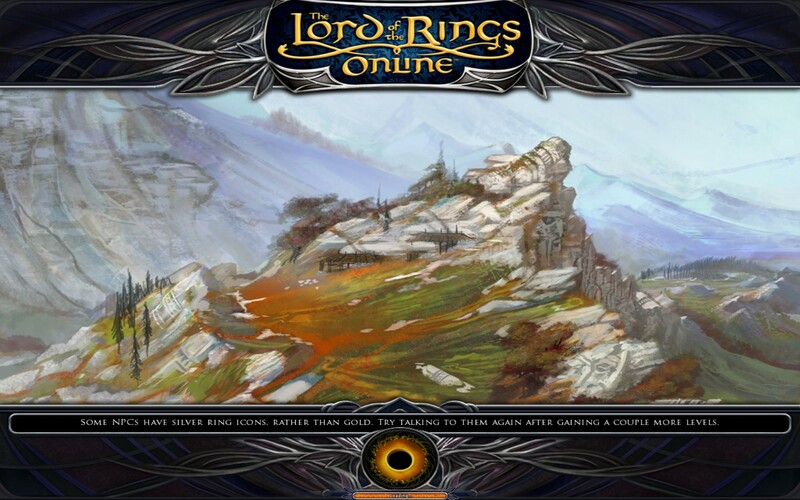 This is one of the loading screens when you’re in Dunland, showing the rough highlands that the player will pass through as they complete epic quests featuring the Grey Company on its way to meet with Aragorn in Rohan. You will also encounter the Bugans, twisted hobbit-like creatures that live on the border of Enedwaith. They’re flagged in the game as being of Orc-kind, but you can discover various items that also link them to hobbits themselves, although they are not canonical beings. In a hidden location in Dunland, you can find the Pristine Glade. It’s one of those areas that seems to harken back to the elves and places they once dwelled. Here, you can do a few quests to protect the Great Tree in the middle from the Enemy and his orcs and crebain. At the southern end of Dunland is an overlook that lets you peer down into Wulf’s Cleft. You can’t really go there as a player, and it’s probably a good idea not to, as it’s a Dunlending camp full of enemies. What was always striking to me was the actual tech behind this view. You see, in-game, the various NPCs move around. It’s clearly a first iteration in NPC movements that we’ll eventually play through in epic battles, but it was one of those places that felt most alive in the game. 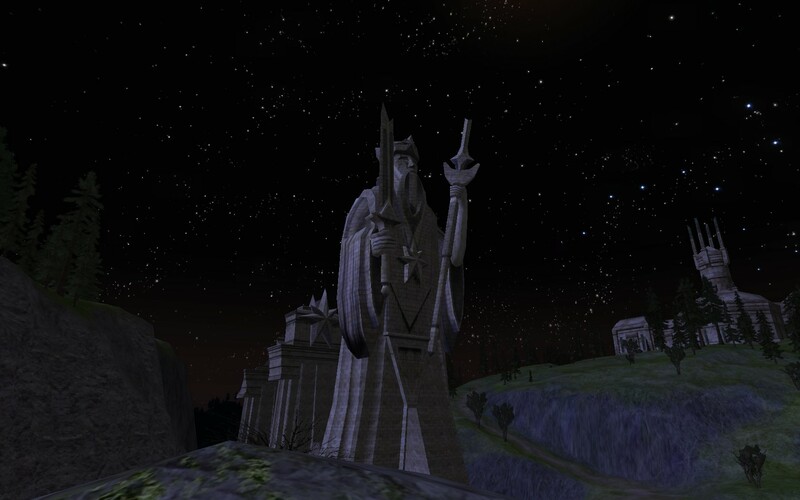 Even Isengard with its recalcitrant wizard can show a player beauty. The sunset tech is certainly in full grandeur here as we look south out of the valley toward the Fords of Isen. 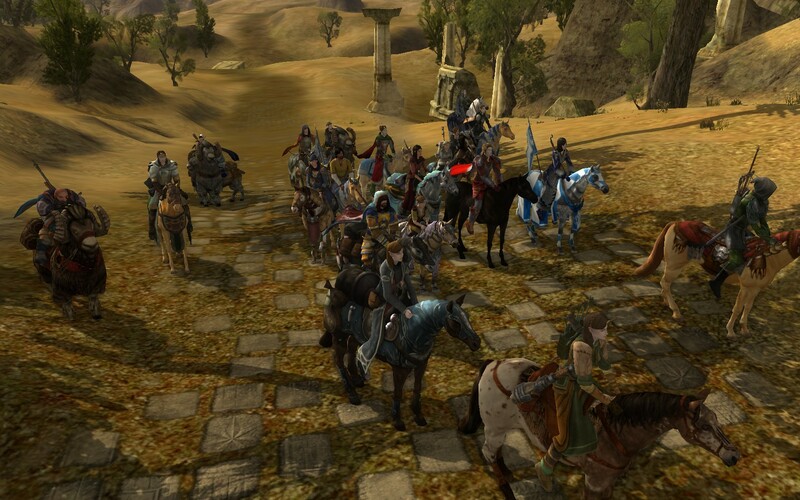 I’m always a fan of Session Play in LotRO. You can learn so much about the lore and fill in some blanks with the clever choices made by the devs. Here, you’re skulking around Isengard as it was before Saruman bulldozed the Wizard’s Vale, playing Gríma Wormtongue as he snoops upon Saruman deceiving Radagast the Brown about bad business in the world. Of course you get to meet Saruman of Many Colors, both as your own player during certain events, but this shot was taken in the same Session Play where you’re Gríma being all snoopy. 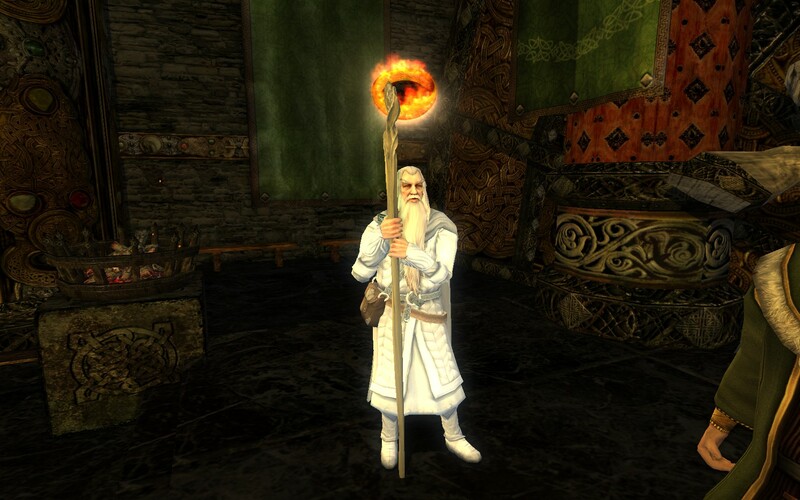 I have to say the art team did a fine job on the shifting colors on Saruman’s robe and on the palantír. 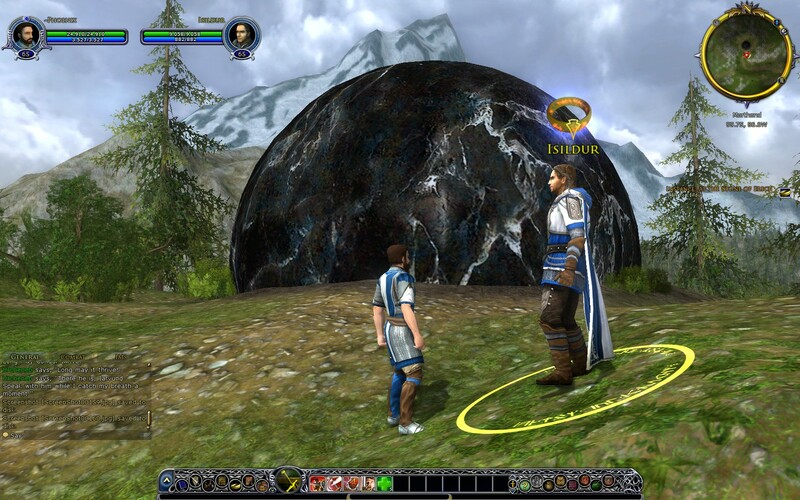 Of course these days, nine-year veterans of the game got a blue orb similar to the Orthanc-stone as a reward, while a red variant is available to buy from the LotRO store. 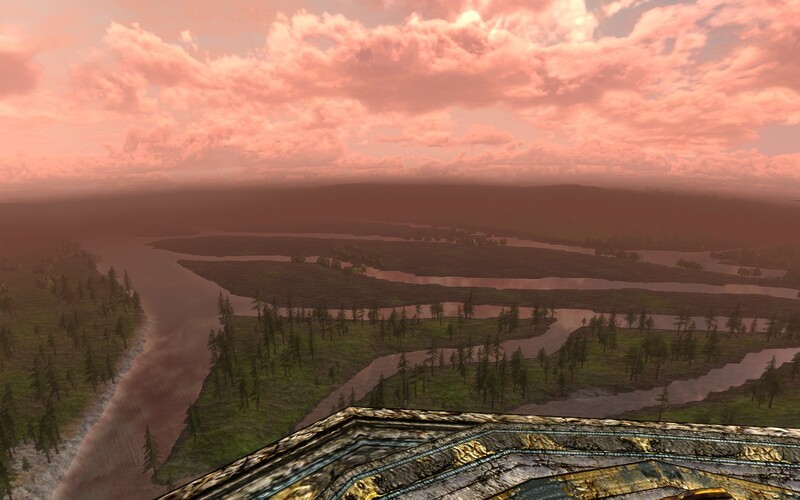 From the Seat of Seeing, players can look down upon the Entwash and into Rohan itself. This particular shot came from a rosy morning some years ago. Love them or hate them, but warsteeds are part of the game. 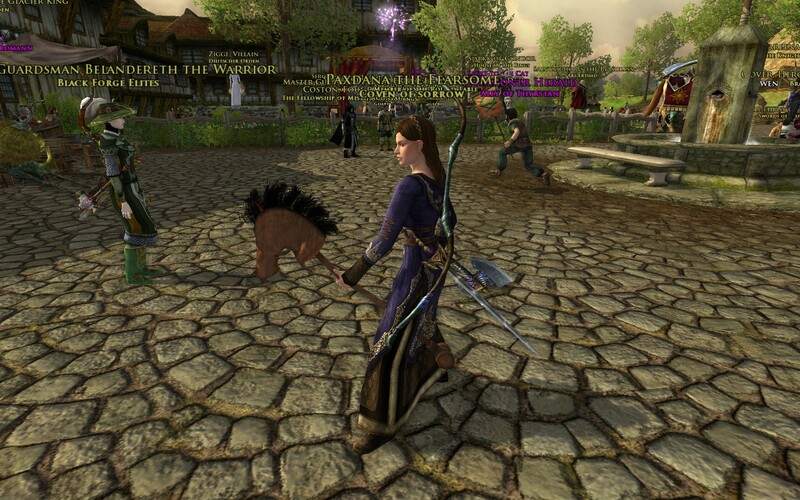 It was the first time there were new manes and tails applied to horse models, and while there is always some consternation regarding the prices of warsteed cosmetics, there actually is some customization available. Unlike regular mounts, warsteeds are very much faster, and they don’t stop on a dime, even if you go into combat options and change the option that prevented an automatic slowing down once you let up on your movement keybinds. And you can also fight from a warsteed in certain places, which you can’t do from a regular mount. I honestly can’t wait for Professor Corey Olsen to stop here on his travels through Middle Earth. 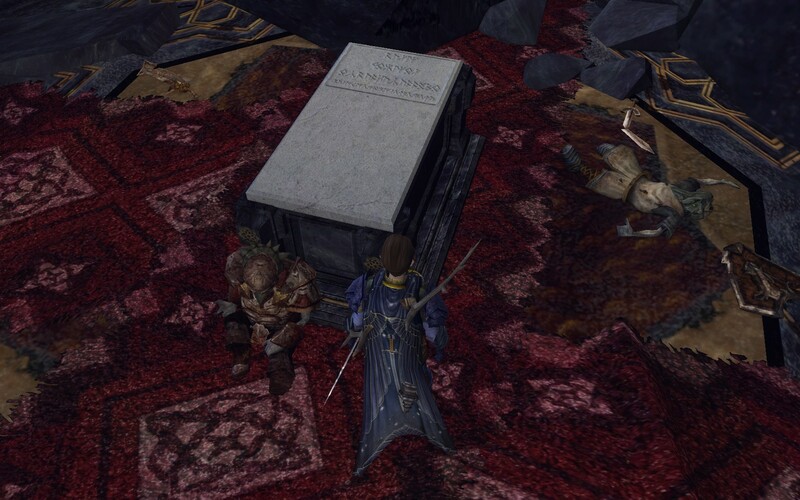 This is probably one of the nerdiest places for lore in the entire game. This hallow is a memorial of the first King of the Riddermark, Eorl the Young. The developers created standing stones (pun probably not intended, but a nice nod these days) that portray scenes from Eorl’s life. Not only does the art include suitable celtic-style pictures of various events in his life with some lovely knotwork, each image has an inscription in runes similar to the ones on Thorin’s Map in the Hobbit. What’s so awesomely nerdy about this is that the letters spell out words in Old English that are a translation from Sindarin. Someone in the studio must have a degree in Anglo-Saxon history and literature and wasn’t afraid to use it. 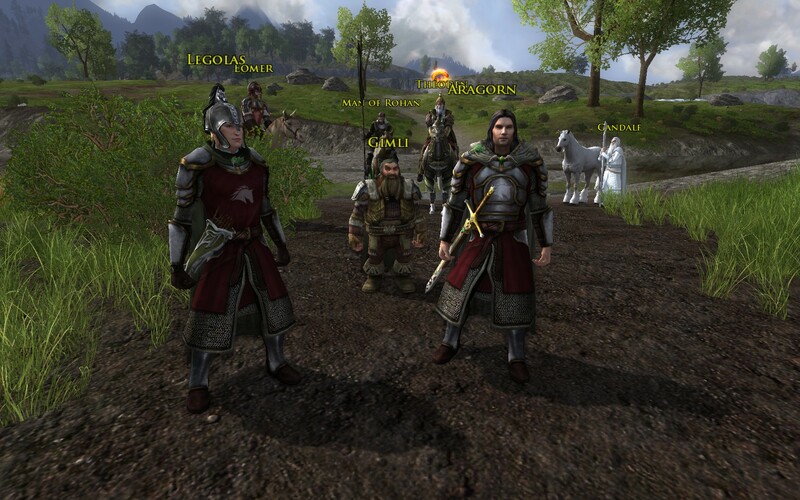 Here we are, the most northern border of Gondor as it was of old featuring the likenesses of Isildur and Anárion. There’s some debate which is which, but I’d probably presume the king on the left is Isildur, simply because his beard seems to be longer and crown a little bit fancier. This place in-game gets quite lovely during the afternoon into dusk and isn’t to be missed. 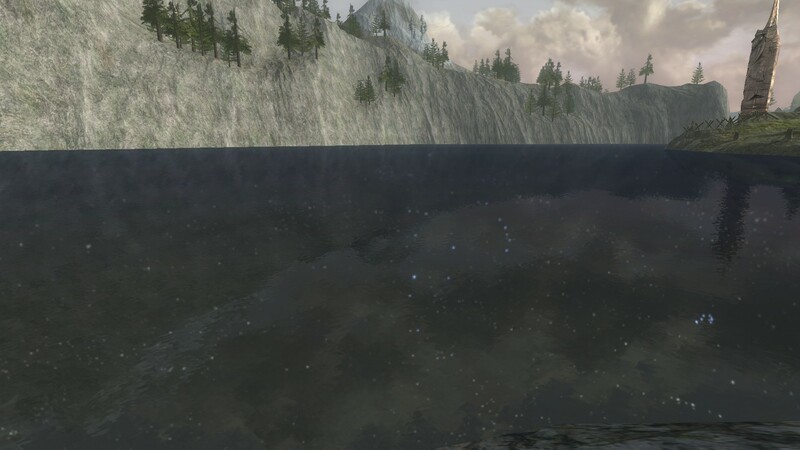 This is the lake between the Argonath which you can see in the distance, and the Fall of Rauros. I caught this one shortly before dawn, with the pinks in the east presaging the rise of the sun. In yet another cool Session Play, you get to drive various characters from the Fellowship as they camp on the shore of Nen Hithoel, preparing to decide which way to go. 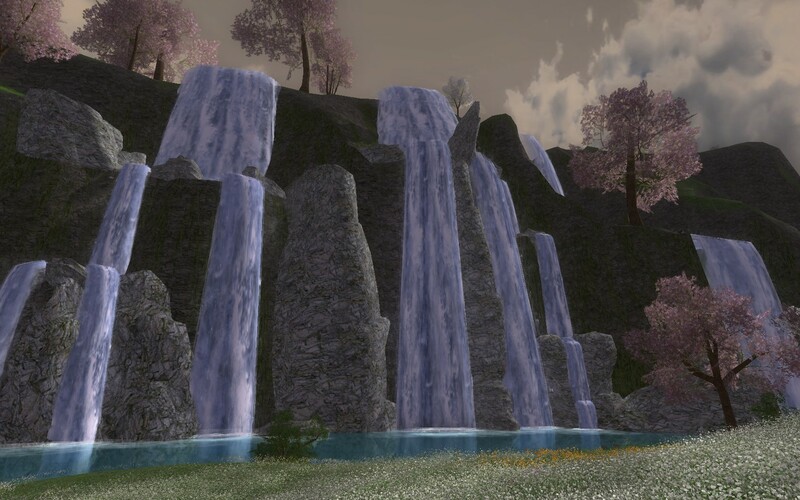 As your regular character, you will eventually travel here on your own to learn what you can from this incident, but first you get to play through the Breaking of the Fellowship and the tragic death of Boromir. 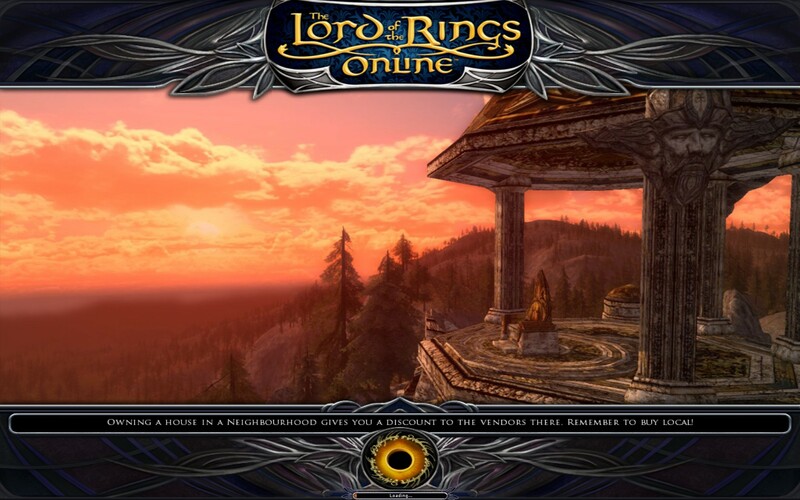 This is one of the loading screens you get after the Session Play, one showing the Seat of Seeing with a rich sunset in the background. Speaking of sunsets in Rohan, I’d have to say that the only place more gorgeous for weather and atmospheric effects than the Shire has to be Rohan. You can get some amazing screenshots from various places in the Wold just by waiting for the right time of day, and this one is in the Norcrofts right before sunset itself. Rohan also received the first serious weather upgrades in the game since its launch. While Rohan can be gorgeous on clear days, it can also be a bit scary on the bad weather days. 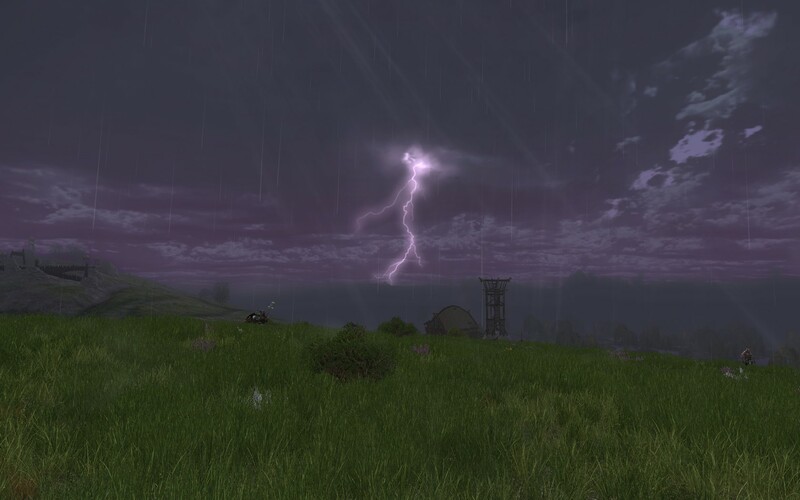 I may have taken a stupid number of screenshots in order to catch this perfect one of the lightning, but some piece of ground just had a very bad day over yonder. I also like how the rain lashes around as if driven by the wind, as well as the gloomy distance effects. The environmental team really outdid themselves here. Back to clear days. This is the famous Entwade, which you couldn’t cross at one point until they opened up the Westemnet for gameplay. You see, Rohan was so huge in terms of gamespace and what the devs wanted to do with the story, they had to break it up at this natural boundary into Eastern and Western Rohan. So, for some time, all you could do was look across this beautifully reflective river and wait until you could play on further. As you approach Edoras, the capital of Rohan, you will pass between the barrows of all of the previous Kings of the Riddermark. 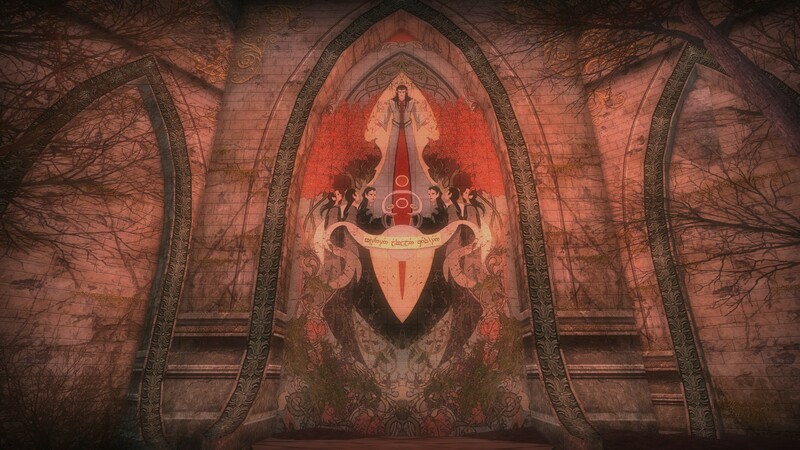 Each one has the king’s name engraved in runes above the door, and the simblemyne does indeed grow on each one. I’ve always tried to show some kind of respect and not ride up and over the barrows, even though it’s only just pixels in a computer. For some reason, this creation within the game generates a sense of awe and reverence in me that I rarely get anywhere else. 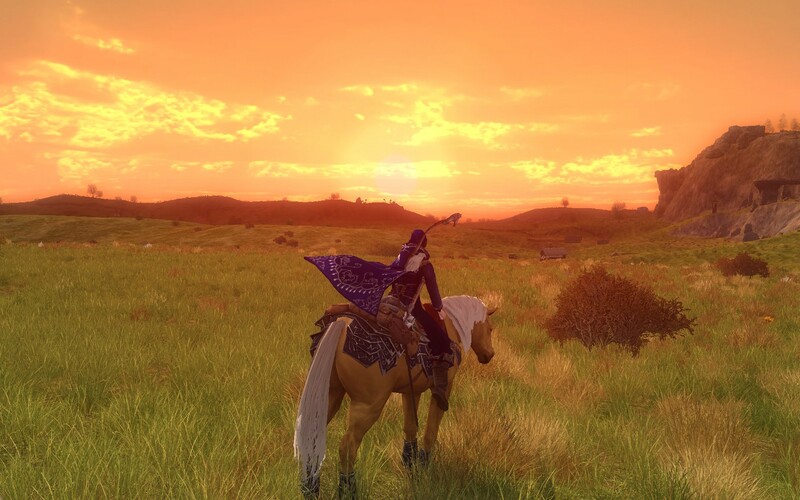 Sunrise over Edoras is a rather gorgeous affair. 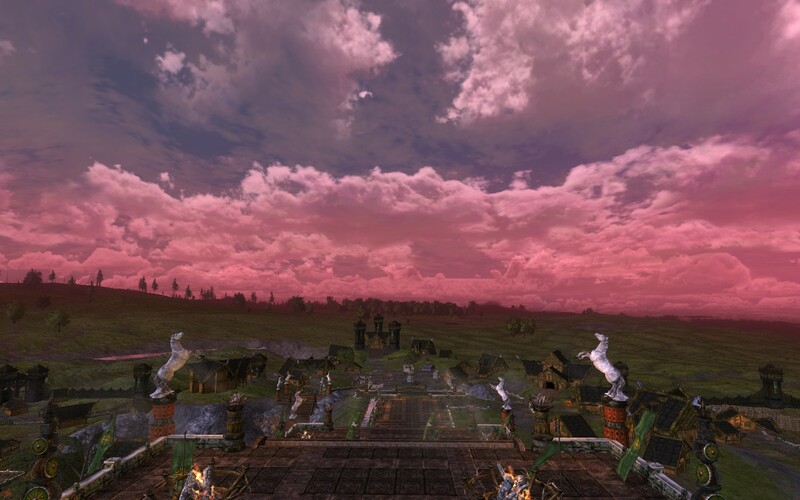 As the darkness shifts into the pinks of pre-dawn and then into the game officially indicating it’s daytime, you can see the wide spread of the land in the Kingstead, although this was taken before draw distance was improved. 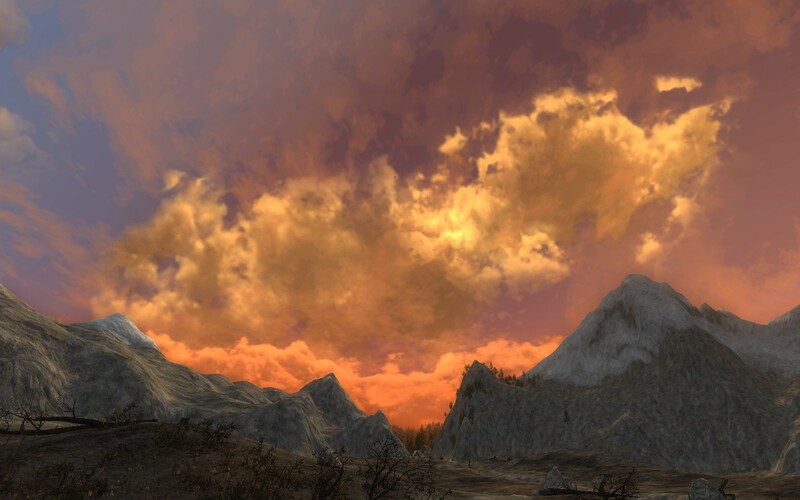 Sunset over Edoras isn’t to be sneezed at either. 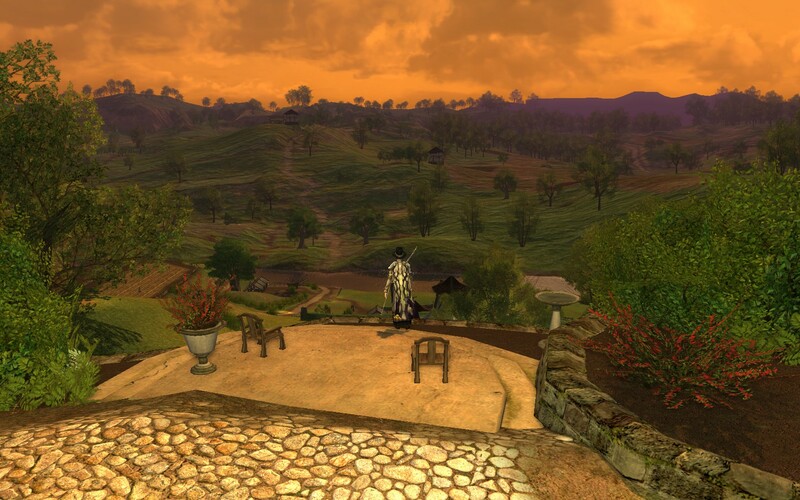 Again, this is about the only place other than the Shire that has the best sunsets in the entire game. 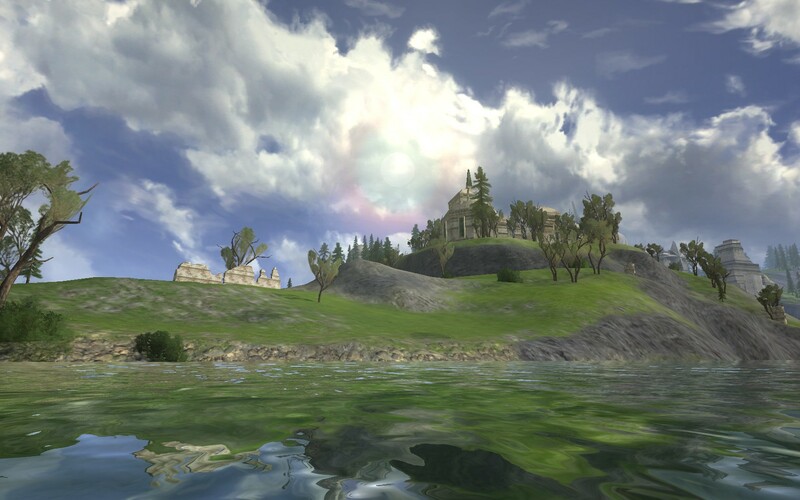 I think here it’s because the devs improved their cloud effects and lighting techniques in the years between the creation of the Shire for launch in 2007 and the creation of Rohan for launch in 2012. 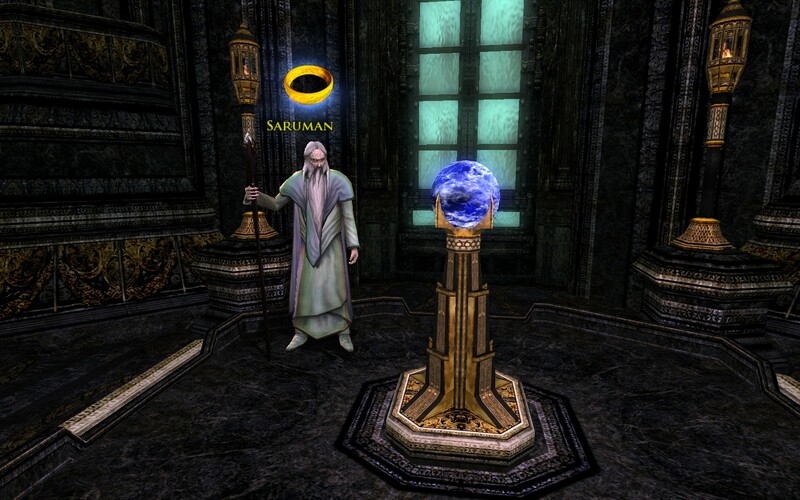 While I’m a big fan of Session Play that lets you sneakily participate in great events in Middle Earth, there’s one event that you get to participate in as yourself, and that is the freeing of Théoden King from the Saruman’s mind control. 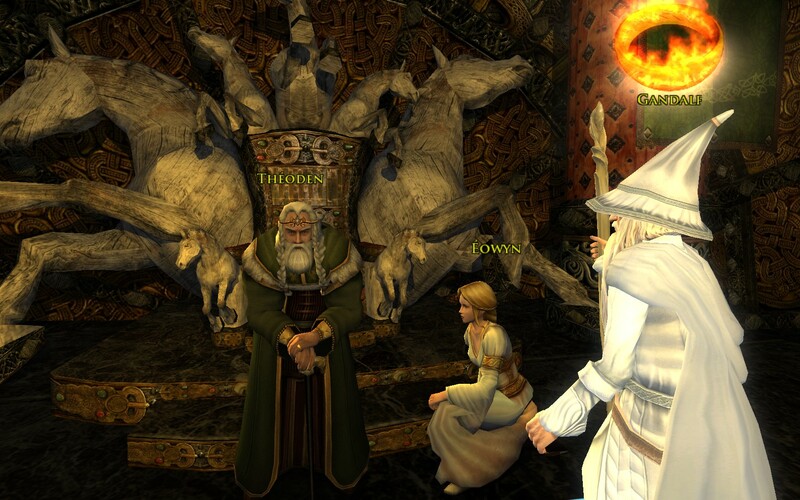 Here you get to see the big names as well as the two lesser names, Horn and Gléowine, both of whom are canonically mentioned briefly in Return of the King but are major players in the Rohan questlines here in-game. Here we are in Meduseld as Gandalf has revealed himself as the White and bid the king to breathe the free air again. Unlike in the movies, the trio of Aragorn, Gimli, and Legolas are much more passive and it’s Gandalf who is the focus of the events. Having cast off his grey attire once and for all, Gandalf now stands hatless but shiny, Glamdring the Foe-Hammer at his side. While he’s naturally the centerpiece of this screenshot, my eye also keeps wandering around to the exquisite celtic-style knotwork on the walls and tapestries behind him. The art team may very well have devoured an entire medieval art museum to then create and embellish upon the art style to create something so correct for how Tolkien described the Rohirrim and their culture. See what I mean? 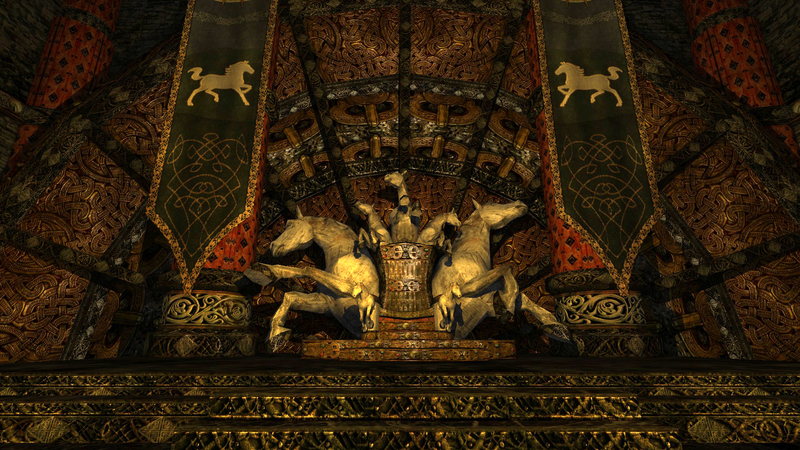 While you get the cruder but still quite impressive wooden horse carvings, the detailing on the metalwork arch behind the throne itself would make any medieval art historian keel over in delight. Having been to the British Isles on several occasions and dug through various museums there, particularly in Ireland, this is such impressive detailing to be rendered in a game space. 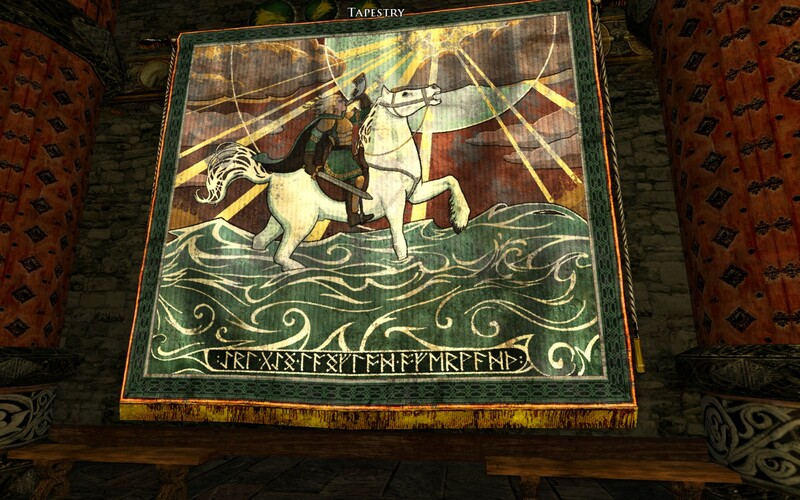 One of the cooler things about many Rohirric locations, particularly Meduseld itself, is the faithful creation of tapestries that detail various scenes throughout the history of the Rohirrim. This one depicts a much kinder and less evil-looking Saruman accepting the Key of Orthanc from Steward Beren of Gondor. The artistry of the tapestry and cleanness of the lines has always appealed to my sense of decent art. However, if you squint at it pretty closely, you can see the sort of lines and shadows that clearly indicate this is indeed the depiction of an actual woven fabric. This tapestry depicts Eorl the Young blowing his horn as he crosses the Anduin, headed to the fields of Celebrant. As before with most Rohirric objects, there are runes involved that describe the scene. This is my favorite tapestry in the game for one singular reason. This one tells the story of Aldor the Old driving the Dunlendings from Rohan. The story itself is heroic enough to be remembered this way, but you’ll see in the next picture why I like it so much. 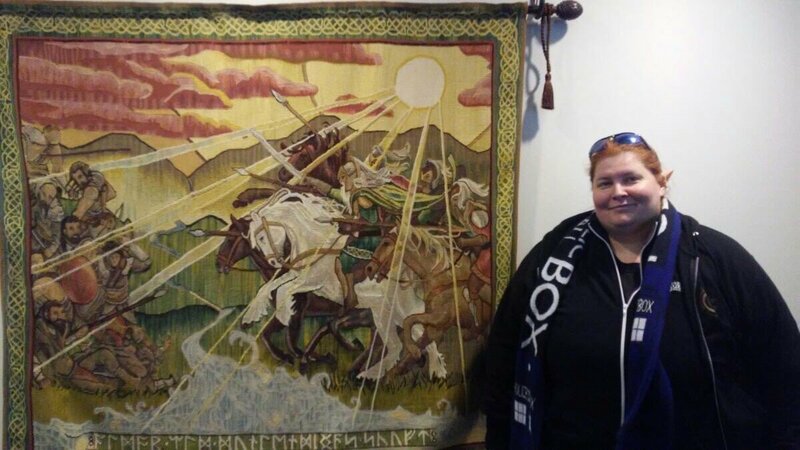 This real life version of the tapestry currently hangs up in the Standing Stone office near their streaming studios. Yeah, that’s me, and yes, I wore elf-ears to the studio. However, let’s talk about the tapestry itself. It matches the general art of the in-game tapestry pretty closely. I love how the colors of the real one are so vibrant and rich. To be fair, modern crafting allows for synthetics and laboratory-created pigments, but this one is less abstract in art style with a wider color palette, so there’s more depth to the image. Cordovan wasn’t able to tell me who made it, but I wouldn’t put it past one of the amazing players who’s a wizard at this ancient craft. It’s not the only gift from a player on display at the studio. For example, there’s a gorgeous chainmaille wall hanging featuring the Dungeons and Dragons Online logo on the wall opposite this. Ah, the tragedy of the prince of Rohan. Here he is in full vigor before his death at the Fords of Isen. You as the player will get to play through that sequence, but here he is before that sad event. The storyline in Rohan adds to his personal history, and if you follow the epic quests, you will meet someone very dear to him who will be distraught at his passing. 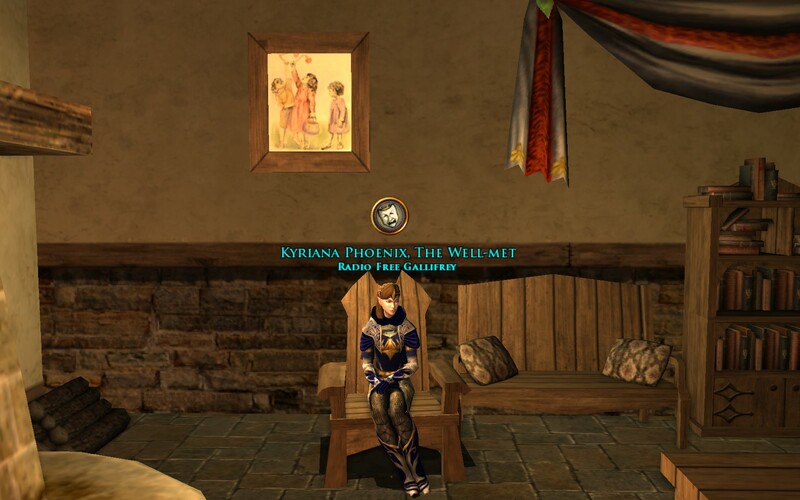 During some of your adventures in Rohan, you will get to interact with the book characters in significant ways before being sent off in the usual sort of leveling side quests all over the place. The devs nailed this sequence on the head, the ride of Théoden King to the Fords of Isen to try to discover the fate of his son and provide support for the missing Erkenbrand. I like this shot because it features the king, Éomer, and Gandalf in the background as you talk to Legolas, Gimli, and Aragorn. I like this because of the Rohirric gear Legolas and Aragorn are wearing, while Gimli’s size means he’s got to wear something else. Also, let’s face it, Andúril in its fine sheath does also draw the eye. It should be interesting to note that Aragorn is left-handed in-game, much like Bernard Hill (Théoden in the movies) is in real life. During this instance, you can lead the king’s army toward the Fords of Isen if you want, and it’s a rather orderly procession. If you’ll notice, Legolas is riding elf-fashion without a saddle or bridle, and Gimli is carefully perched behind Éomer. I loved this scene in the game, because much of the side story in Rohan was ignored for the Jackson movies, and I really liked seeing the king do more to raise hopes in his own people than they let him do in the film. Okay, this was a bit of a silly picture if you think about it. You’re at the Fords of Isen, there’s a lot of dead Rohirrim and orcs and Dunlendings about, but all I can think of is booping Shadowfax’s nose. I know it wasn’t intentional, but I’m easily entertained, so I like this one. Another important side story ignored by the movies is the existence and travel of the Grey Company to seek Aragorn their chieftain. While you get to do a large number of quests with them to organize them for the journey during your time in Enedwaith, filling in the blanks left in the canon as to how they got to this important meeting, here is a key moment when the meeting takes place. 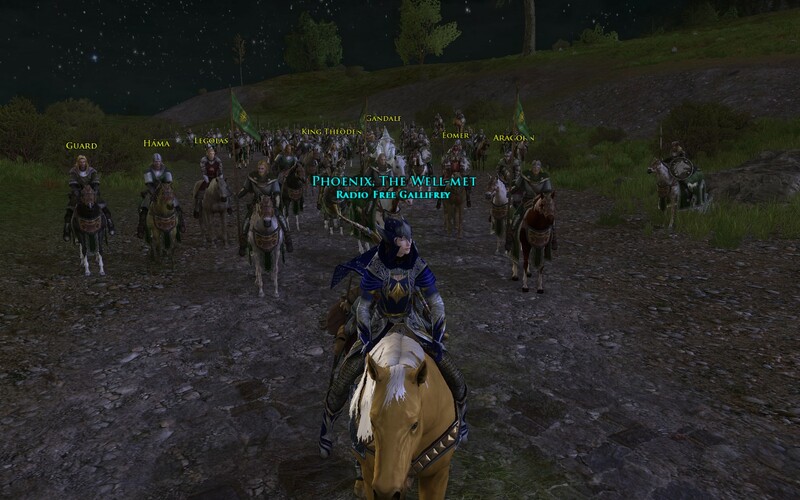 You as the player get to actively participate in this event by riding with Éomer to challenge the riders coming up from behind. 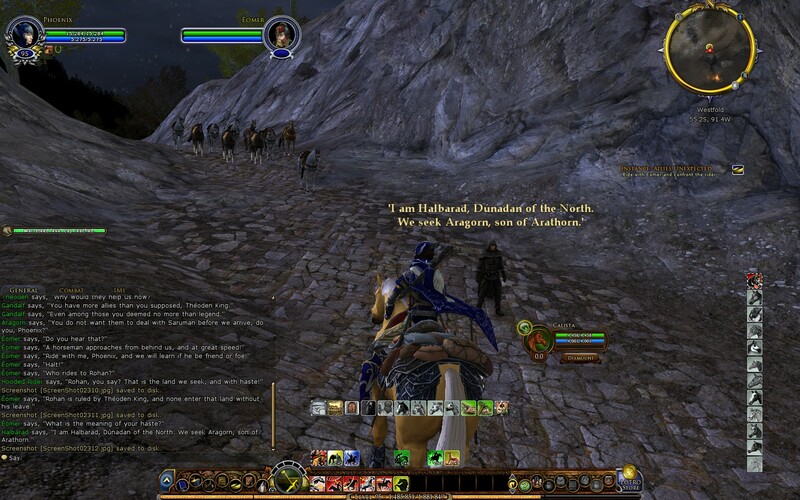 As you can see from the fact I left the UI on, it is indeed Halbarad and the Rangers come to join their leader. 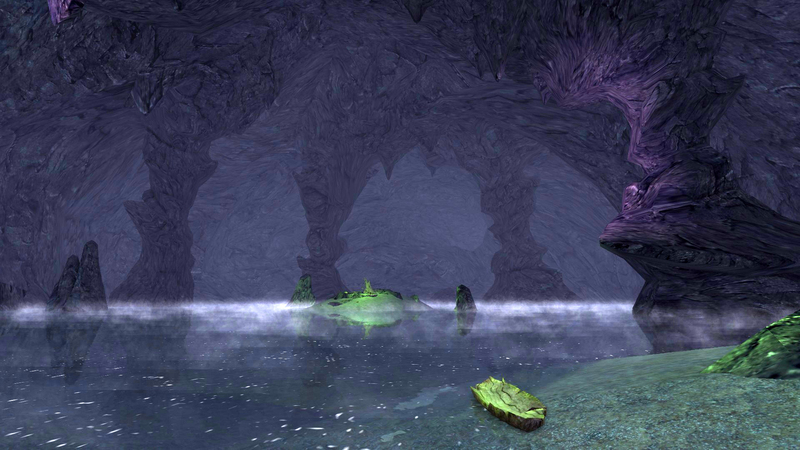 It’s a shame you can’t just randomly visit the Glittering Caves, because it’s really quite lovely. Those who have read the books and the Appendices will know that eventually, Gimli will settle here and become Lord of these caves. For now, during the Helm’s Deep big battle, you get to fight to protect the women and children below the keep to ensure their safety. The lighting effects and the small dashes of color along the walls truly let it live up to its name. Still, I’d be curious to see how it would look if it was re-rendered with current tech. It could be made shinier, don’t you think? Despite the fact that we’re now resolutely in the South of Middle Earth as we know it, there’s still the frozen lands of Wildermore to cope with in Rohan. 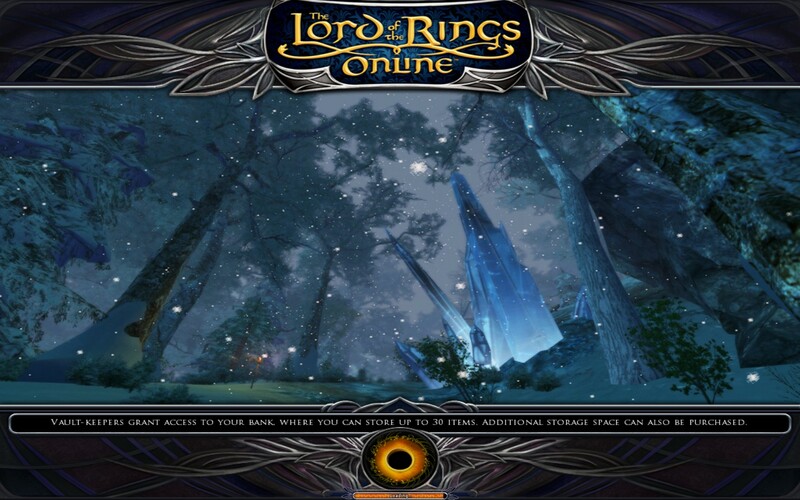 Here’s one of the loading screens featuring the strange crystals randomly growing up out of the land. They may be giant ice crystals, they might be regular crystals that simply have an ice debuff around them, but it was always interesting to get the icy overlay on your screen whenever you got too close to them. Horn, the canonical Rohirrim, and Nona, the Turbine-created Dunlending girl who you first meet in her native lands, both exiled by their rulers but questing together. Eventually, as you can see, they finally learn to care for one another. 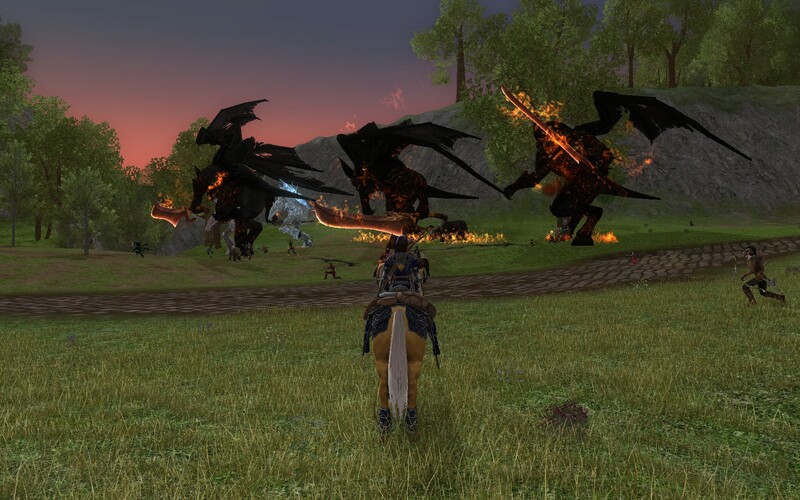 Here they are in one of the in-game cutscenes as you and they watch the march of the Huorns in Wildermore. Again, the in-game text needs to be seen. In this Session Play, you get to play through Entmoot. The photo really doesn’t do it proper justice, because as you’re playing as an Ent, the figures of Pippin and Merry zip around the screen while you and the other Ents move at what seem to be normal speeds, and time passes much more quickly from day to night. I thought it was a really cool way to show the Ents’ side of the moot rather than seeing it from the hobbits’ point of view. At the end of your adventures in Rohan, you too will pass through the Door of the Dead, although you do so at first to rescue an errant child. The dev team stepped up the creepiness factor by adding the fog effects and the dim lighting with the glowing fires at the door. Of course, Aragorn, Legolas, and Gimli had already gone ahead and you will rejoin them on the other side, but for now, you’re on your own. 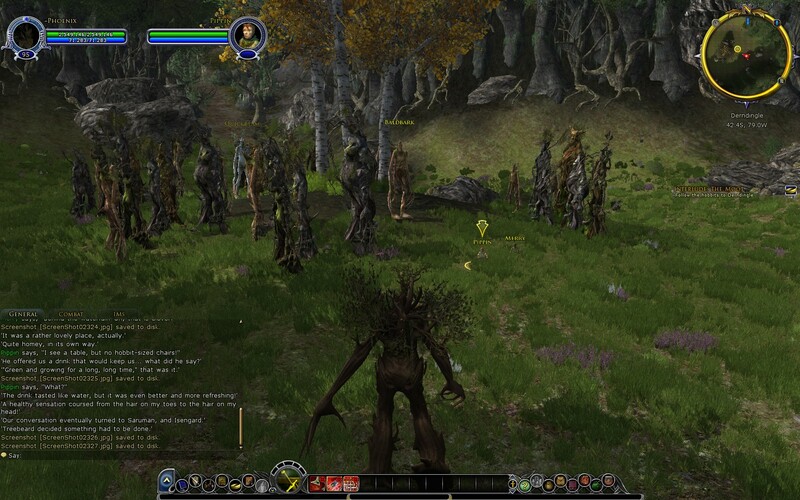 Update 14 brought the Paths of the Dead into the game, where players could follow Aragorn through into Gondor. 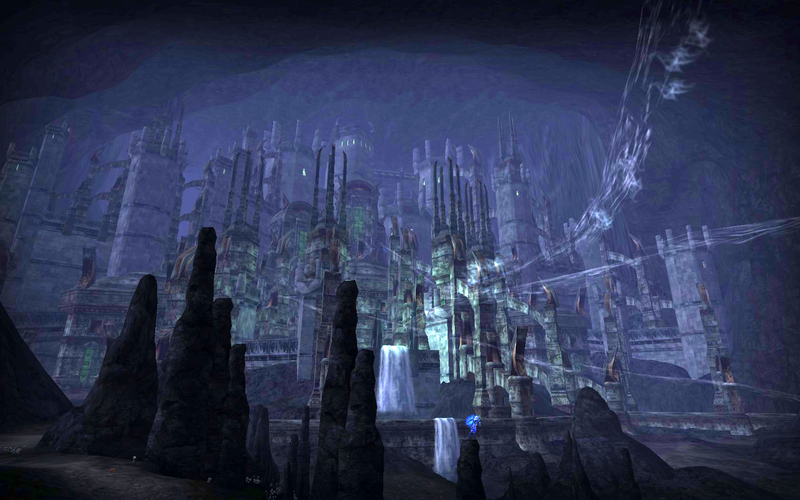 This screenshot did get a lighting tweak because the original was just too dark, but you can see the rich blue-colored shades that the game uses to represent this set of Oathbreakers, and their ancient city underground. While at first, players only get through a brief quest to get in, eventually you’ll complete that and can actually pass to and fro along the path either way afterwards. Again with the Session Plays, this one played through during your time in Enedwaith but took place in Gondor. 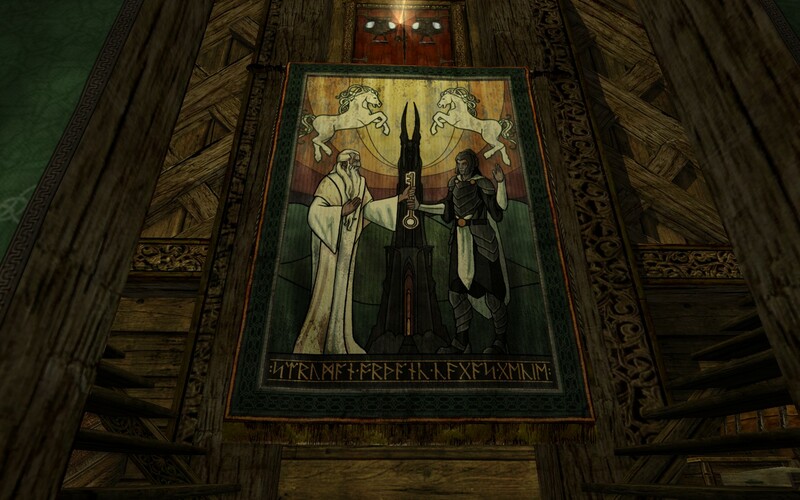 Since your journey in Western Gondor will definitely involve the fallout of the infamous Oath taken at the Stone of Erech, it’s no surprise and quite awesome that you get to play one of Isildur’s men and witness the actual oath-taking. However, I do have to wonder how in the world they managed to bring that huge thing with them from Númenor in the Second Age. As you go visit the Stone of Erech as your usual self, you also get to go through a Session Play involving what happens when Aragorn passes through earlier. 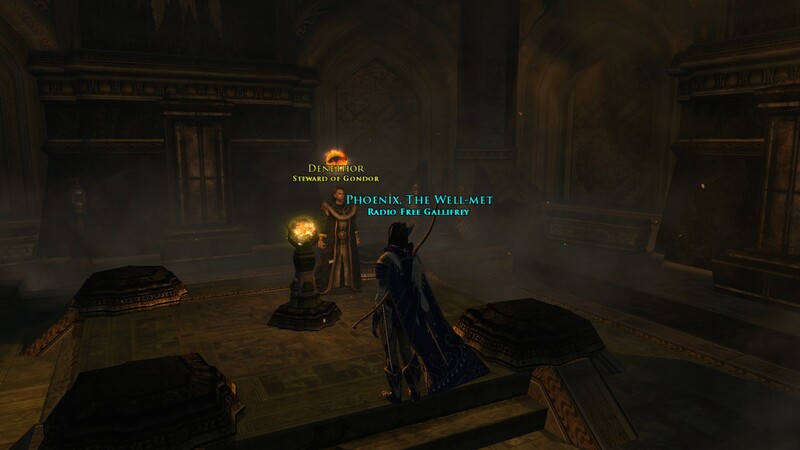 The devs added a layer of interesting story to the original canon, supposing that there were actually two factions within the Oathbreakers, ones who wanted to follow Aragorn and be done with their unrest and others who still wanted to follow the will of Sauron. This is also one of the few times where you can make an actual choice in the game story and get two different endings to the Session Play. You can either follow the unrepentant shade or follow Aragorn, and you get different results either way that don’t affect your gameplay, but it’s interesting to get to make such a decision. This is what you get if you follow Aragorn. I love the nameplates on the Grey Company, Aragorn, Legolas, and Gimli, all each in the mindset of the shade you’re playing. 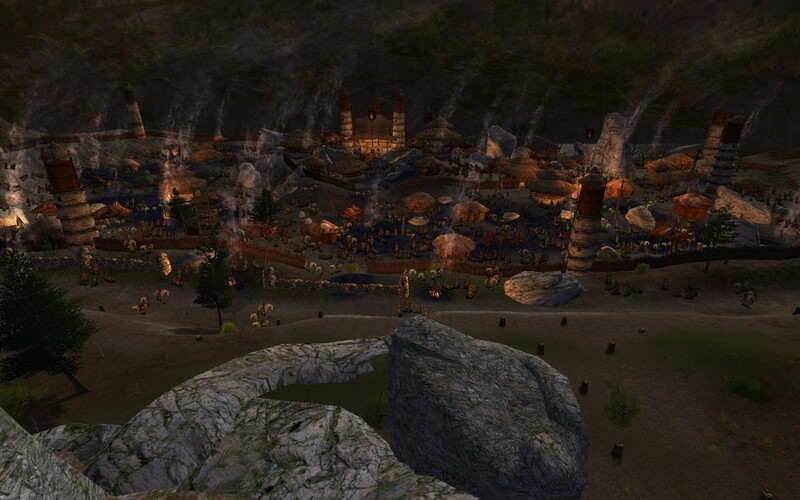 The first hub you get to visit in Gondor, the beautiful city of Dol Amroth is a wonder to visit. 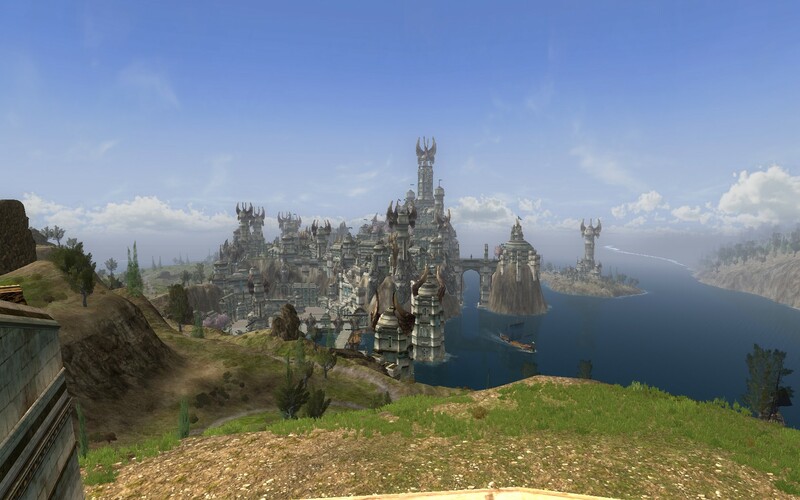 Until the story marched on toward Minas Tirith, this city was home to a metric ton of dailies and quests that led you riding all over the landscape to help the locals defend their land against the Corsairs of Umbar and other such fell beings. 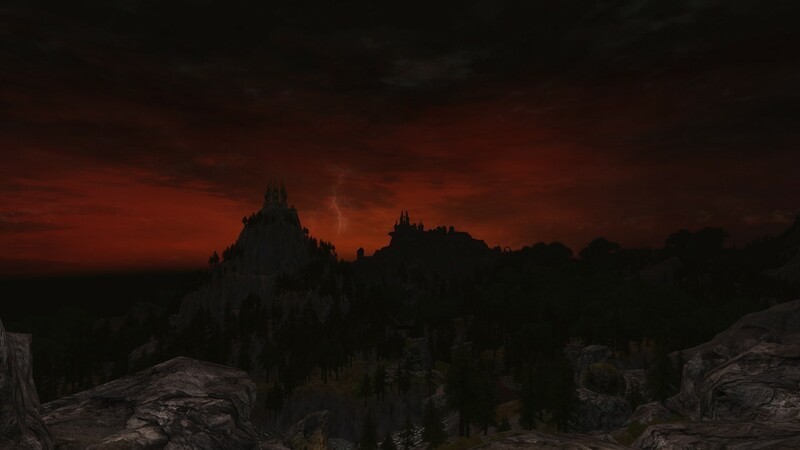 There’s a lot of Gondor that doesn’t really get epic skies until after the Battle of the Pelennor simply because of the Dawnless Day, but Dol Amroth is the exception to that rule. At the right time of day, you can see magnificence as it reflects off the waters of the Cape of Belfalas. Of course life isn’t peaceful in Western Gondor. With Prince Imrahil away in Minas Tirith, you get to help his daughter Lothíriel deal with Corsairs intent on sacking the city while it’s lightly defended. They are most unpleasant fellows. 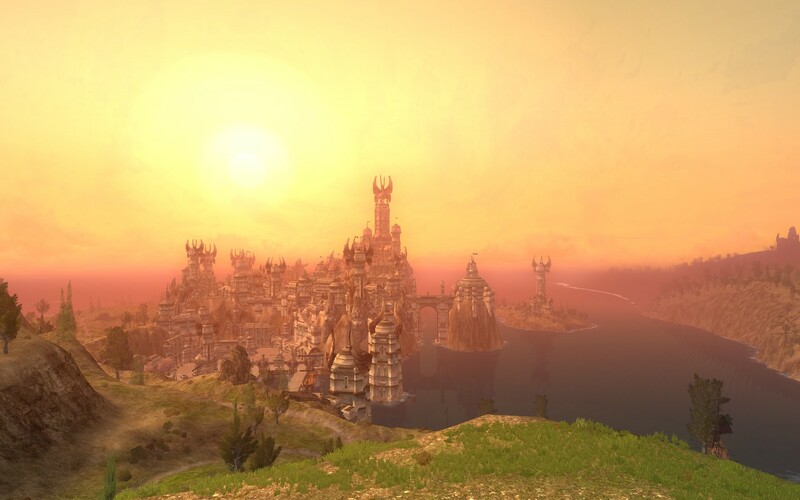 Added with Update 19 in 2016, the Cape of Belfalas hosts the first premium housing area in the game. 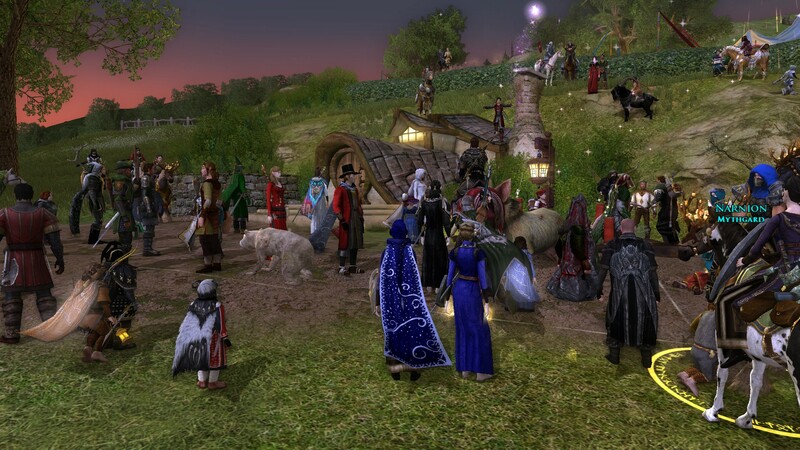 For Mithril Coins, players could purchase Gondor-themed homes, and VIPs didn’t have to pay upkeep. The houses had a vast number of hooks for items to be placed. For the first time, players could purchase an entire island for the exclusive use of their kinship. This is Tol Falthui, the largest of the two, featuring a mansion, two huge yards, and even a stage there in the distance. My favorite bit of Gondorian architecture is the use of this translucent blue fabric, first seen in Dol Amroth in Update 16. I have used a very similar blue fabric in crafting in real life, and it tickled me to find it in-game. 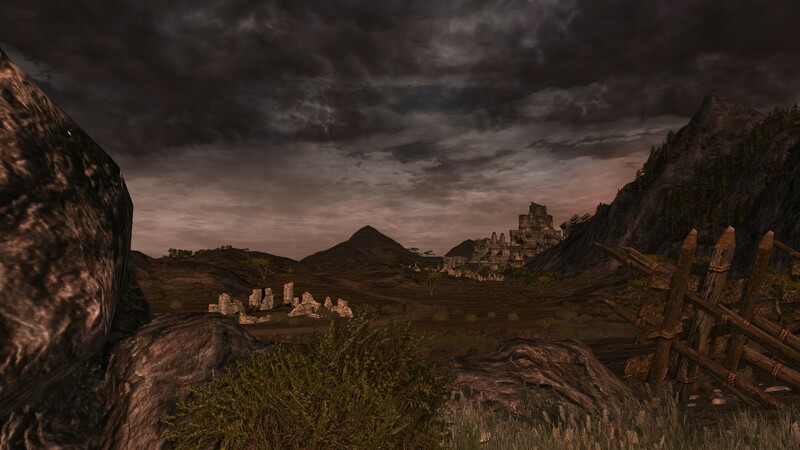 As you progress through the epic storyline in Western and then Central Gondor, you will help Aragorn’s forces recapture Pelargir, the oldest settlement in Gondor, and then eventually meet him once more in the company of the Oathbreakers. As usual, the game goes back to the source books rather than follow the movies, and you will witness Aragorn acknowledging that the Oathbreakers fulfilled their duty at Pelargir and were released from Isildur’s 3000-year-old curse. 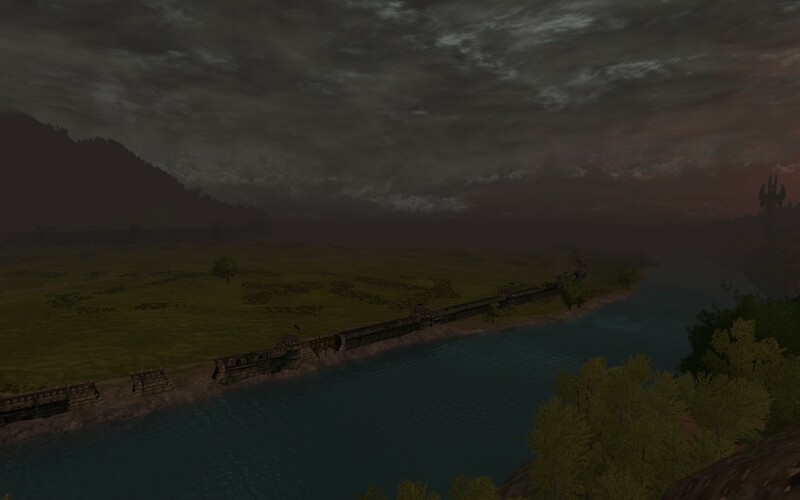 Looking across the Anduin, you can see the shadow of Minas Tirith shrouded in gloom caused by the Dawnless Day. This is the Pelennor and the rather damaged Rammas Echor. 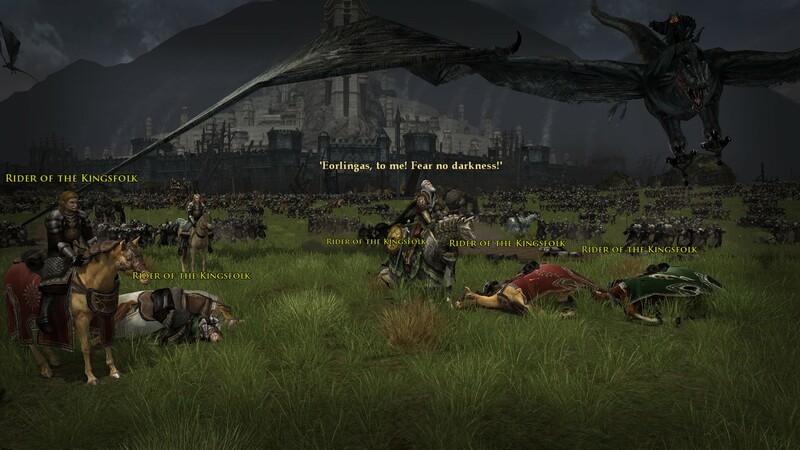 Until Minas Tirith was added into the game properly, this was as close as you could get to the coming battle. No detail is overlooked by the developers. Here is the statue of the king that was defiled by the forces out of Minas Morgul. After the Battle of Pelennor Fields, the area flips into being held by the Free Peoples, and you can complete a quest to help clean up and repair the statue. 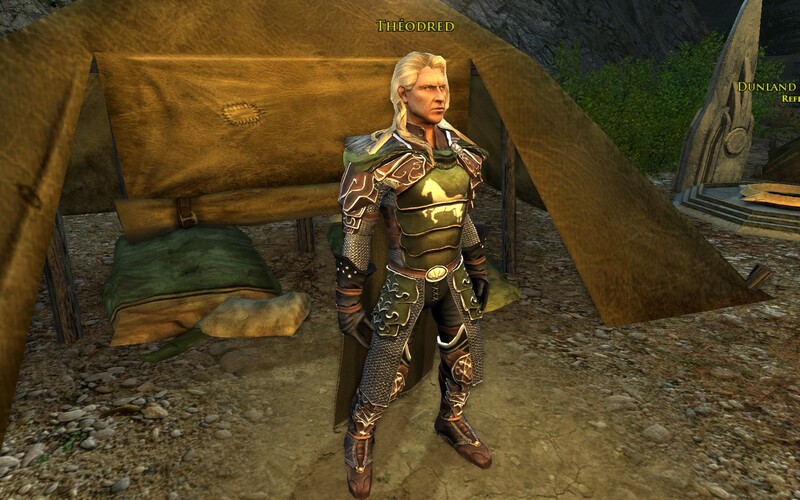 Wearing perhaps the fanciest set of armor of any NPC in the game, this is Prince Imrahil of Dol Amroth, in charge of the forces of Gondor thanks to the lack of support from Denethor. He’ll send you on some quests, and you’ll help him during the Siege of Minas Tirith epic battle. This is the famous throne of Gondor, a seat that hasn’t been used in over a thousand years. The art team certainly had a field day creating this and making it so elegant. I particularly like the jewels taking on the role of leaves in the White Tree, as well as the image of the winged crown over the actual seat. 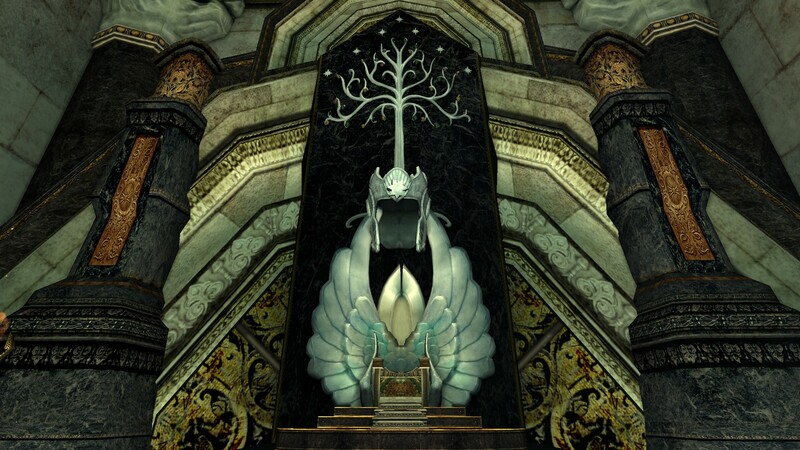 And also, true to the book although it didn’t fit in this screenshot, the plain black chair of the Steward of Gondor is parked on the lowest step down from this dais. While I’m not asking anyone to confess, I know a number of you people went and sat on the throne, didn’t you? In a twist just as powerful as finding out that Shadows of Angmar villain Mordirith was actually Eärnur, Last King of Gondor, we find out that this powerful villain is… the same guy. While it’s heartily depressing to the Gondorians to know their enemies apparently can’t die, I was utterly delighted to play through an instance with Gandalf in the Old Archives after this revelation in Osgiliath. You see, if Gothmog is indeed Eärnur, then he could reclaim the throne of Gondor and prevent Aragorn’s ascension. This curve ball makes entirely too much sense given the developers’ decision to cast the lost king as one of the launch game’s primary villains, and it’s a master stroke to see them picking up this ball after ten years and tossing it back into play like no big deal. I remember yelling at my screen when the quest text dropped this because it was just so perfect. I also may have asked one of the developers I know at Standing Stone to go hug Jeff ‘Made of Lions’ Libby for me for that instance because it was just so amazingly awesome. … and I’m not just talking the quality of the art here. The change of the water-like effects before you look into the palantír and then the smoky doom-filled effects afterwards is very striking, but again, the devs just had to drop in a twist. From this point on until Denethor releases you, you’re playing through a dream sequence called Minas Tirith Besieged. Not having delved into spoilers since I’d gotten behind on the epic story, I’d forgotten about this lovely bit. You’re going along doing quests like normal after this that culminates in the big battle, and it plays out like you’d expect, having either read the books and/or seen the movies, right? Then, as you witness the confrontation of Gandalf and the Witch-King after the breaking of the Great Gates, you’re expecting to hear the horns of Rohan. However, the Witch-King kills Gandalf! Wait, what?!? But you’re still in the instance, so you have to follow the instructions and race to save Peregrin Took, only you’re too late as a Ringwraith carries him off from the Pier atop the city. I remember the player community freaking out a bit when this sequence first came out, because at first nobody realized that it was all Denethor messing with your mind and that a good chunk of your past deeds were a part of his manipulations. I also remember breathing a sigh of relief as I came out of the instance and realized that no, the devs didn’t just derail the train. After you get out of the meeting from hell with Denethor, you get a quest to go find the Rohirrim before the Pelennor is closed entirely. The path you take pretty much ensures you should never ride your warsteed out in the forgotten paths where the Woses live. At the end of the brief chain, you get to be present when Ghân-buri-Ghân offers to take the Rohirrim through the boonies to get around the Orcs blocking their passage to Minas Tirith. 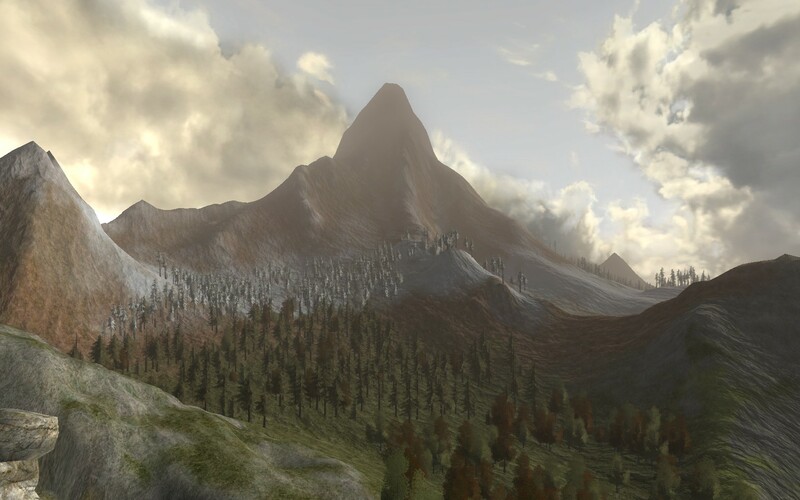 This shot came from atop Nardol, one of the beacons between Gondor and Rohan, looking back to Gondor and the Dawnless Day skies. Again, the environmental teams truly outdid themselves with making this place look beautiful and dreadful at the same time. 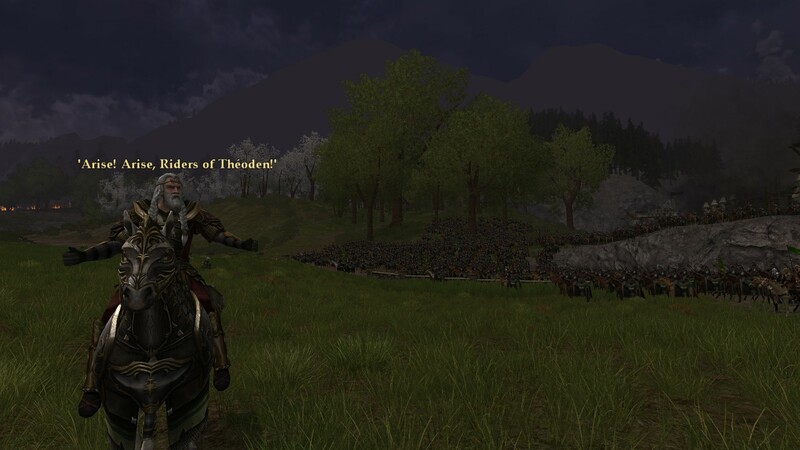 When you bring the Rohirrim safely around the Orcs and onto the Pelennor Fields, you get to hear Théoden King give a rousing speech to his army. The tech the devs used to create the Ride of the Rohirrim and in fact the entire Battle of Pelennor was amazing. As I was playing through each sequence, I really did feel like I was in a battle. The audio department needs special kudos on their work in ensuring that we as players kept getting the tumult one should expect in a huge battle such as this. I also want to heartily thank the devs for choosing to run the Pelennor as a series of vignettes instead of a huge epic battle. It made it easier to play through and made more sense. Also, even though I know the source canon said it had to happen, it’s still heartbreaking to see so many NPCs I’ve quested with and seen fleshed out into three-dimensional characters being killed. A fortuitous screenshot, even if a tragic one. Here’s the moment instants before Snowmane is killed and Théoden mortally wounded in his fall. I have to say that Standing Stone really did an excellent job with the animation and textures on the fell beast and on the Witch-King himself. While you observe from a safe distance, Éowyn stands up to and eventually kills the Witch-King with the help of Merry. This is definitely one of those moments when you the player should take a back seat to the canonical action, although you do get to actively participate in later events. This is a cool moment between Aragorn as descendant of Isildur defying Gothmog (aka Eärnur, aka Aragorn’s long-lost great-many-times cousin). Aragorn’s kingliness and rousing speech was apparently enough to get his older but less brave relation to flee. Now that you’ve beaten back the forces of Sauron for one day, Gondor is bright and sunny for the first time since we emerged from the Paths of the Dead to visit Dol Amroth. 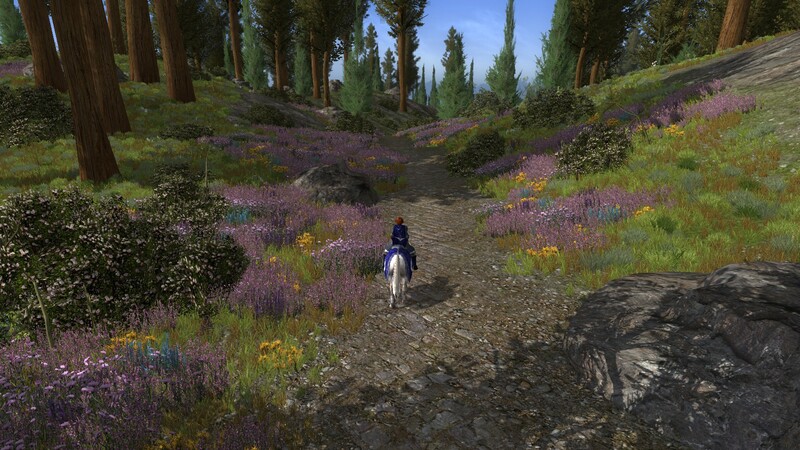 One of the lovelier places you can visit is North Ithilien, where the flowers grow in great profusion (which is very handy, considering you need to pick them to barter these days). This reminds me of the heather in Dunland near Isengard, or actually also like real life Scotland at certain times of the year. 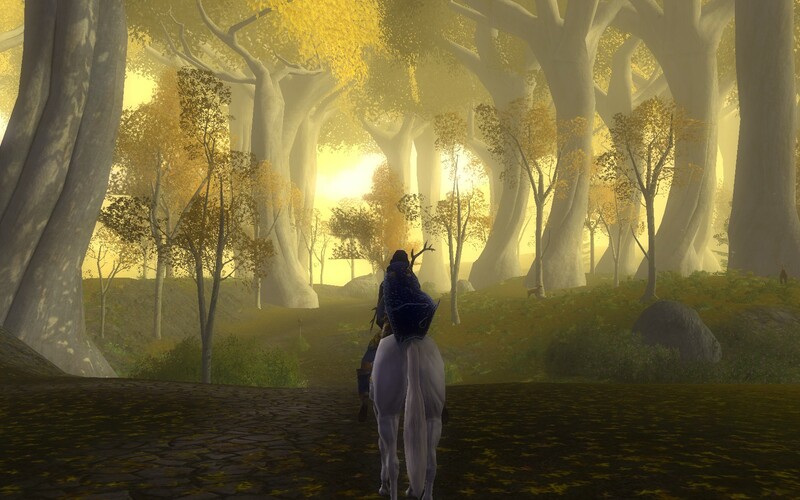 As I was roving through North Ithilien for the first time, I was struck by how lovely this passage is and how it represents the art team’s improvements over the last decade. A path like this with trees overshadowing it wasn’t possible to this quality even a few years ago. 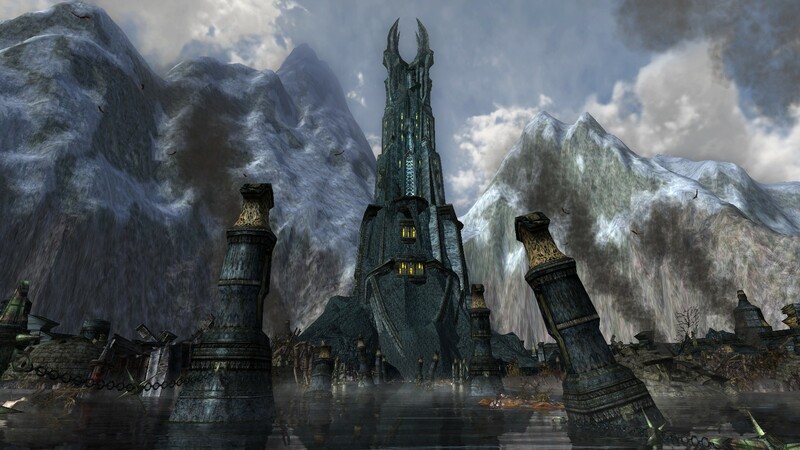 Described in the books as an island that splits the Anduin like the prow of a ship, Cair Andros certainly fits the bill here with the likeness of I believe that’s Isildur, the same as on the Argonath many miles to the north. And oh, don’t jump in the river. Much like in occupied Osgiliath earlier, apparently you can’t swim in the Anduin in Gondor. While it’s not an instant death like in the frigid waters of Forochel, it’s still death if you don’t get out of the river before it’s too late. 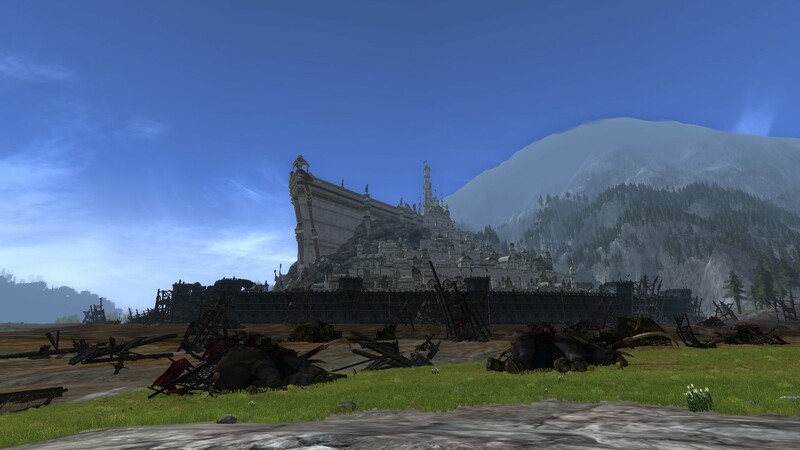 Minas Tirith looked pretty cool and impressive when you first arrive during the Dawnless Day, but it looks positively magnificent in the sunlight after the battle. I remember when previous community manager Frelorn had shown us an alpha version of the city before it was first available to players and it looked impressive even then. Finally heading into current content, this is a screenshot of the Wastes, the latest zone added to the game for players to fight against the Enemy and his forces. For awhile, until Update 20 was released, this was an invisible barrier you couldn’t cross. There weren’t any mobs roaming around out of sight either back then, but there are now, so be careful. 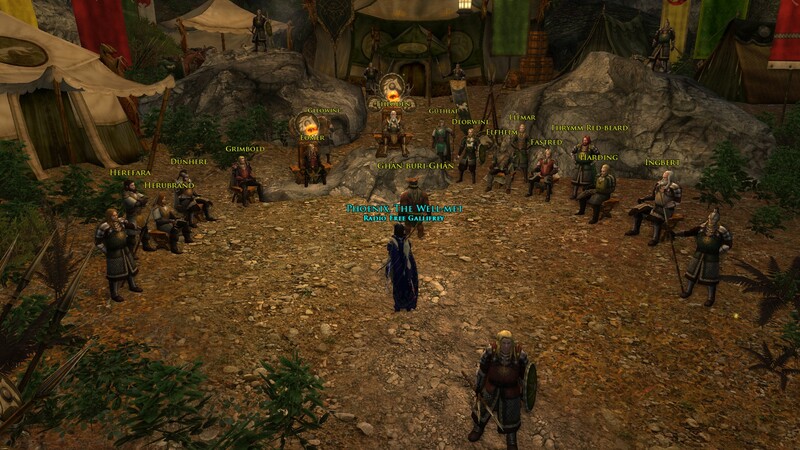 Even before Update 20 was released, Standing Stone had been testing earlier content on Bullroarer. 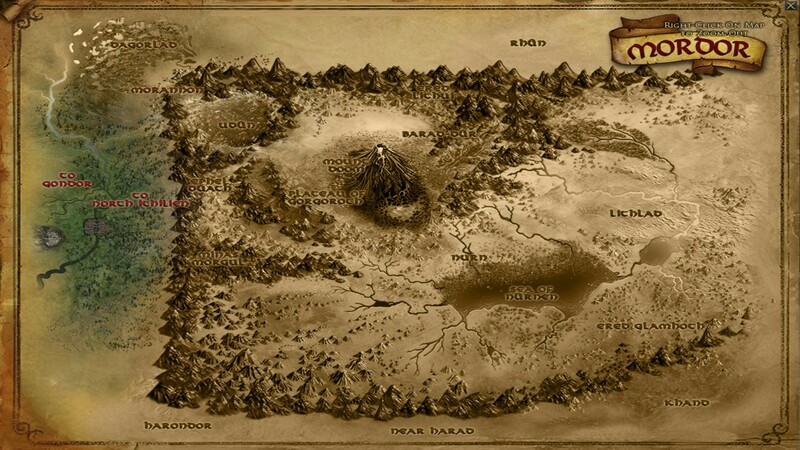 Imagine our surprise when a map of Mordor was discovered. I sort of think that it wasn’t intentional at first, but they never removed it during that testing cycle. It’s actually quite intriguing to see this early iteration of what will eventually become a playable map with the upcoming expansion in Update 21. Speaking of updates, did you know that the update numbering system started with the launch of free to play in 2010? Yep! Until then, we had the first three expansions listed as Volumes and two major non-expansion updates were called Books. The three subsequent expansions were simply given update numbers like Mordor will be 21. Old enough to finally drink some orc grog! Back to seriousness. 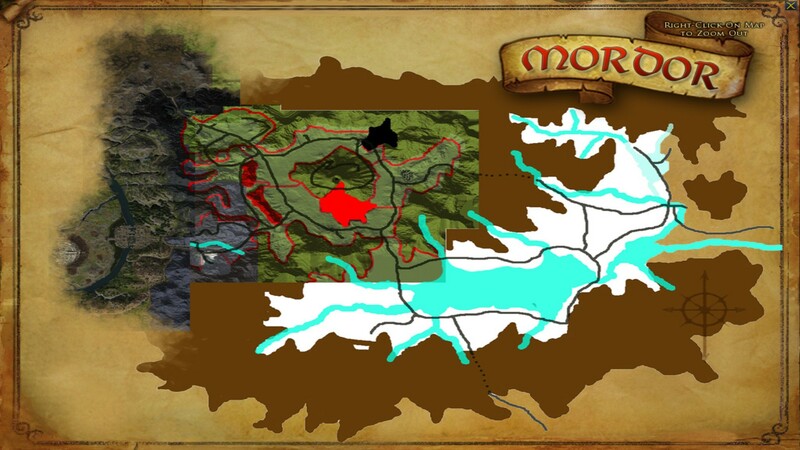 Here is the current Mordor map in-game. It’s not clickable at this time, nor does it show any playing zones, but it does give you an idea where we’re going after the End of the Ring. I like the sepia-style tones while it’s not playable yet. Time to end our passage through the game’s zones and overall story with a little bit of a silly picture. While it’s very unwise to stand too close to the Black Gate and the Towers of the Teeth because you will die to a debuff, there’s a goodly wind here, so it’s fine to fly a kite, they don’t mind. In fact, Mordor is thriving on its current tourist trade, I hear. 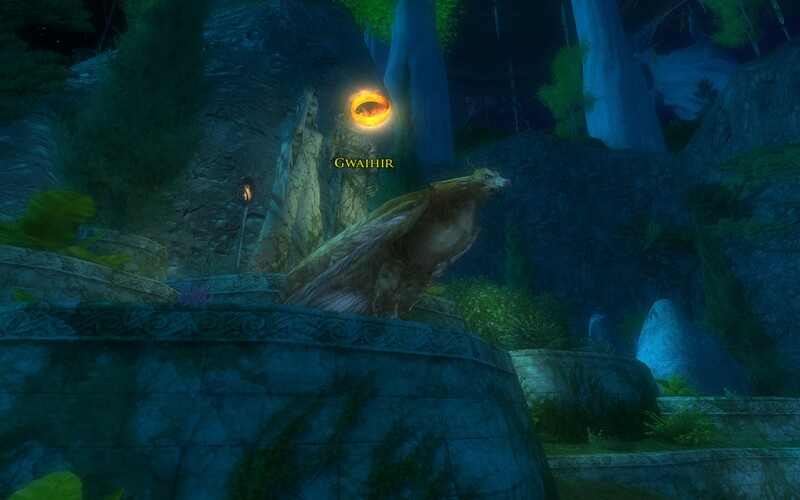 With my main Gondorian alt is the chicken I told you about way back in the Rivendell segment. You can be sure I locked the clickable item so I didn’t accidentally sell or destroy it. And you thought we were done. The following series of screenshots don’t really fit in the landscape per se and are mostly curiosities. 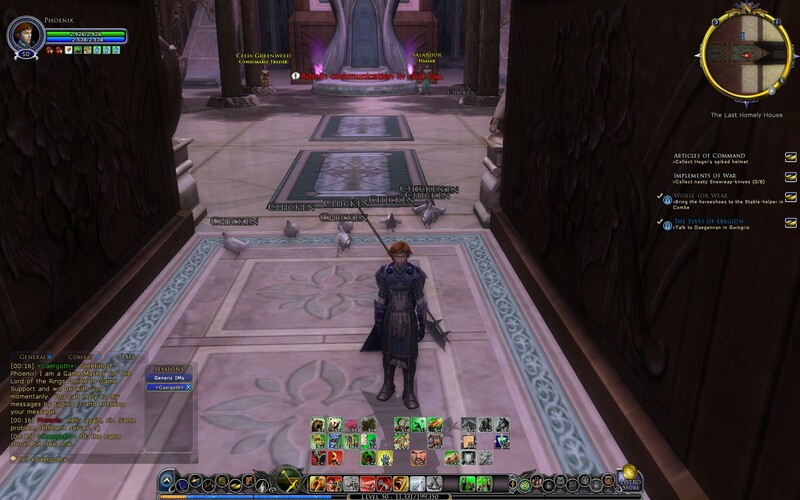 Here you find my account a very long time ago, in November of 2007 in fact. The UI was very simplified versus what it is now with both characters and buttons for choices in the same panel unlike the current UI. Instead of automatically alphabetizing your alts like it does now, it listed them in order of creation. You might also notice that my character’s pose is different from what it is now when you preview a character on the select screen. Female characters in particular had their animations changed over the years, with lady hobbits getting two passes due to player feedback. Three years later, by the Siege of Mirkwood expansion, character poses had gotten an update. Some liked it, some hated it, I think my elf-ladies run weird to this day. However, the UI itself was the same on the character select screen other than a couple of tweaks hither and yonder. 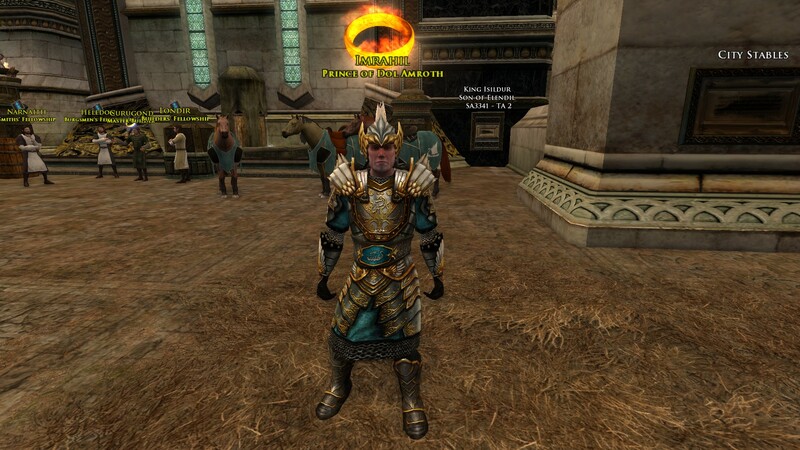 I’m also happy to know that that exact set of gear from questing in Angmar is one of my go-to outfits on that very same character, thanks to the cosmetic outfits system that we didn’t have when the game launched. Speaking of things that weren’t available when the game launched, this is a shot from the very brief introduction instance for Beornings. 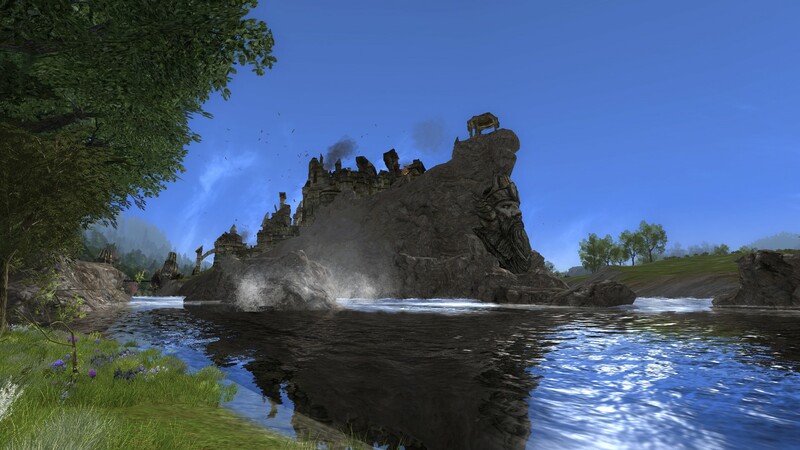 Added in Update 15 just three years ago, the singular race/class allowed us to glimpse the Carrock from a distance, although some players were disappointed you couldn’t visit it properly, and others are disappointed that you can’t go back to that starting area or get to it from Lórien or the Misty Mountains. This is one of the neat little easter eggs you can find in the game. 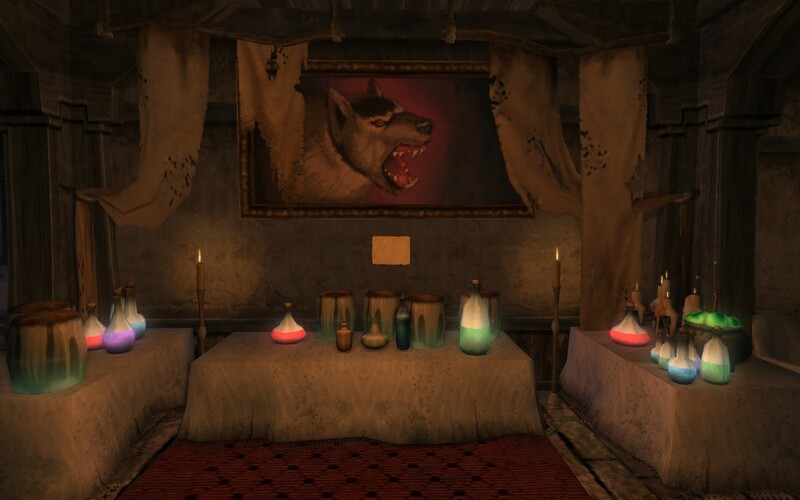 If you go into Lalia’s Market in Bree, you can find this crude mirror on the wall. It may be something simple and almost silly, but I was fascinated by the tech that could generate the reflection like that. It is pretty cool, I think. Okay, I want one. While you can only ride it in certain safe places like Bree, the hobby horse ‘mount’ is probably one of the most sought-after mounts in the game. Many congrats to Paxdana for acquiring one. One day whilst in the theatre in Frostbluff, one of my alts got tapped to play the villain in the Mad Baggins play. Here she is sitting calmly while waiting for the show to begin and she gets to start cackling maniacally. This is the time my Gondorian alt was picked to perform as Bilbo in the play. And yes, I brought the chicken with me. The play is fun and I would have preferred showing you a screenshot of the two critics on the balcony who are a direct homage to the Muppets’ Statler and Waldorf, but alas, the only decent screenshot I had featured another player with an inappropriate name. Do you want to build a snowman? Well, in the Yule Festival, you can. While you’re sorting out the issues between crooked mayor versus the underpaid workers, you can also help a guy build snowmen. Here’s a fun little bug that I hope Standing Stone never fixes. 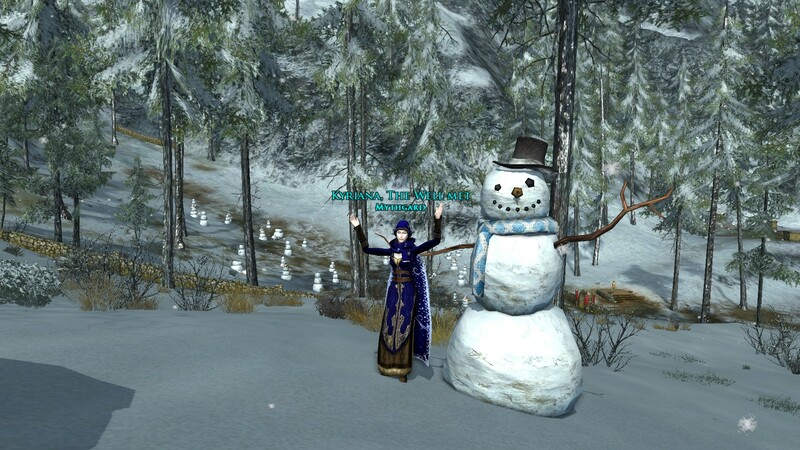 If you build your snowman using the pile of snow closest to the snowball fight field, it builds this gigantic snowman. Hurray! You know how I love Session Play. 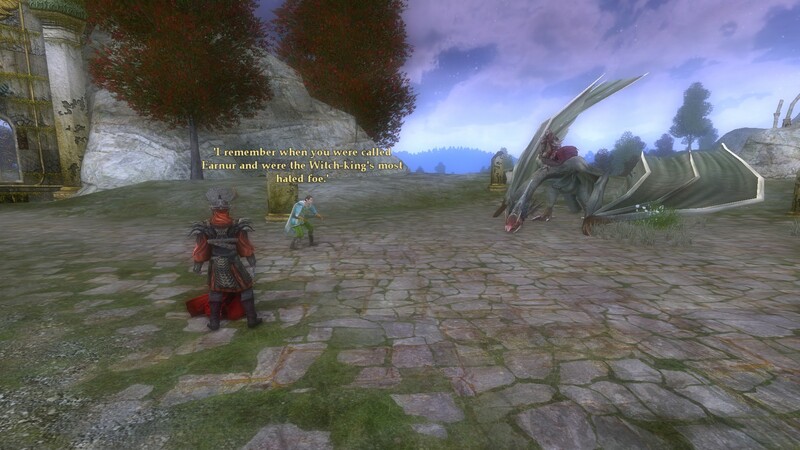 Well, in LotRO, you can also play as a chicken. 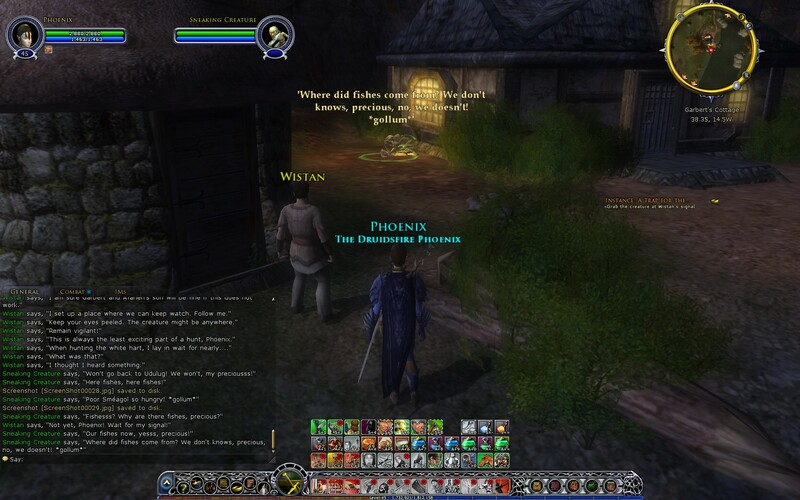 Any player can do a few series of quests at Sandson’s Farm in the Shire and unlock unlimited roaming as a level 1 chicken. If you roam too far, however, you run the risk of being killed by mobs. Still, there are certain achievements in the game relating to chicken play. 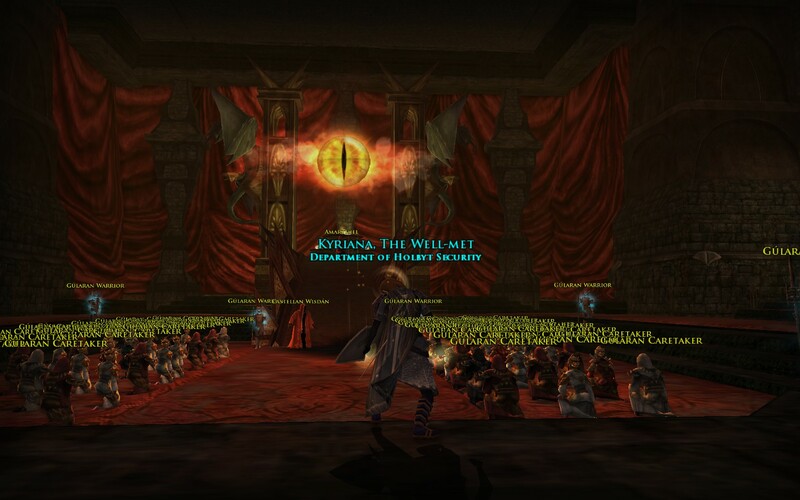 This screenie was taken after Professor Jay Clayton challenged the students of his Coursera class on Remediation of Lord of the Rings, saying he didn’t expect anyone to be able to solo the chicken run to Rivendell. 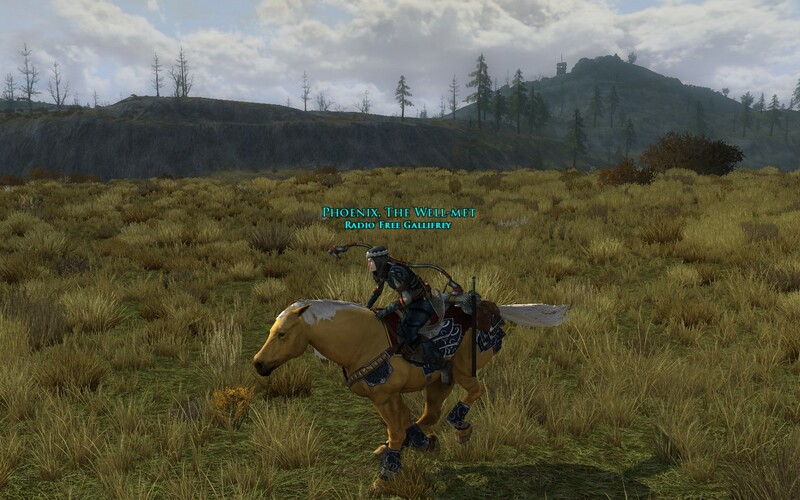 While I had a few scares in the High Moors close to Imladris, I’m happy to report I made it so I could hang out with Roheryn, Aragorn’s favorite horse. 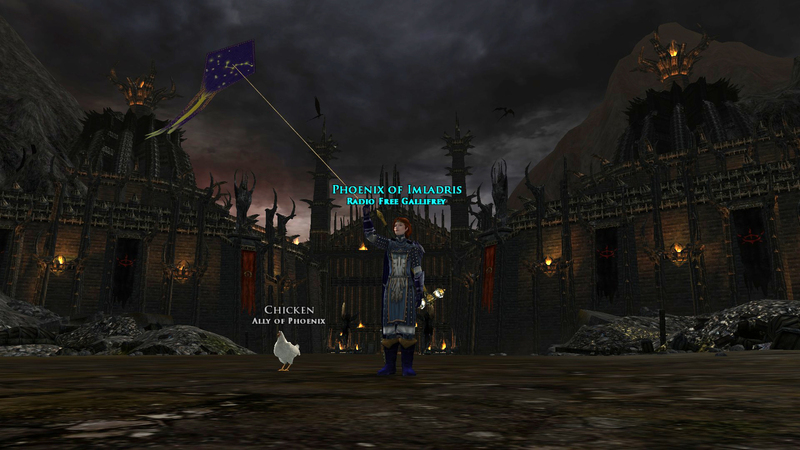 While the deeds associated with chicken play end after traveling to places mostly associated with the vanilla game, players have taken it upon themselves to get chickens safely to places such as Isengard, and the rather intrepid Arathaert was probably the first player to get one to Minas Tirith through the Paths of the Dead. 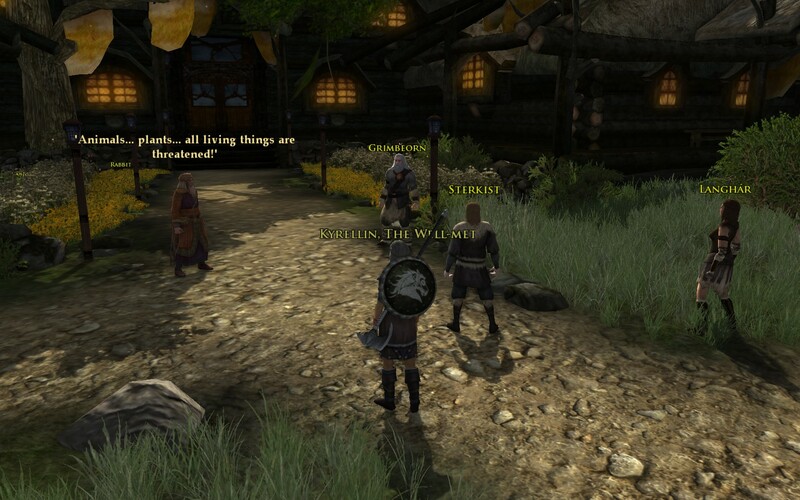 In my interview with Standing Stone back in January, I asked about whether we could get a chicken from the Shire to the Crack of Doom, and I’m going to hold our community manager Cordovan to his word that he will be disappointed if this isn’t made possible. 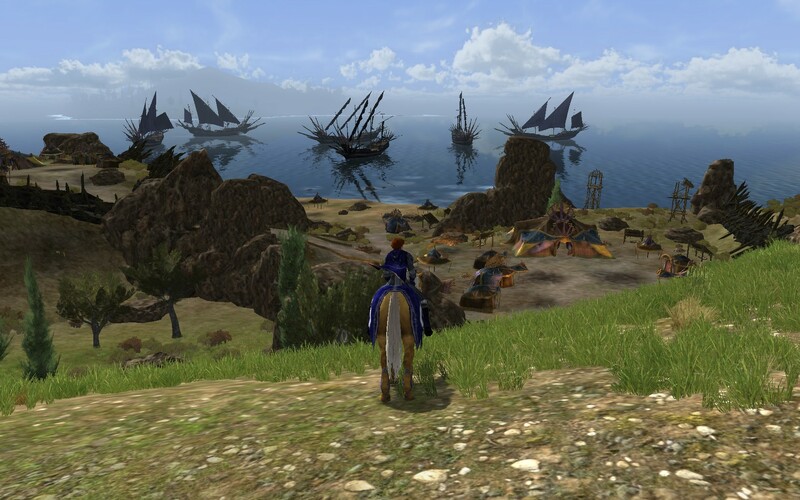 While chicken play is available to all players, there is another form of free roaming animal gameplay available, but only to players who had preordered the legendary edition of the Riders of Rohan expansion in 2012. 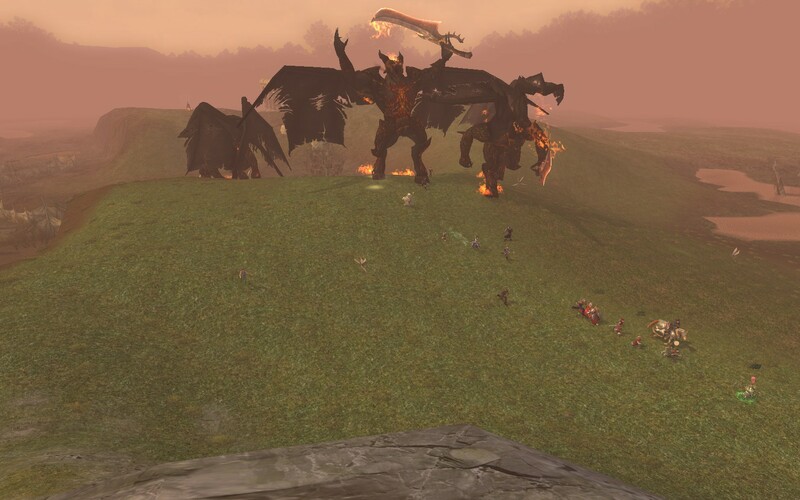 It was intended as a kind of introduction to the upcoming mounted combat system, although some of the skills available for the quests and dailies never went live for actual mounted combat once the expansion launched. The questline tells the story of this warsteed that randomly appears in Combe and needs to be tended to. Eventually, you find out he’s one of the Mearas, Shadowfax’s kin. Players have asked for it to be made available again over the years since, but the studio’s policy on the matter was that it was an exclusive for that timeframe, so it’s unlikely that it will become available for purchase. Speaking of things that are hard to find, I present you with some swag. On the left is a cloak that was given out to players at the fifth-year anniversary meetup at PAX East in Boston. 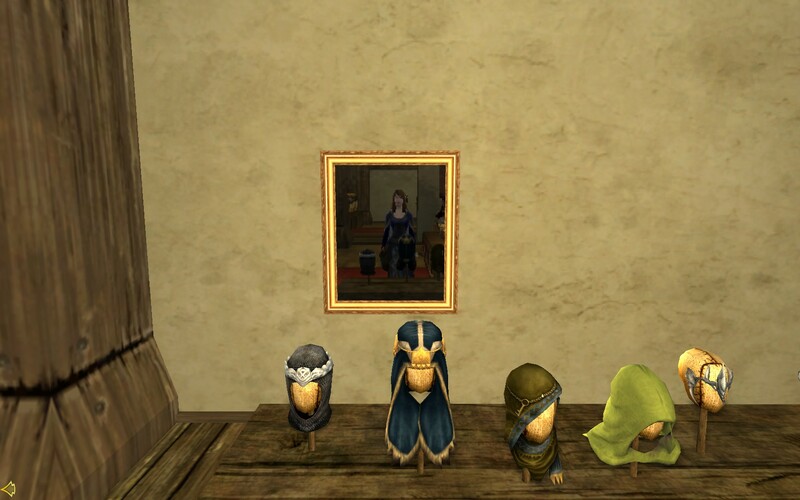 You can readily obtain a fancier in-game version of the same cloak from the LotRO store. To the right is a Riders of Rohan dev shirt, one of the few in the wild, and it’s never been worn. Finally, the White Tree of Gondor is featured on a more recent piece of swag that the company gave out. This one was from another PAX East adventure, probably from 2016, and is the current piece of swag that the streamers are getting these days to either hand out or as a thank you for streaming. 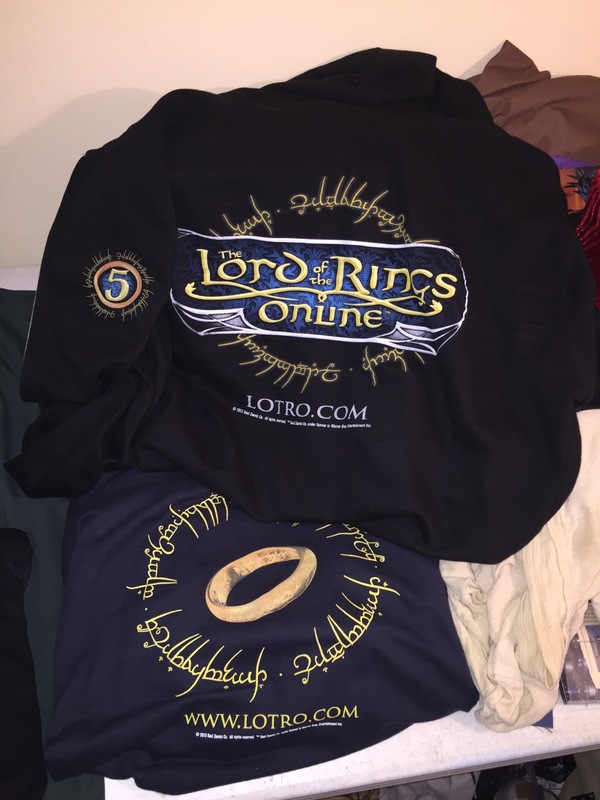 Here we have two LotRO hoodies. 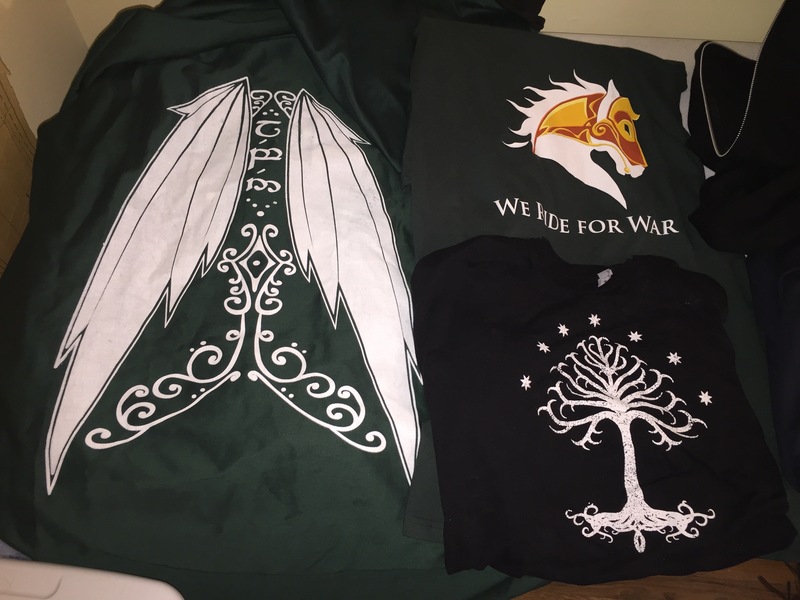 I honestly don’t remember where the one on the bottom came from, but it might be from before the 5th-year anniversary, because the upper hoodie came from the last time LotRO was featured at the Turbine booth on the PAX East show floor and I believe was the last hoodie they made to give out to players. A funny story about the 5th-year one, however. I normally wear a different game’s hoodie when I go grocery shopping every week. The one time I wore that one instead, a guy and his wife came up to me and asked if I played. Come to find out, they were long-time players and also fans of former Turbine employee Seraphina ‘Celestrata’ Brennan from her work in gaming press. It was a bit surreal but also pretty cool to find fellow players randomly like that. 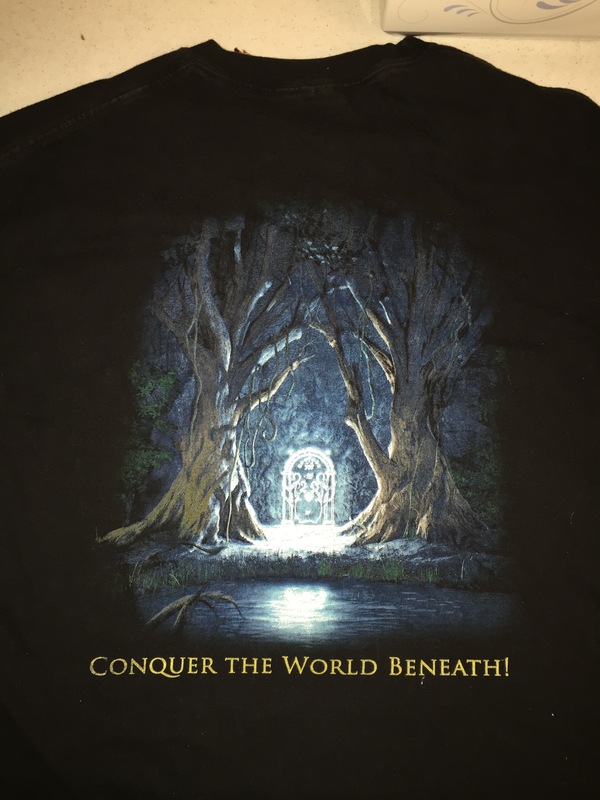 One of the earliest pieces of swag I acquired aside from the collector’s editions of the base game and the first expansion was this Mines of Moria t-shirt. I remember it was the first year I wanted to go to PAX East but couldn’t go for whatever reason, and a friend I’d known since the mid-90s was going to pick up swag for my half(ling) sister, who was a friend of former community manager Sapience, so said friend was willing to pick up my swag from him too. Awesome friend, yes? While we have ourselves a fine and upstanding community manager in the form of Jerry ‘Cordovan’ Snook these days, I’d like to acknowledge the work put into our community by his predecessors over the past decade. 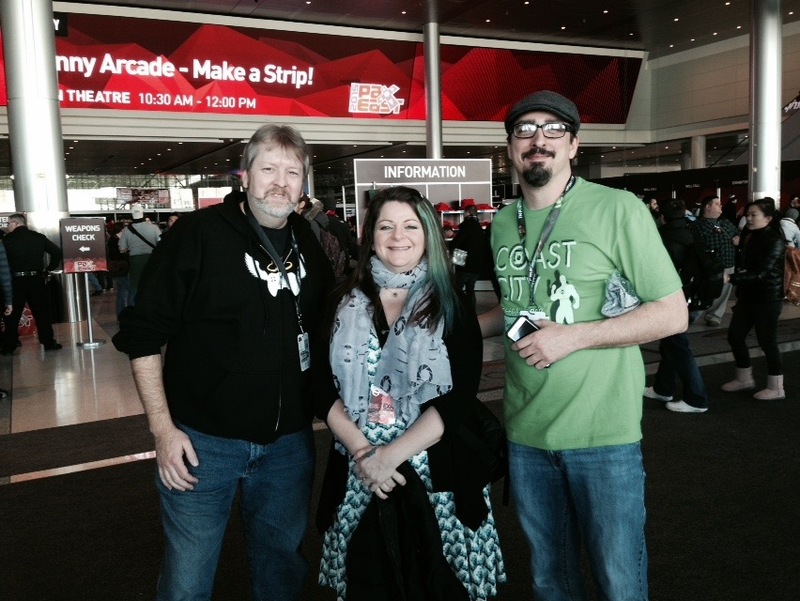 I was fortunate enough to catch a photo with Rick ‘Sapience’ Heaton, Meghan ‘Patience’ Jenks, and Andy ‘Frelorn’ Cataldo at PAX East 2015. While each has moved on from the hotseat that is wrangling our sometimes fractious community, they’ve done more for us and the game than most of us truly realize, and each has left their mark on the community. One of the coolest things that has come out of the community these past few years is the rise of the streamers. 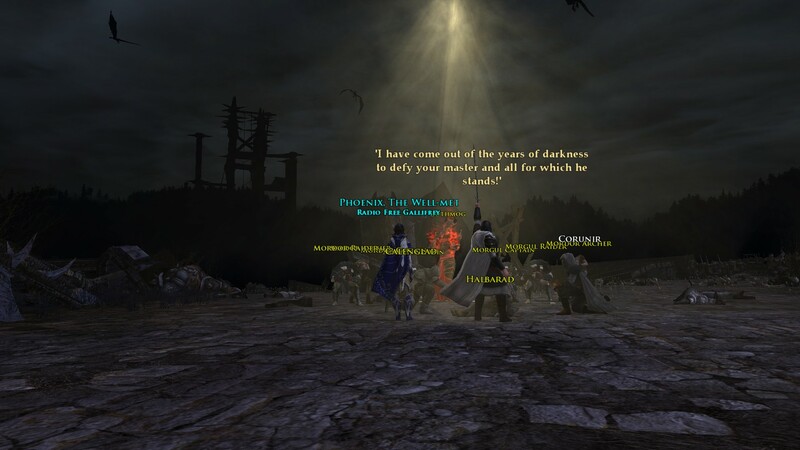 Started as a joke during one of Sapience’s random gameplay streams on the official LotRO channel, each of the then 29 servers was given the chance to shepherd one of his level 10 hobbits to level 75 Isengard. The server that got him there safely in the shortest amount of time was awarded bragging rights and a festival of their choosing being turned on for a week. For the record, Eldar is the server that one the contest. However, this particular screenshot is more to demonstrate something that changed in the game. Just three years ago when this was taken, those huge logs used as footbridges in various places in the game were unshaved, so sometimes it was hard to see if you were close to the edge. Now, all these sorts of logs have smoother and shaved tops so you can see where you’re going. Whether you rubber-band off the bridge is another question entirely. Here’s the destination for the hobbit runs that Sapience did. 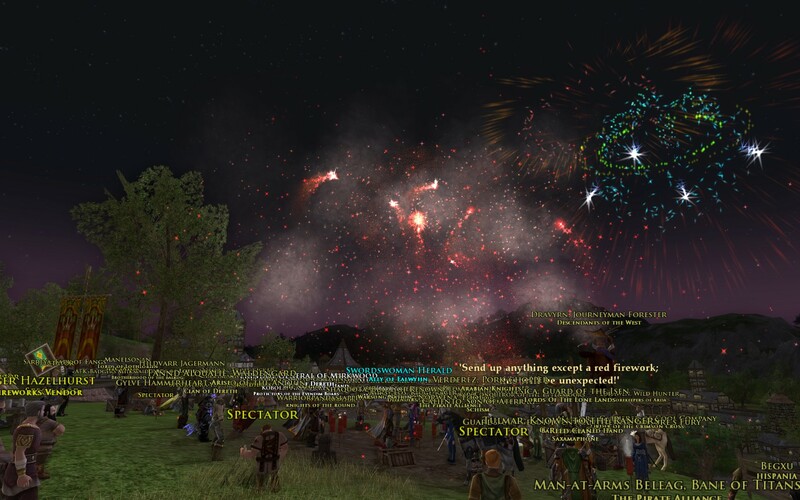 Players would gather for screenshots after every successful run and fire off emotes and shoot fireworks. One of the bigger challenges in doing these runs was the pair of war-trolls at the gates of Isengard. As you can see, a lot of players got in on these runs, and not all of them were on or above level to help protect the lowbies. 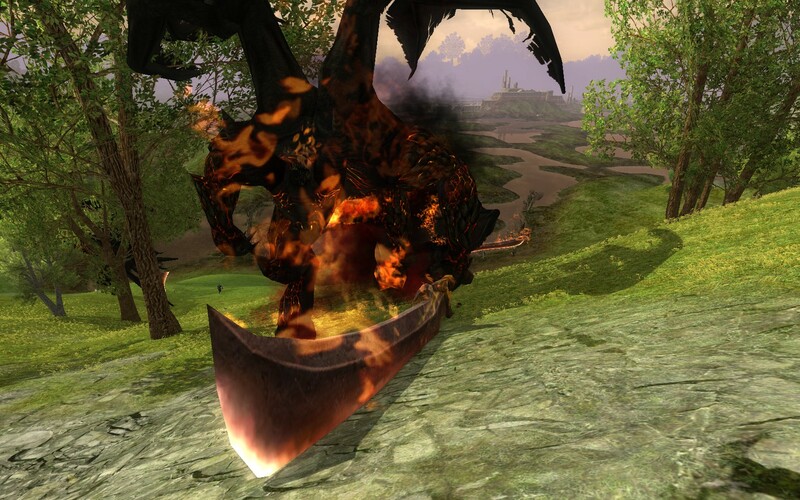 During the months that the hobbit runs were going, players who participated asked Turbine to let us do one on Bullroarer so that someone could spawn raid bosses in lowbie areas to see if we could get past them and still get the hobbit to Isengard. Well, no, we didn’t. In fact, the furthest we got was one time into the Trollshaws and then the subsequent attempt got us stuck in the Midgewater Marshes. It’s my understanding via Sapience that +Raina was the lady spawning the various bosses and cackling merrily as she did so. 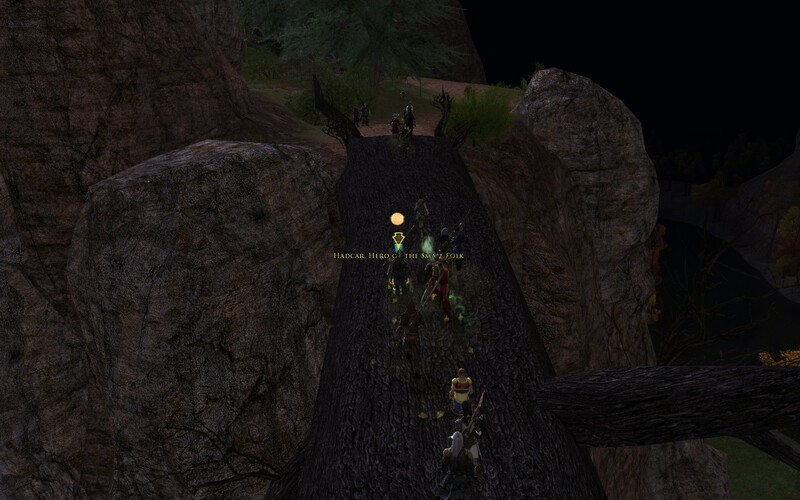 Balrogs only do a conga line when they’re chasing players near the Midgewater Marshes along with Nurzum. This was about the point in the whole silly event where I decided to sit back and take screenshots. Perhaps my favorite screenshot of that event was this one, because it’s a perfect example of the ‘run away!’ tactic from Monty Python and the Holy Grail. And this is a long-distance shot of similar behavior as the Balrogs chase players toward the Weather Hills. They never de-aggroed, so they followed us all over the map. And this is where I got just a little bit too close to one of the Balrogs. I like this shot because of the perspective of its weapon. Actually, I don’t think it killed me, because I remember surviving the event. Well, that part of it. I died a few times earlier before I stayed out of the way. During the various hobbit runs, a bunch of players started lying down near the Prancing Pony milestone when they were killed in dangerous areas and bounced back here. A lot of people wanted to participate as lowbies because Sapience was doing these runs on every server and most folks didn’t have higher-level characters on each one. So, if you were a level 10 character and got killed in, say, the Bonevales, you’d get ported back to your milestone. If Sapience’s hobbit got killed along the way, he wound up here as well and the run would have to start over with the timer still going. Throughout the hobbit runs, there was a core group of players who hung out in Twitch chat, and a bunch of us eventually formed a kinship on Landroval because we got used to each other’s company. This is where the Department of Holbyt Security came from. 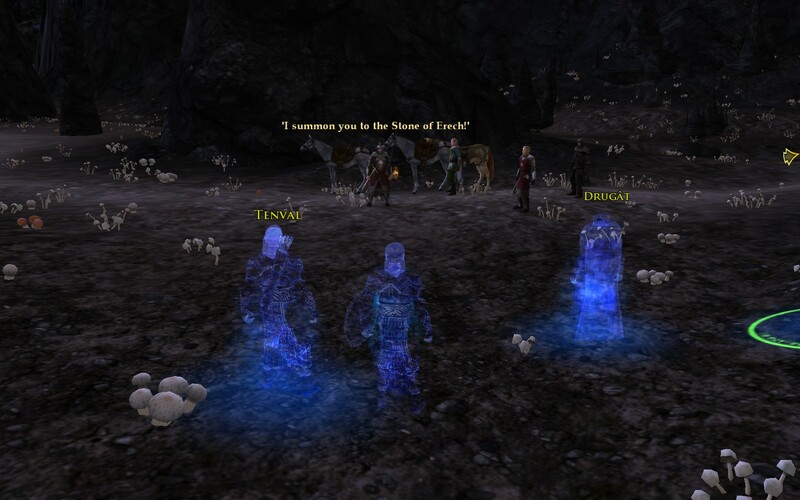 I’m very grateful to LotRO for having this spontaneous series of silly runs to Isengard and later through Moria with a level 50 dwarf, because I met and became friends with some stellar players of the game that I would not have otherwise met. 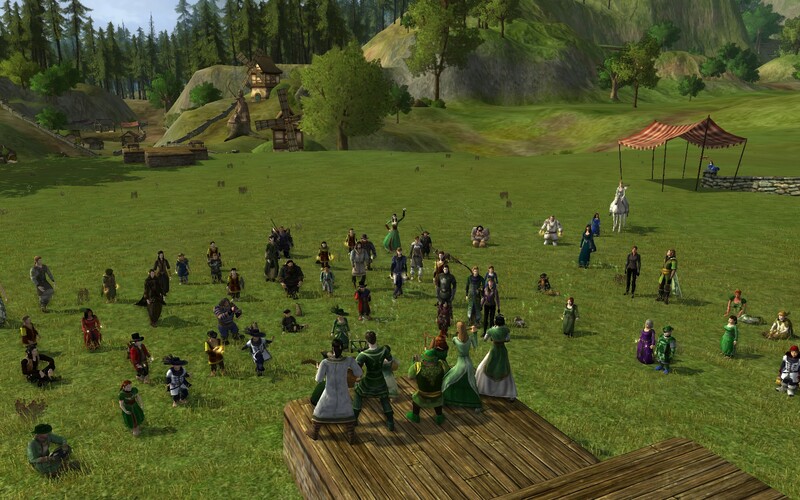 The DHS has expanded into putting on concerts and has performed at Weatherstock, and two of our kinmates may very well have fallen in love after having met via these events. Every year now on or near the kin’s anniversary, we invite Sapience back to go running once more to Isengard with us or to putter around in Moria with his dwarf. This is a screenshot of one of the last runs we did with him, but there may be another coming up in a few months as the anniversary rolls around again. 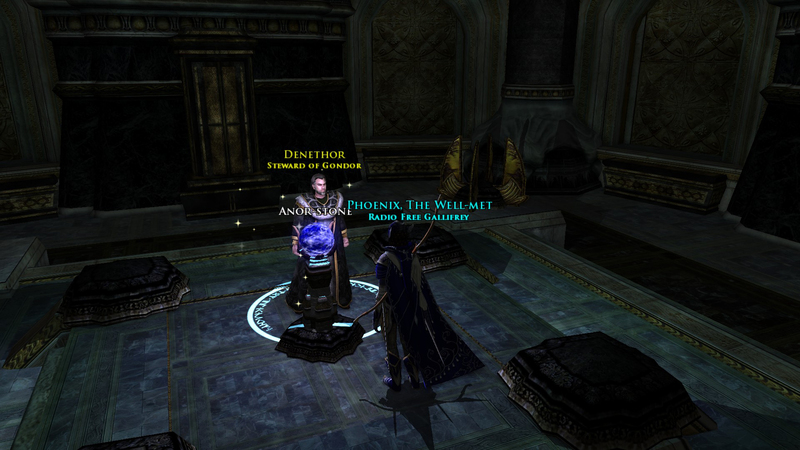 I have to say that one of the coolest things about LotRO is the fact that academics use it as part of their classes. One of my fellow streamers on the official channel, Professor Corey Olsen, has formed a kinship based on his real life online university and teaches Lord of the Rings on a weekly basis in-game and via Twitch. This shot is from one of his lectures two years ago at the Forsaken Inn. 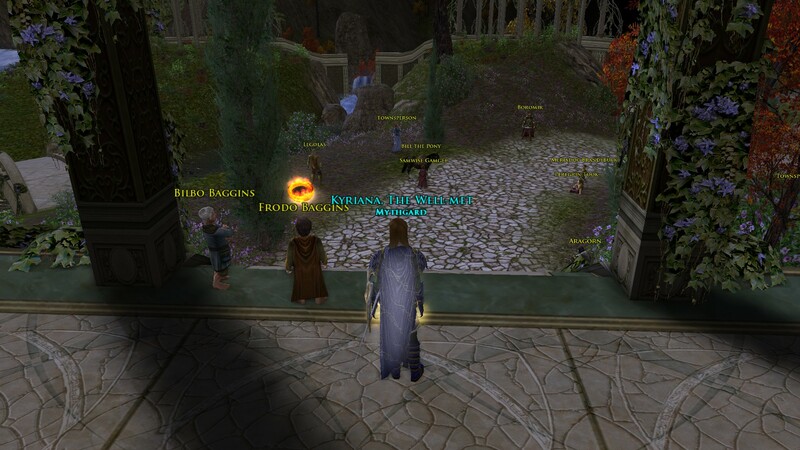 When the Professor is streaming his lectures, he often takes us to the places he’s discussing, and this particular lecture involved the hobbits’ flight to Weathertop, comparing the in-game venue with the original text. Here’s the tail end of the Weathertop visit with the mountain in the background. The Professor’s lectures in-game actually get a lot more people than this these days, as you’ll see soon. 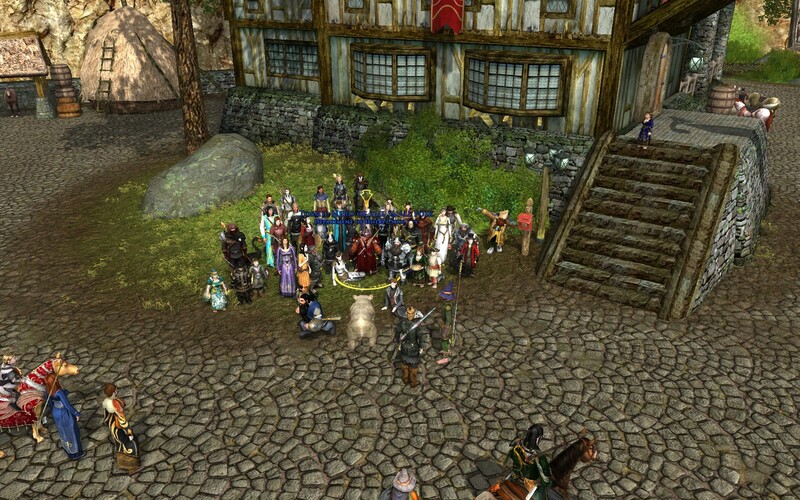 One of the things that sets LotRO apart from most other AAA MMOs is the fact you can play music in-game. There’s been a whole subculture in the community of bands and performers, with performances going on every server every week at some point or other. 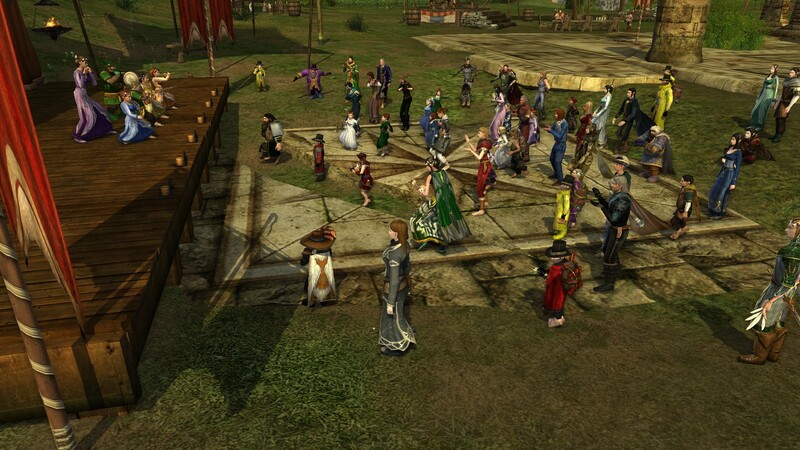 Here’s a performance being conducted at the Bree Festival Stage, a venue that was added to the game in the past few years as a reaction to the popularity of the music performances. 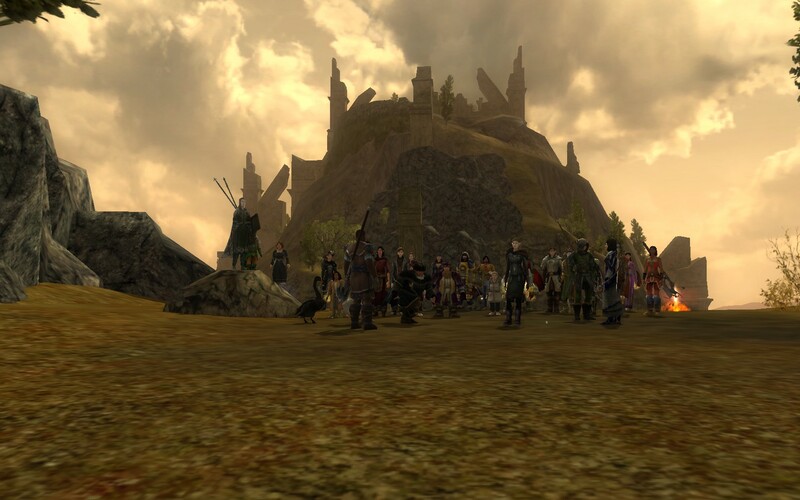 Every year in July, the Lonely Mountain Band kinship hosts Weatherstock here on the summit of Weathertop. 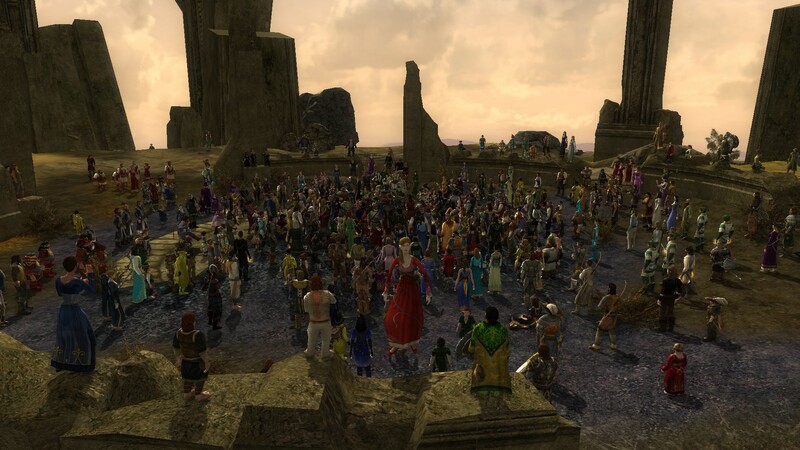 Bands from across all the servers compete for one of the ten performance slots, with members of the LMB ensuring the safety of lowbies traveling through the Lone Lands, the famous yellow-clothed vendors offering free goodies to partake, and generally a server crash or three as the event goes on. As you can see, there are a lot of people here, and between Twitch viewers and in-game viewers, the attendance generally hits somewhere close to a thousand. The quality of LMB’s event running and the passion its fans have is the direct reason why LMB won the 2013 Dragon Slayer award for Best Gaming Team/Guild or Clan at DragonCon. 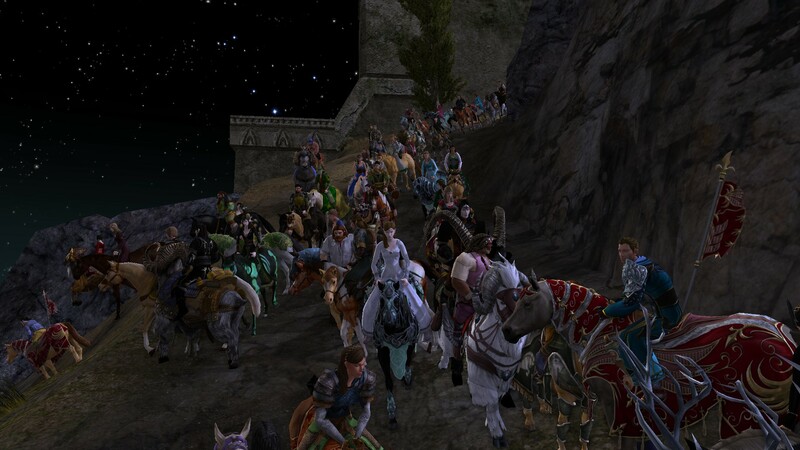 The traditional end of Weatherstock involves everyone mounting up and RP-riding to Bree. It’s pretty cool seeing everyone trot out (get it?) their favorite mounts and cosmetic outfits. It also takes forever to make the journey at that speed. Bree’s Festival Grounds wasn’t the only place that got itself a random stage for people to perform. One day, Turbine gave us a stage here in the Shire, and people use it to throw concerts. I love it when players listening to the performances manage to sync up their dance emotes. 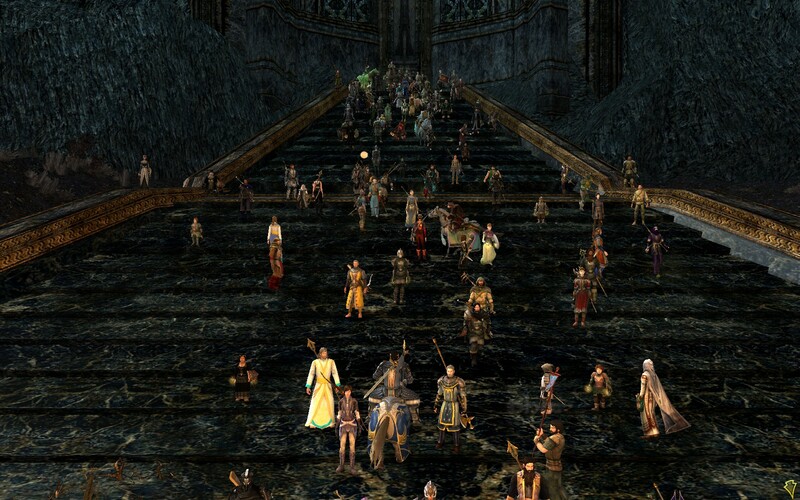 Elvish line dancing isn’t a thing to miss. Back in 2015, Turbine opened up Bullroarer so they could conduct some stress tests of the new larger server tech that would eventually be used for the servers we know and enjoy today. 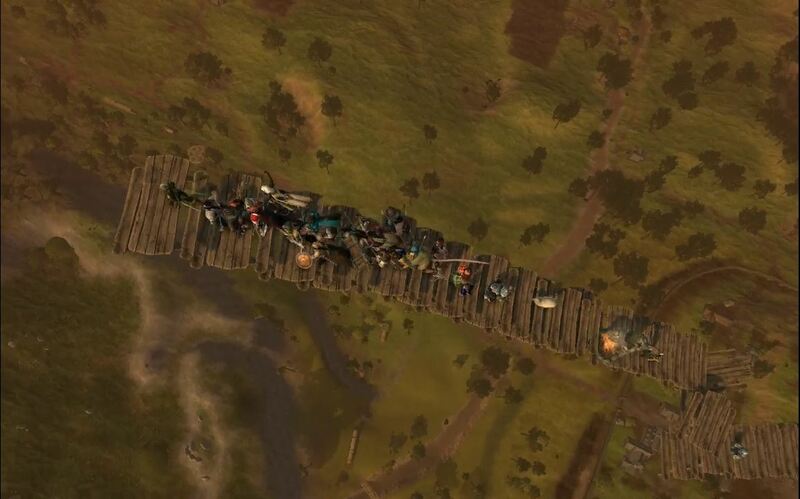 A lovely dev who went by the handle of +Arbor took it upon herself to start stacking picnic tables in a rough staircase going up away from the West Gate of Bree while other devs were dropping various raid bosses or monsters in Bree itself. I wound up streaming it and forming a raid to get people into the correct layer. This particular shot is from nearly the end of the day, and we’re so far up. I remember being fascinated by how the game world drew itself around us as we got further away, but I also remember how it was triggering my real life fear of heights on stream. +Arbor was very kind and took pity on me and teleported me up to the top once or twice when I fell, but it was rough for awhile. Still, it was a fun event that lasted almost two and a half hours of just climbing up, waiting for her to place more tables and dancing on the top one, and generally hanging out with fellow players. At the end of the stress test, it was time for us all to go. We’re so far above the gamespace that you can’t even see the Bree-fields below us, but we were actually above the Barrow-downs according to the map. As she was getting ready to turn us loose, she’d hit a bunch of us at a time with a nerfbat and we’d fall to our deaths. When she punted my character, I landed on the path at the entrance near the unfortunate traveler that offers you a quest. This very last screenshot is from a recent field trip conducted by Professor Olsen. We’re visiting the Gaffer at Bagshot Row and probably trapessing on his taters. 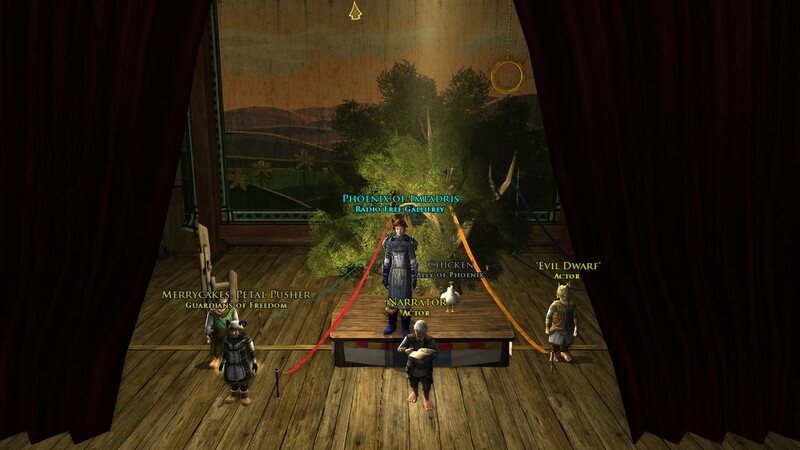 A number of my kinmates both in the DHS and in Mythgard are in this shot, and I’m very grateful to Lord of the Rings Online for introducing me to these fine upstanding gamers and academics and weirdos who love Tolkien as much as I do. I hope that the game lasts for years longer so that the Professor can finish his lecture series doing a close reading of the trilogy, although he might not finish until the Ninth Age, according to some teasing on the part of Made of Lions in the interview I conducted in January. 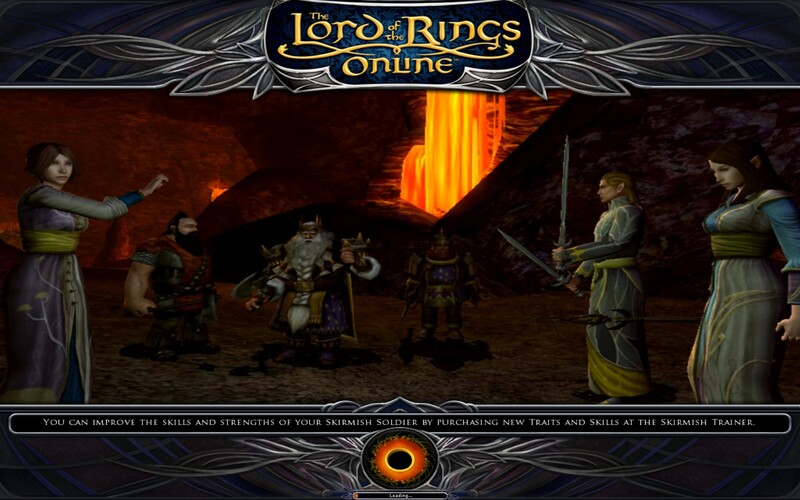 So that’s it, my lengthy retrospective on ten years of Lord of the Rings Online. While the game’s future was in question for a couple of years, I think the upcoming Mordor expansion will continue its current upward trend and we’re going to see more and more new players showing up. It is my distinct privilege to represent the game as a member of the official stream team and show my viewers what I love about it. I’ve made lifelong friends thanks to this game and that’s really the best thing of all. I hope you’ve enjoyed this rather long stroll down memory lane as much as I did digging up the screenshots, taking new ones to replace bad originals, and generally geeking out about just how well Turbine and now Standing Stone have made this game. It’s not perfect, no, but there is no better interpretation of Tolkien’s works in either video game or movie. Yeah, I said it. This is better than Jackson’s movies, and I wouldn’t have it any other way.